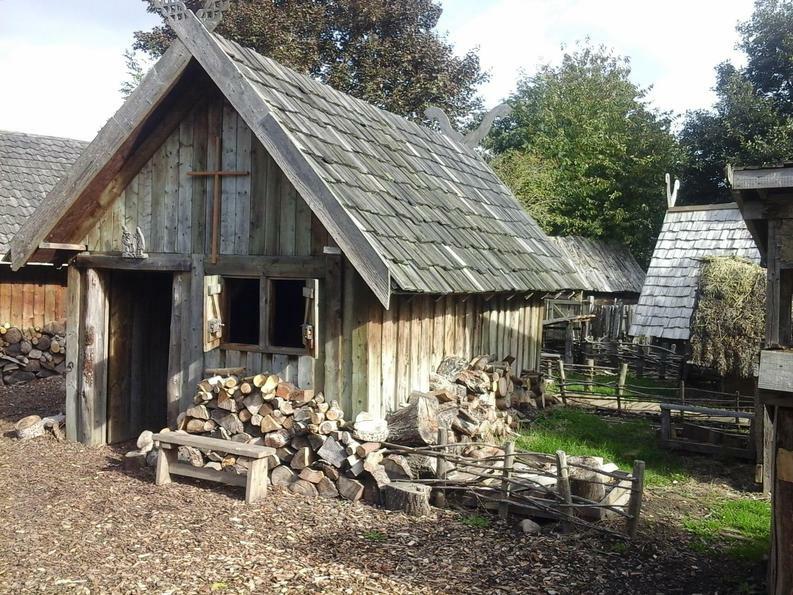 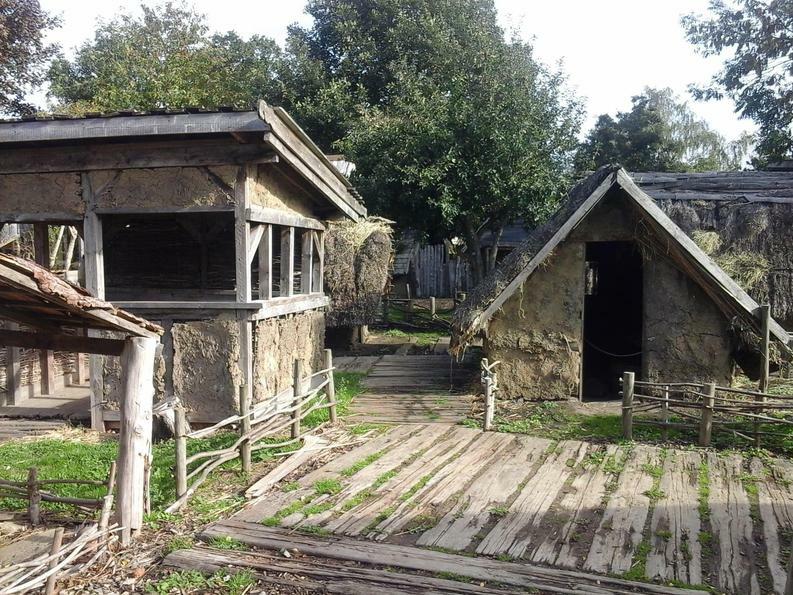 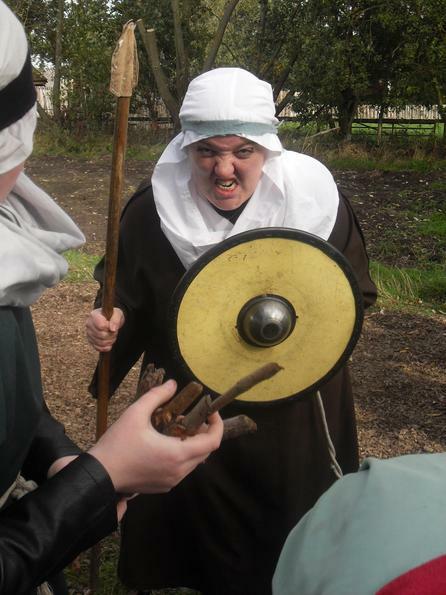 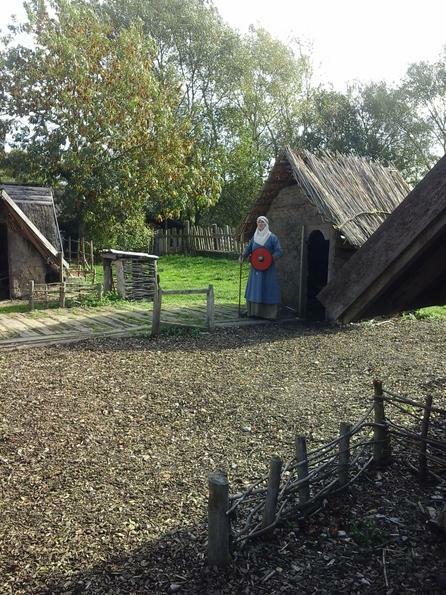 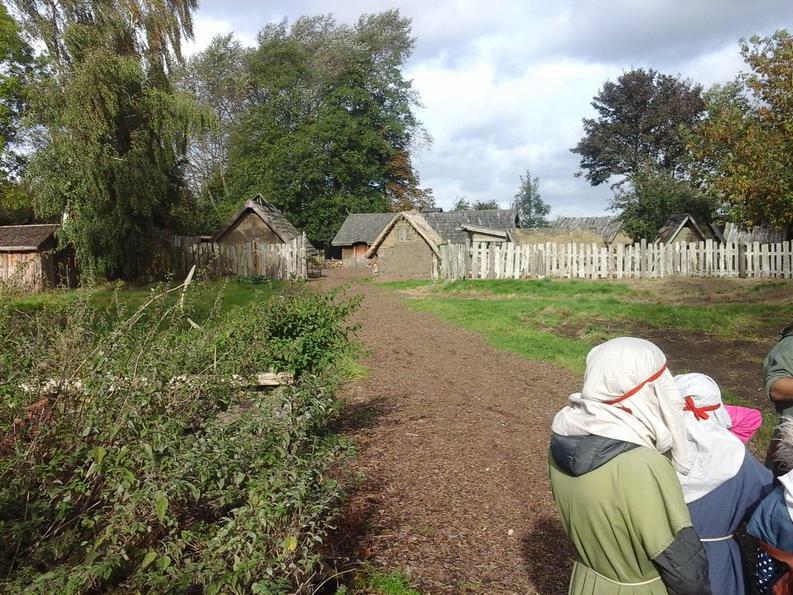 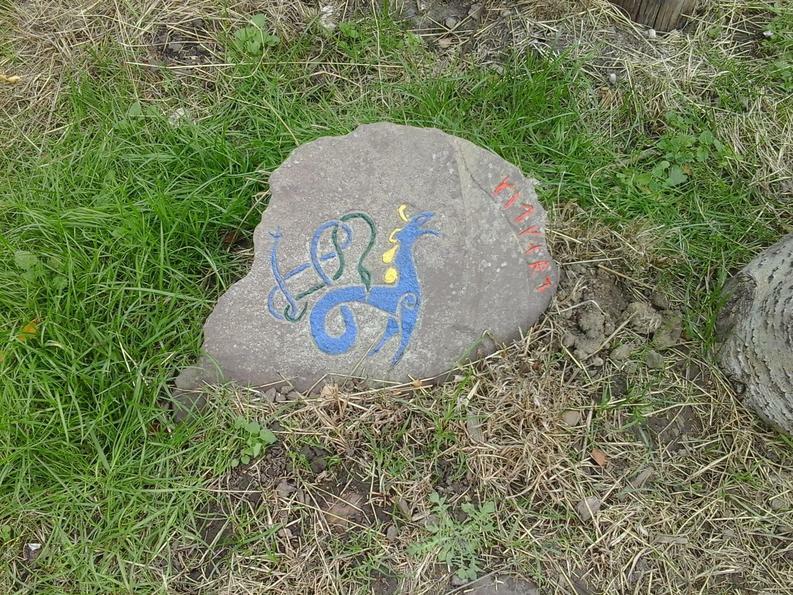 For our Island Invaders topic, we went on a trip to Danelaw Dark Age Village near York. 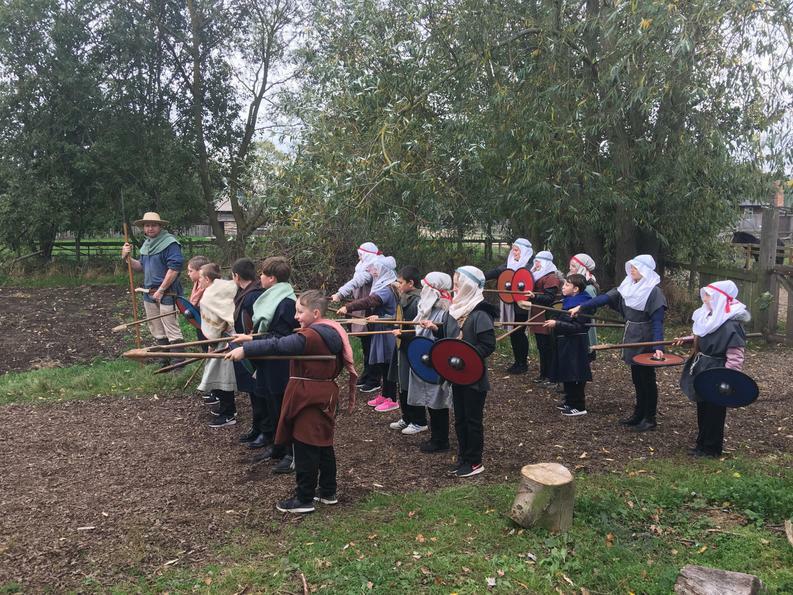 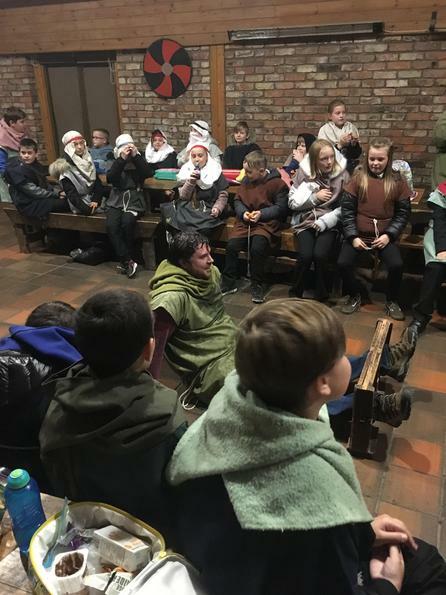 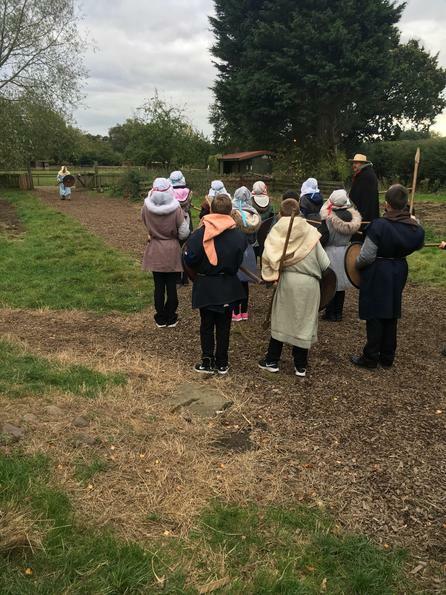 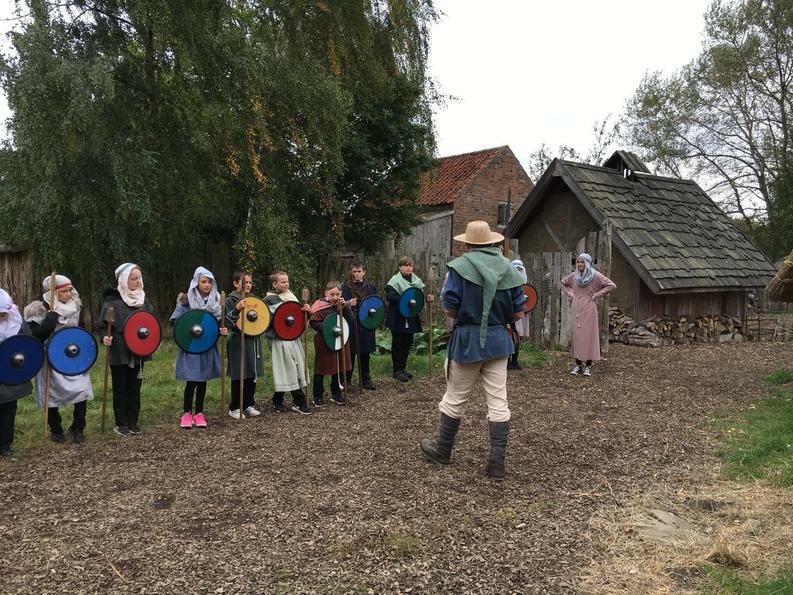 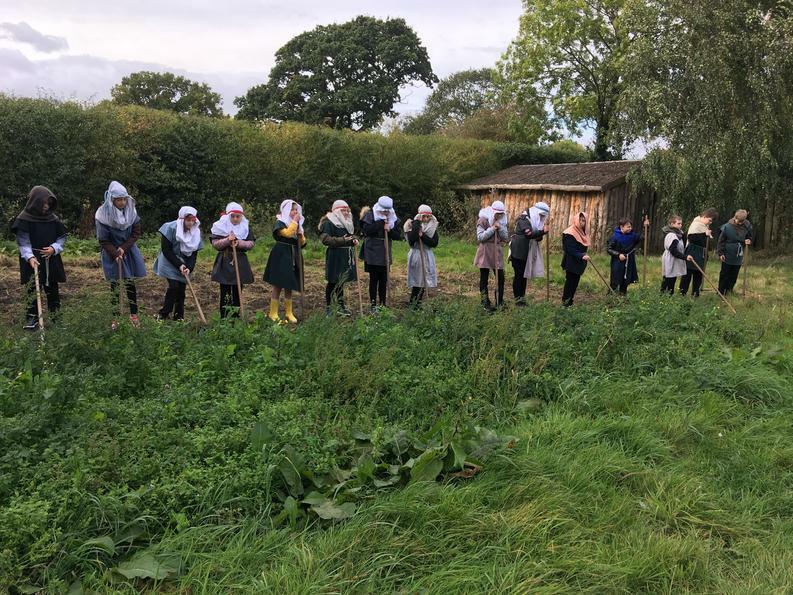 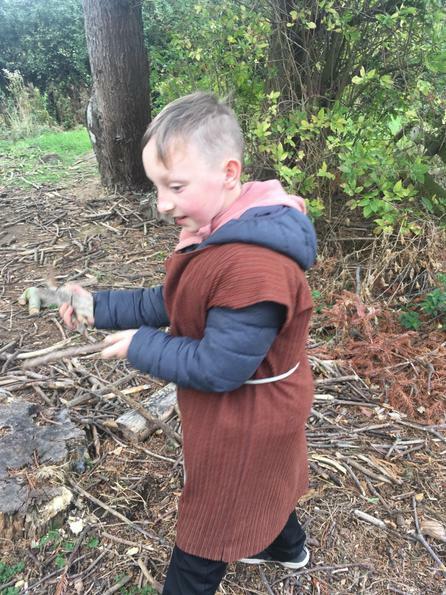 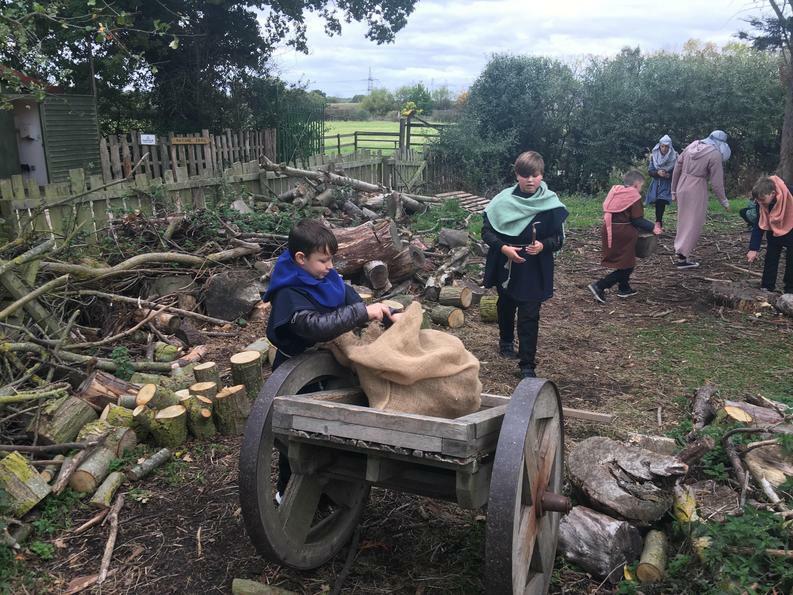 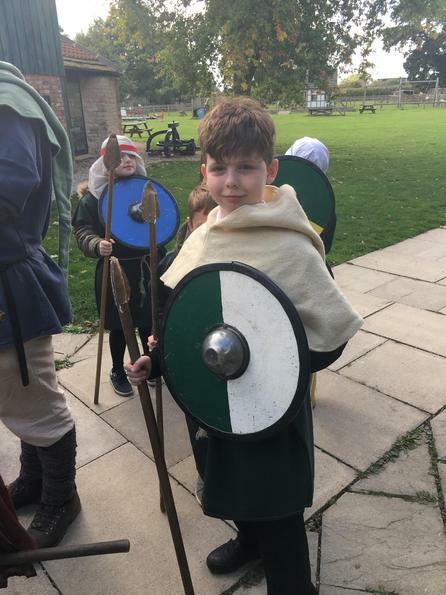 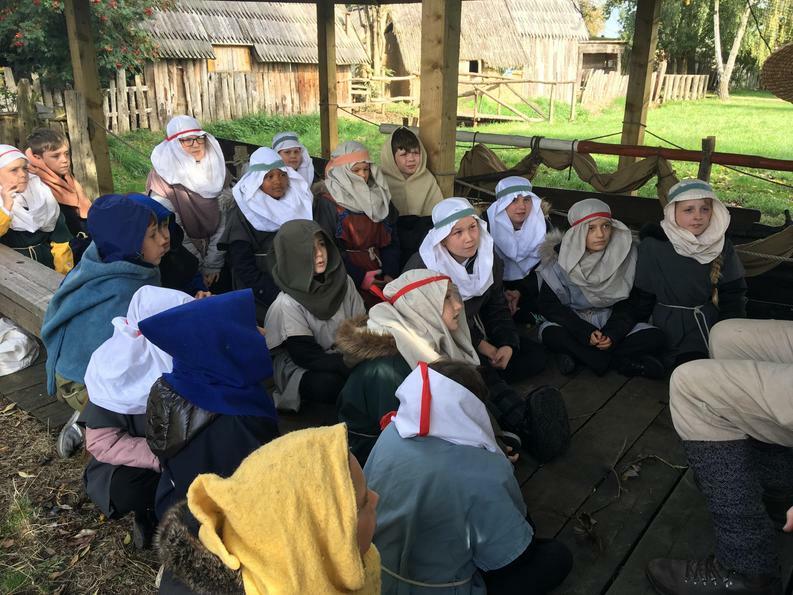 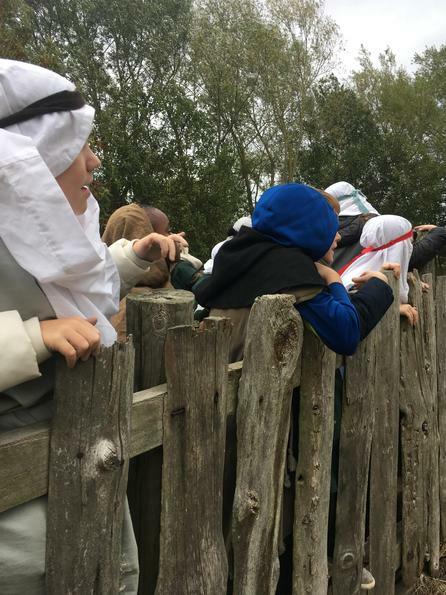 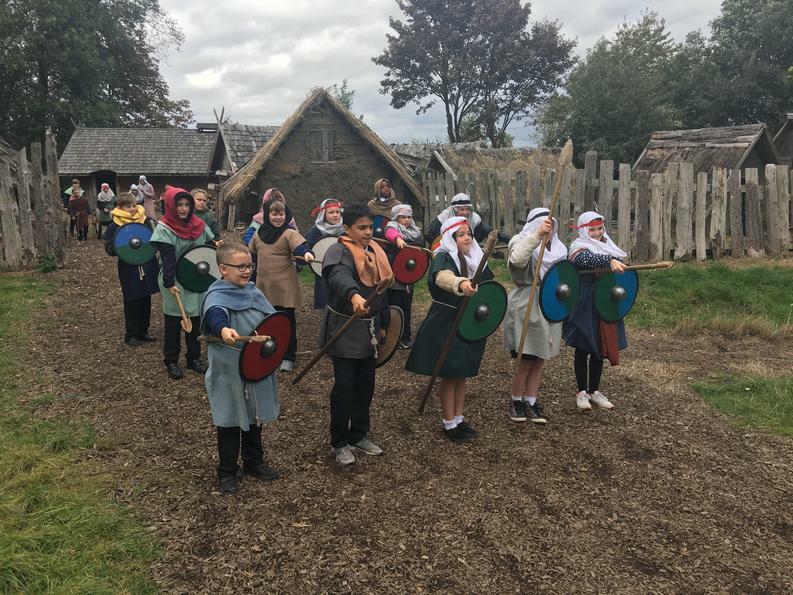 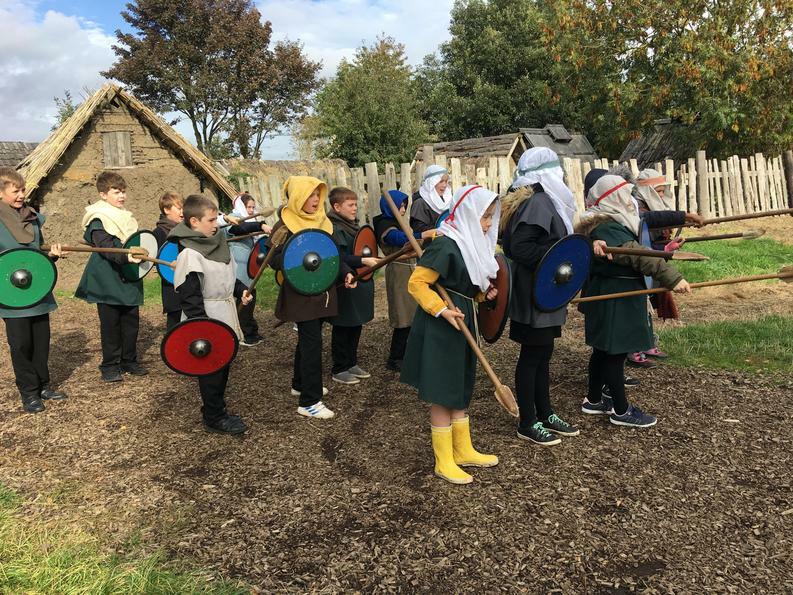 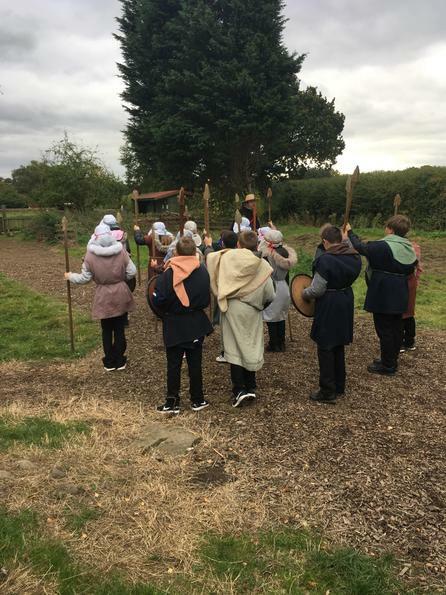 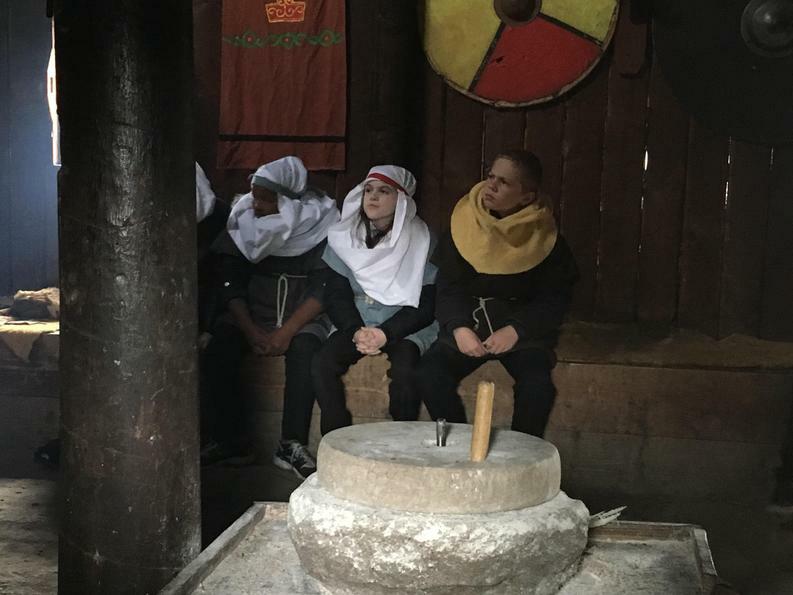 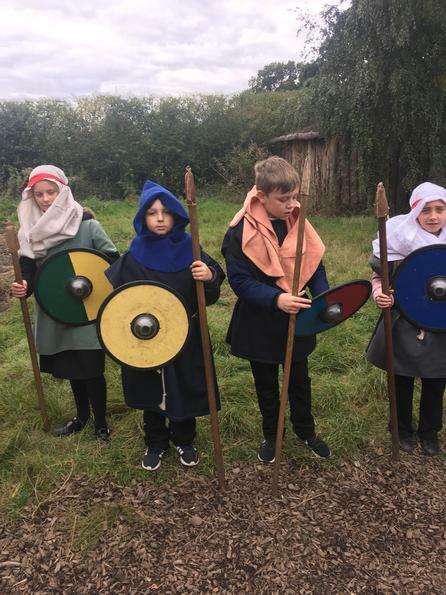 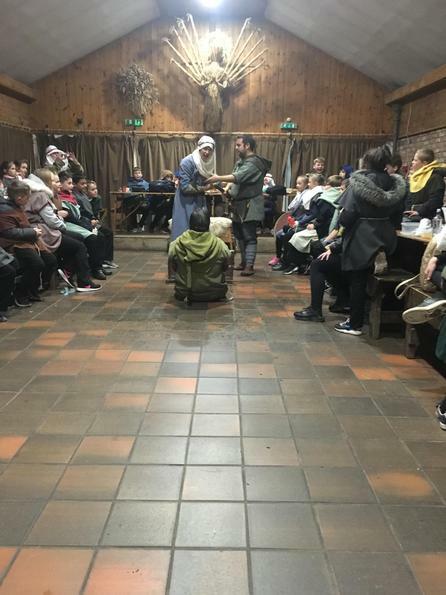 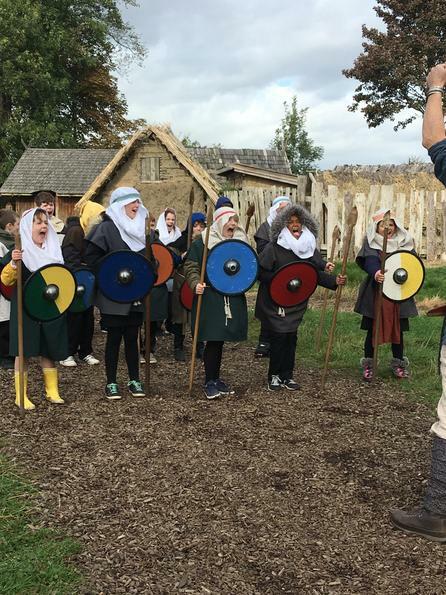 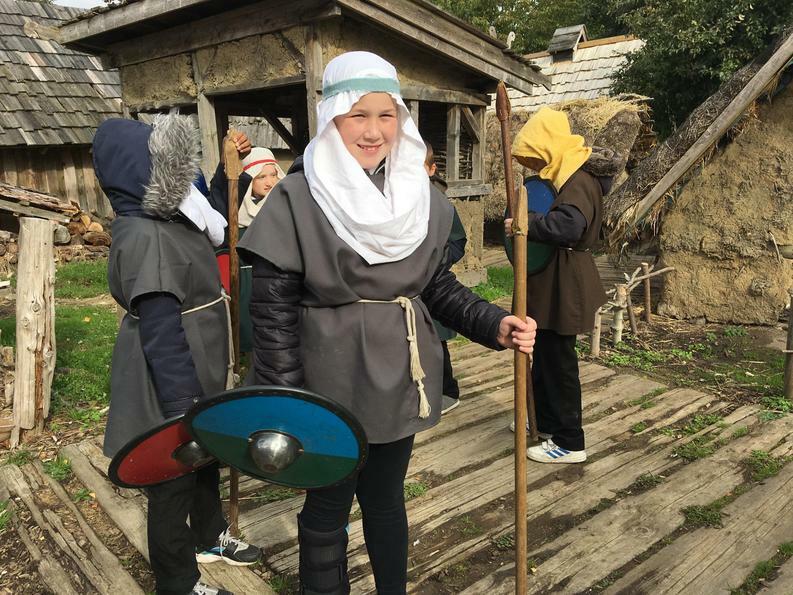 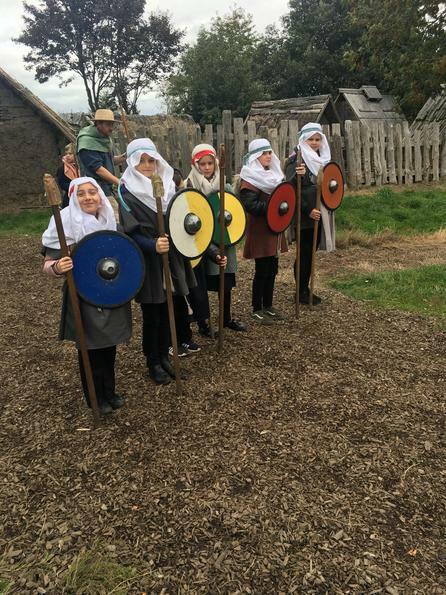 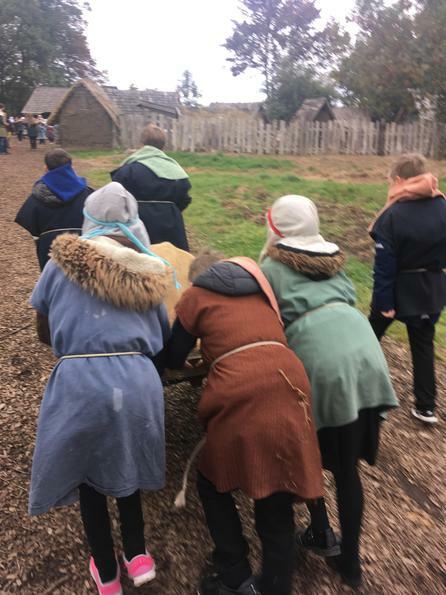 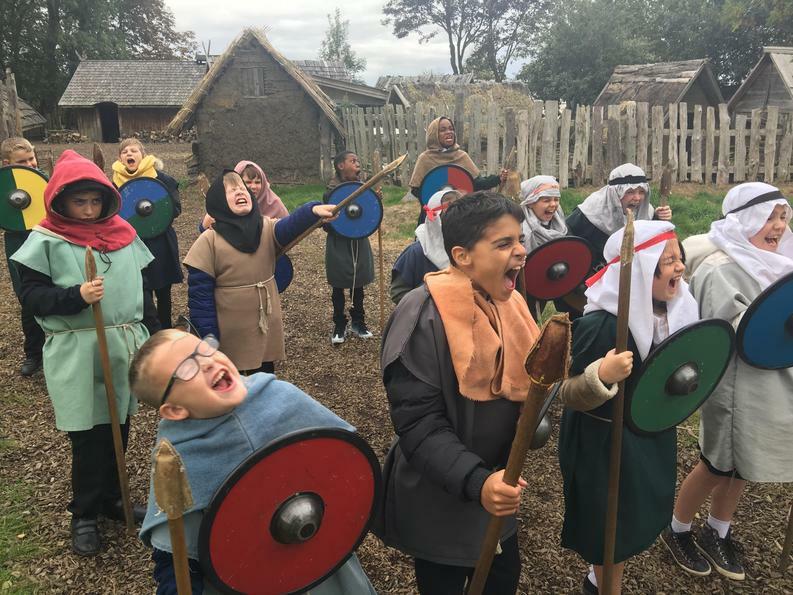 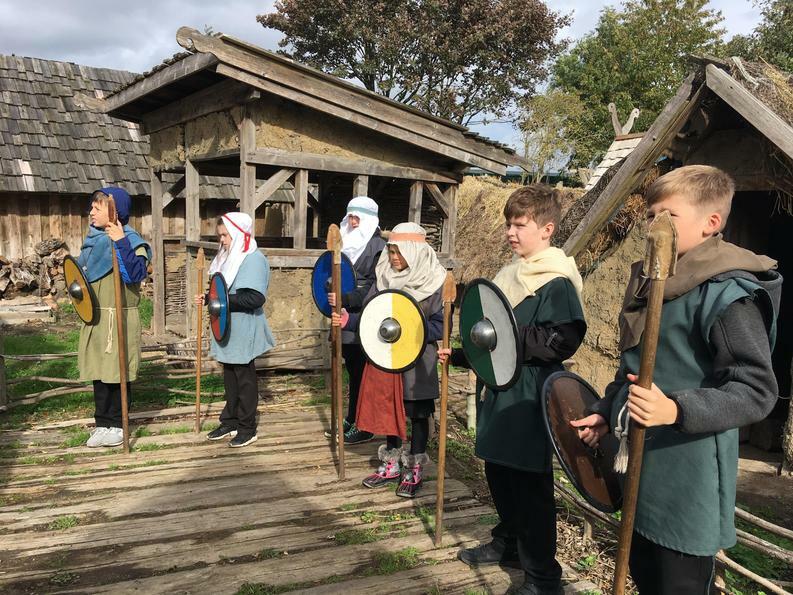 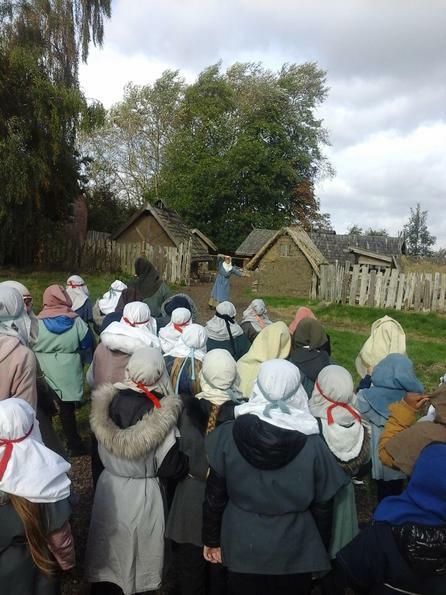 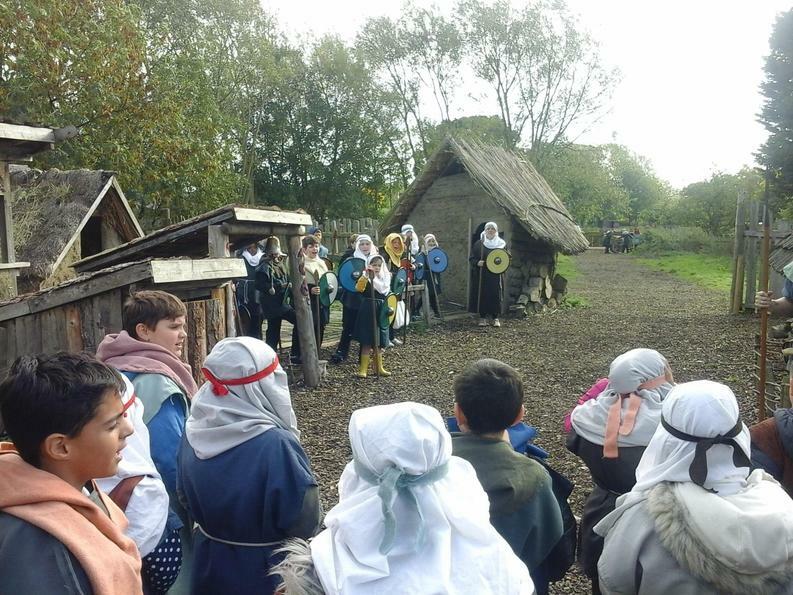 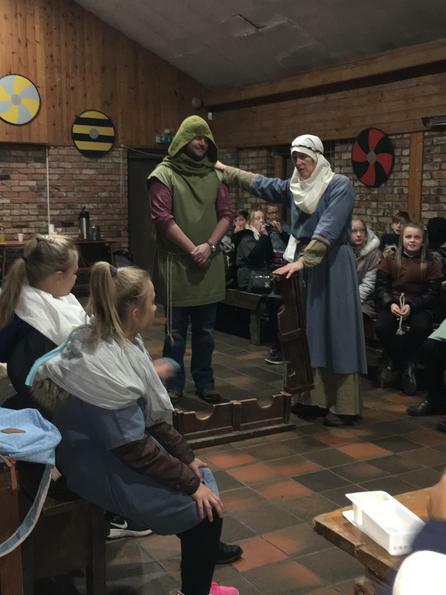 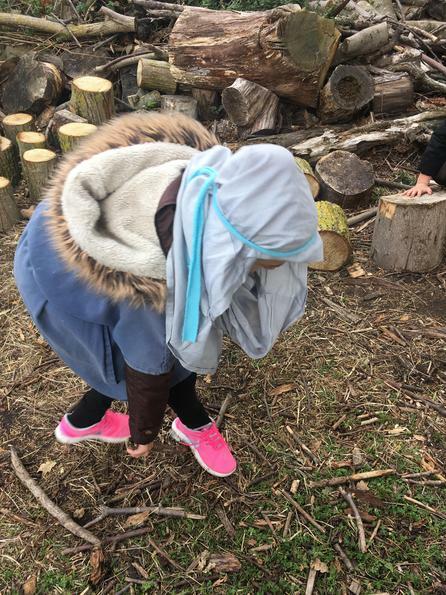 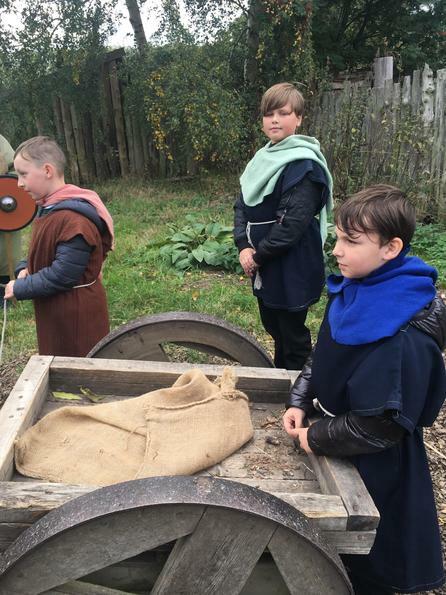 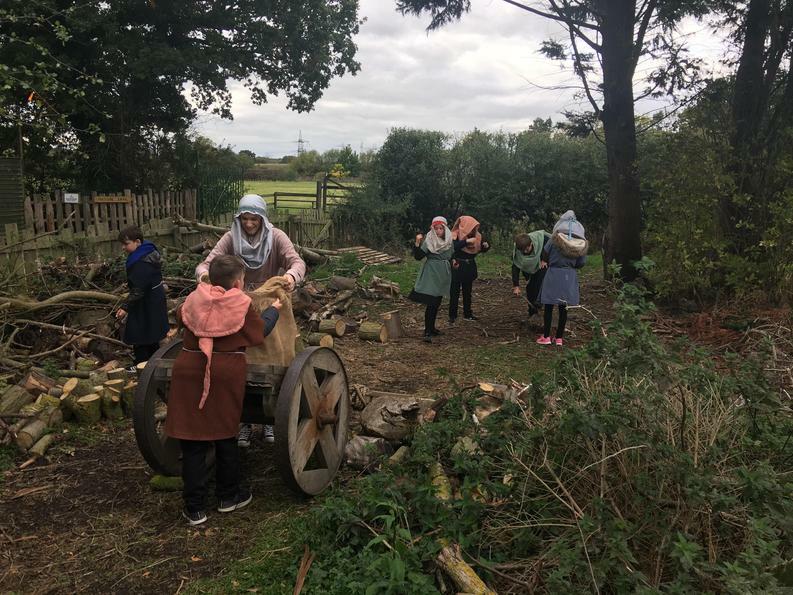 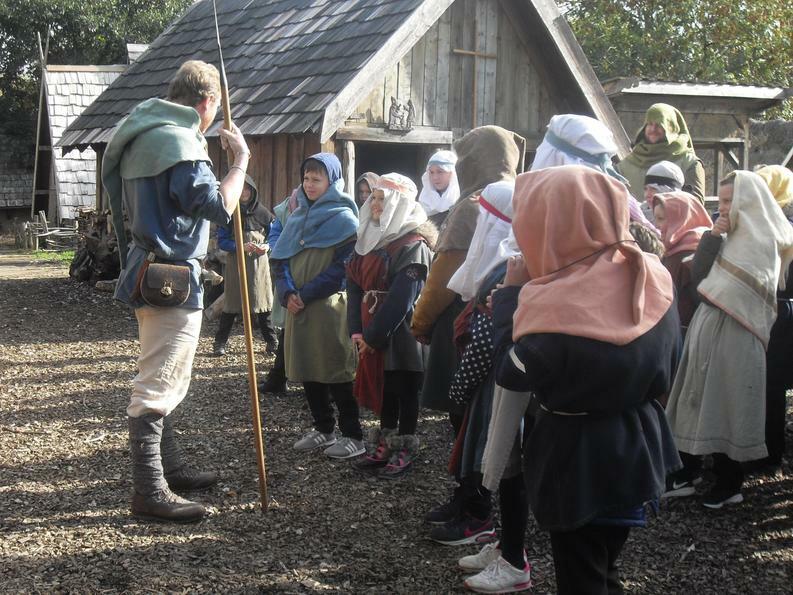 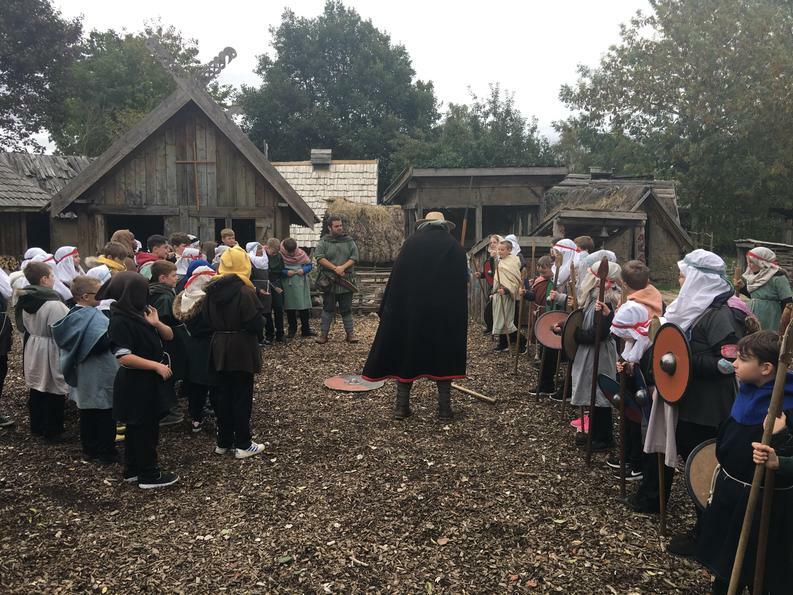 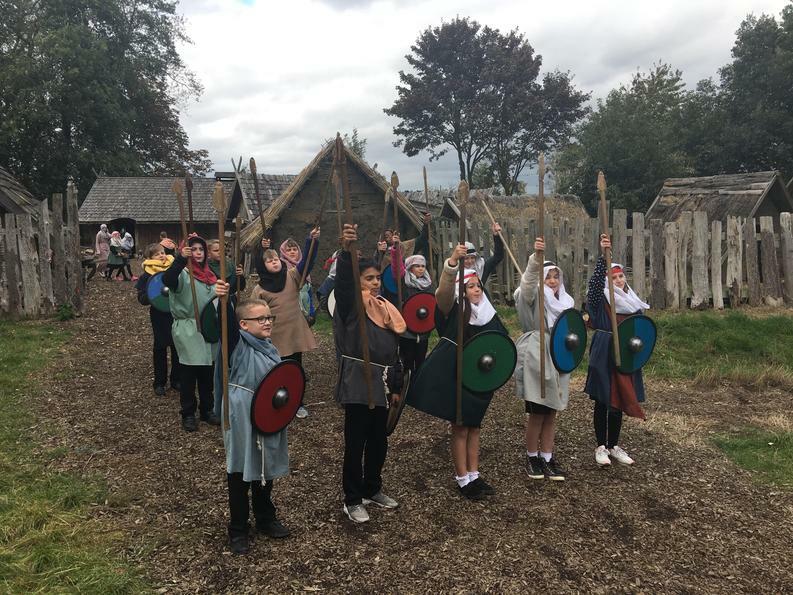 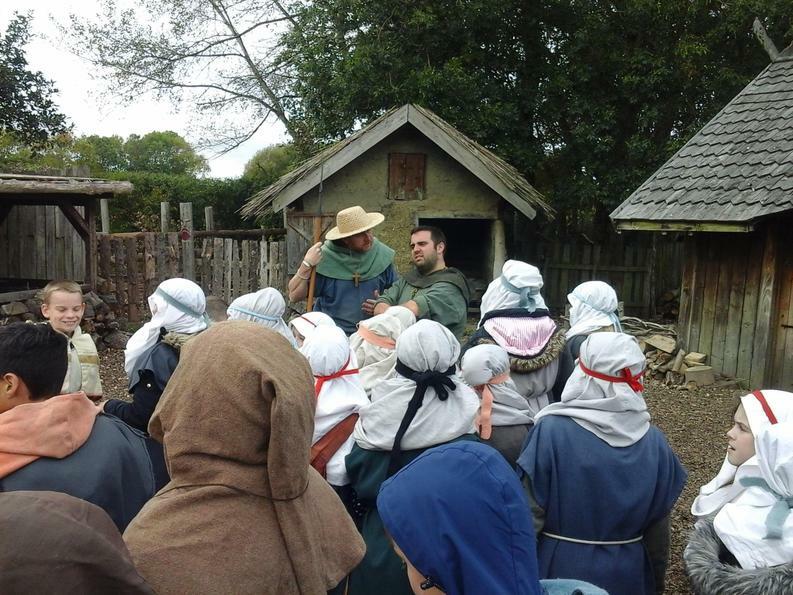 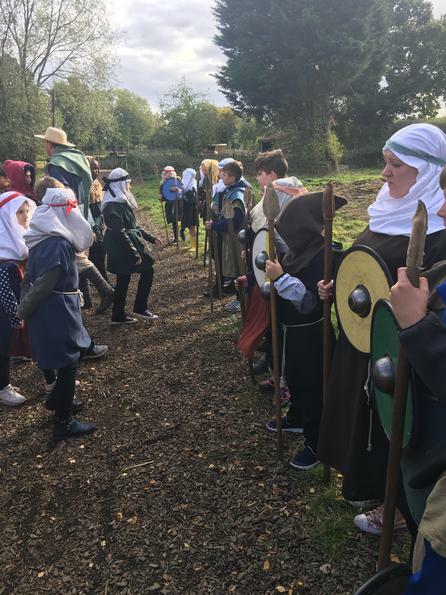 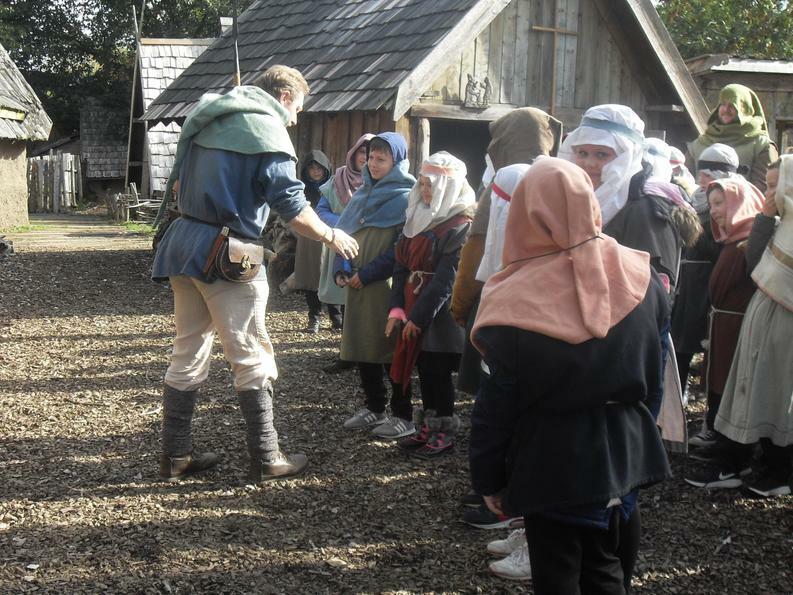 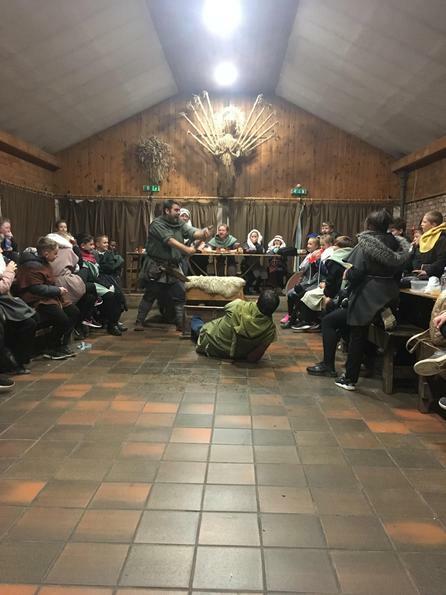 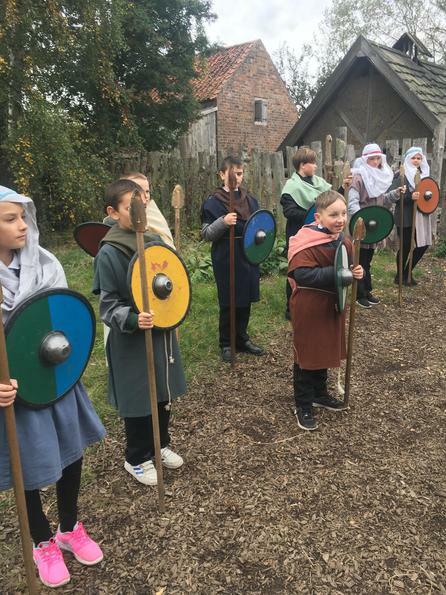 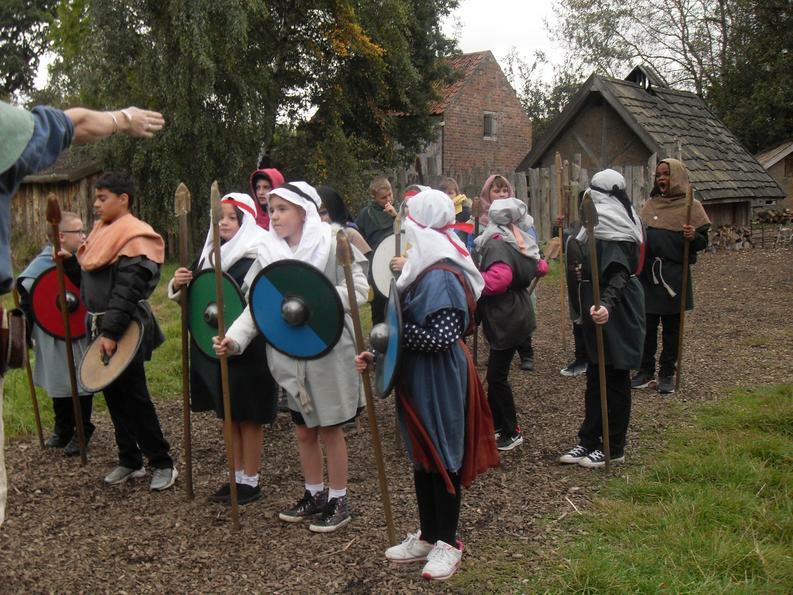 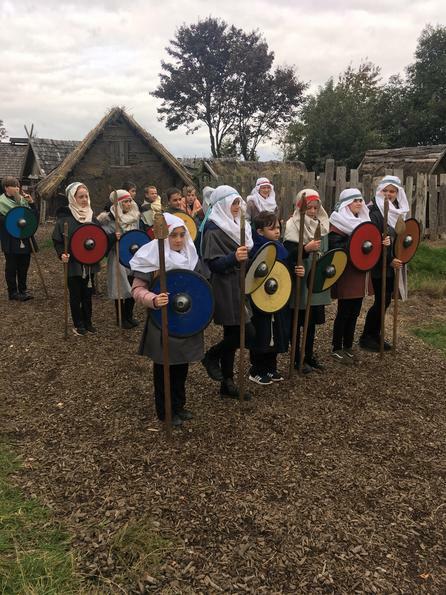 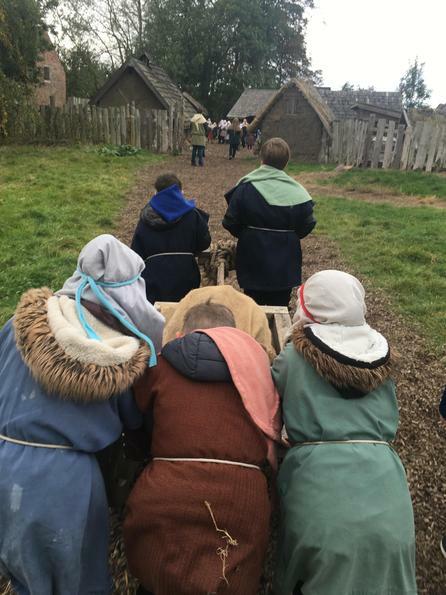 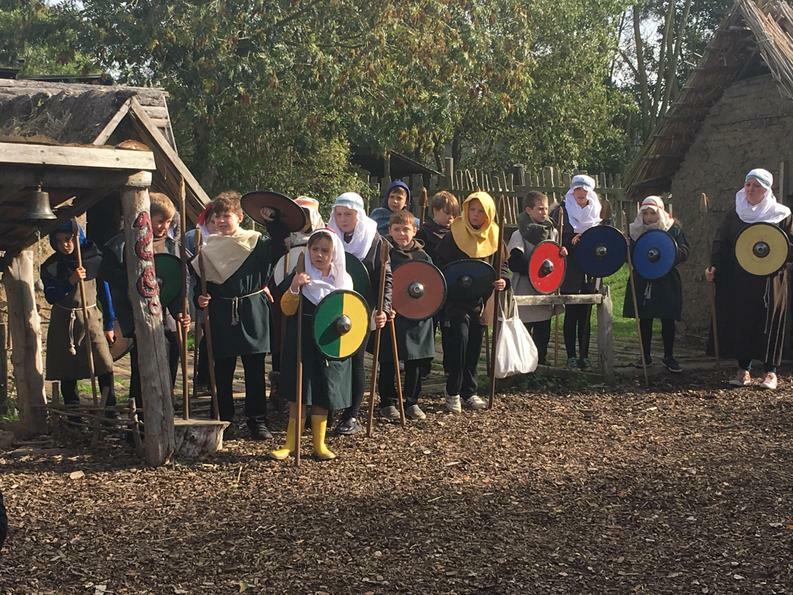 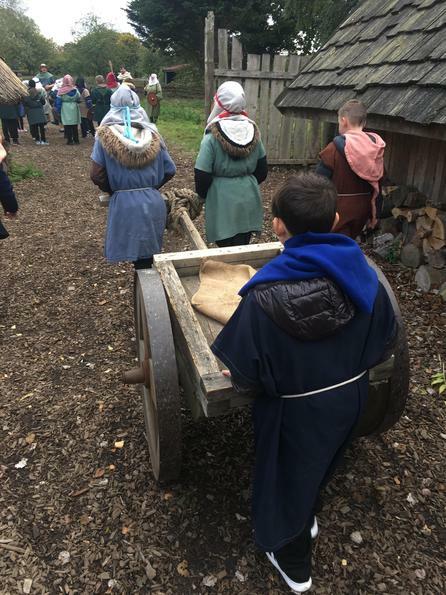 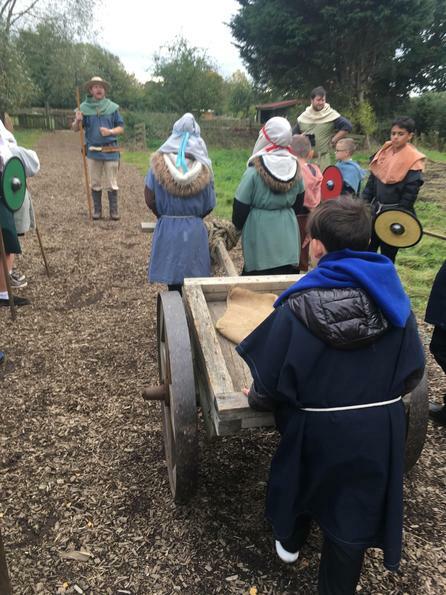 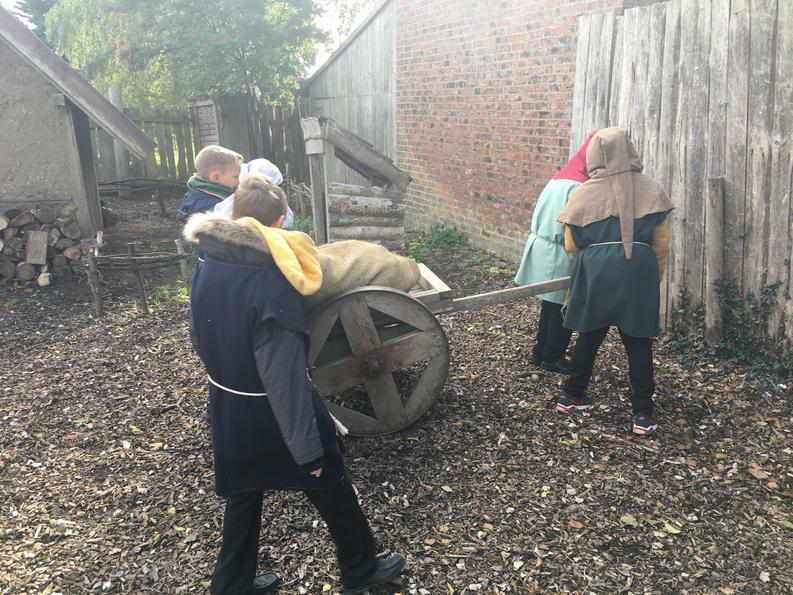 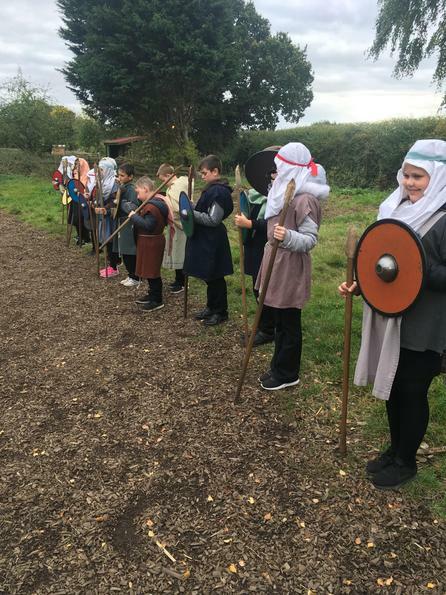 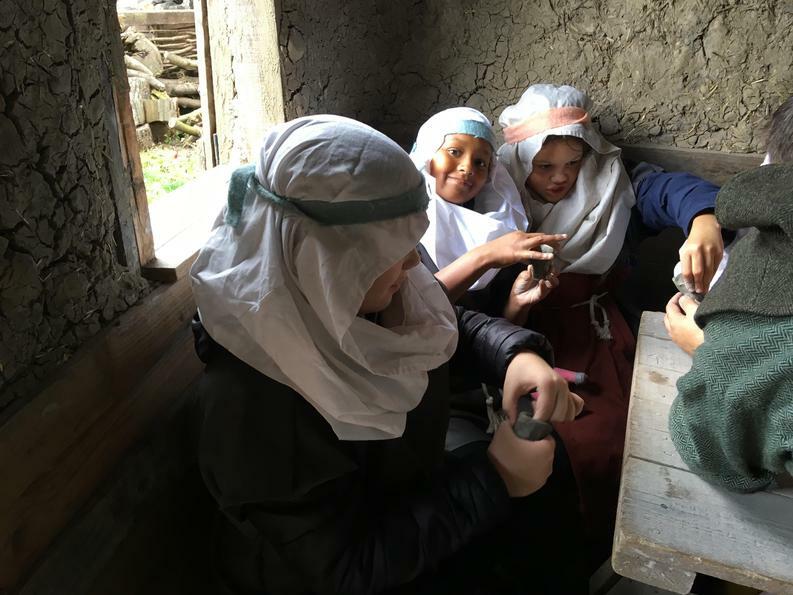 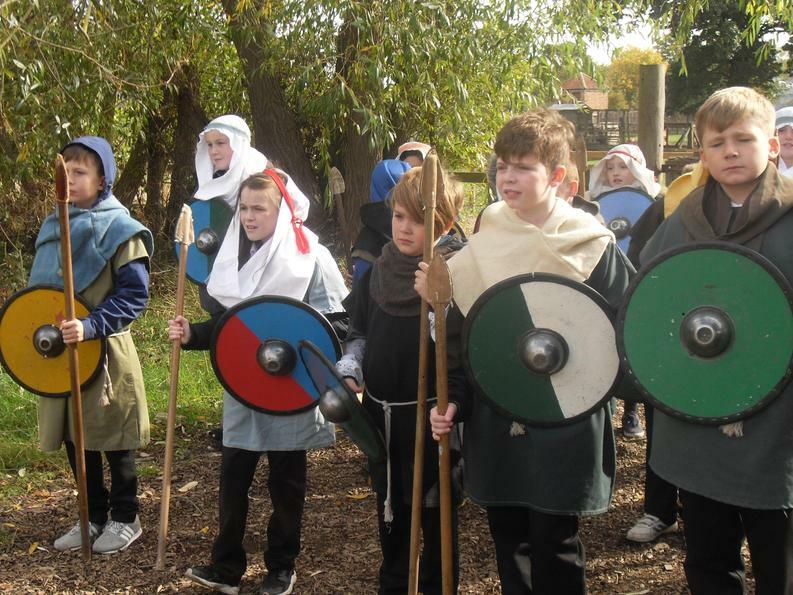 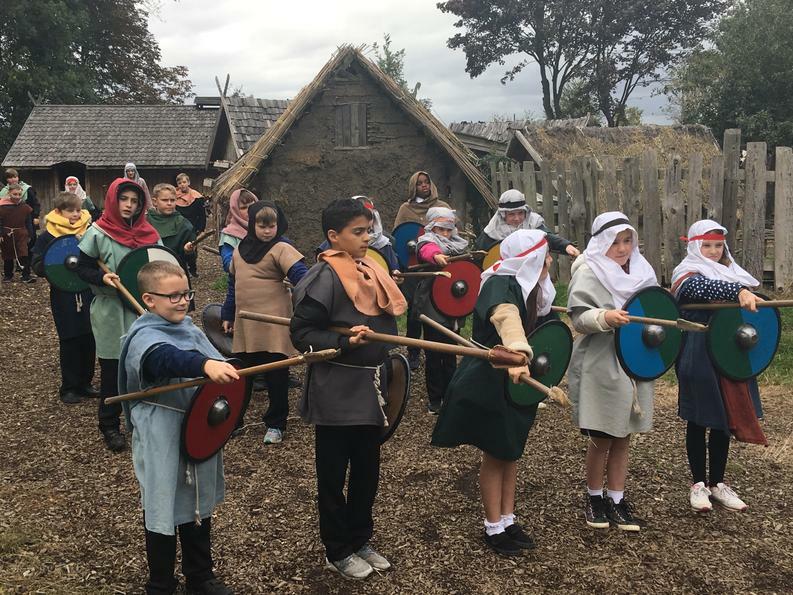 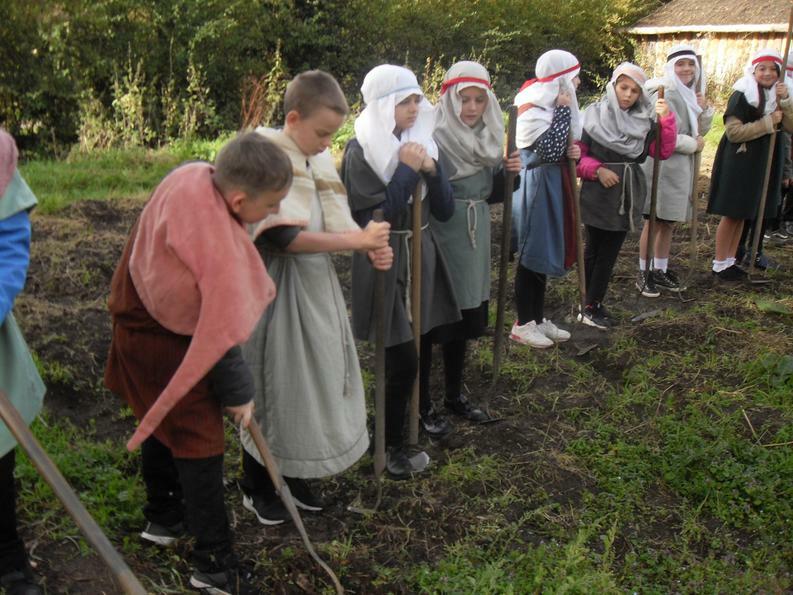 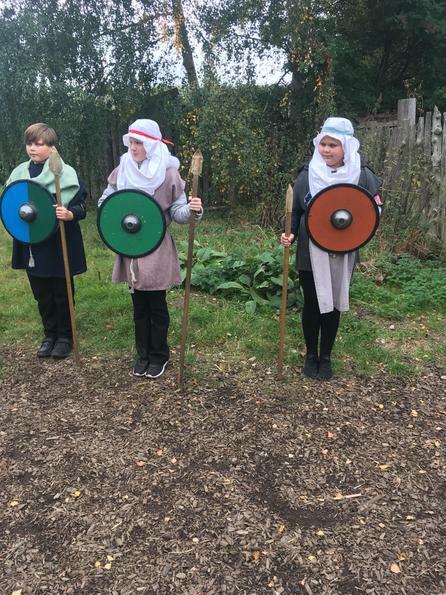 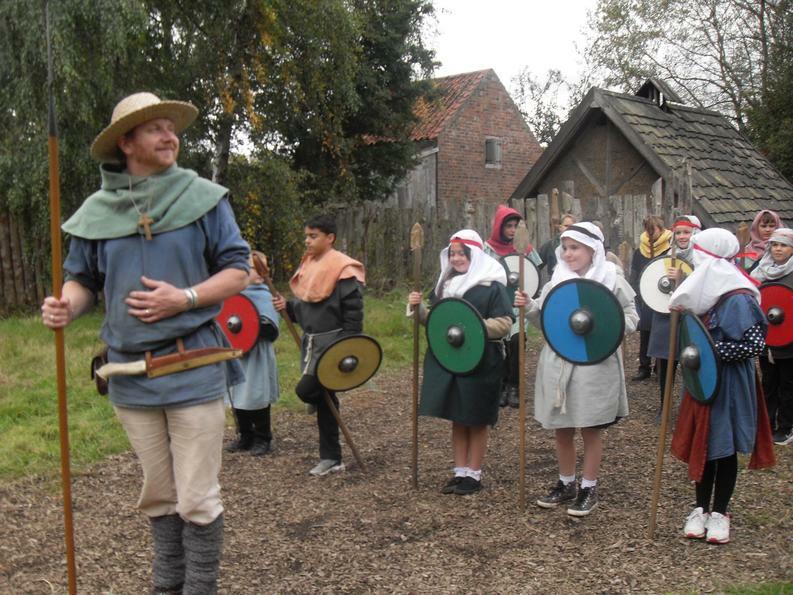 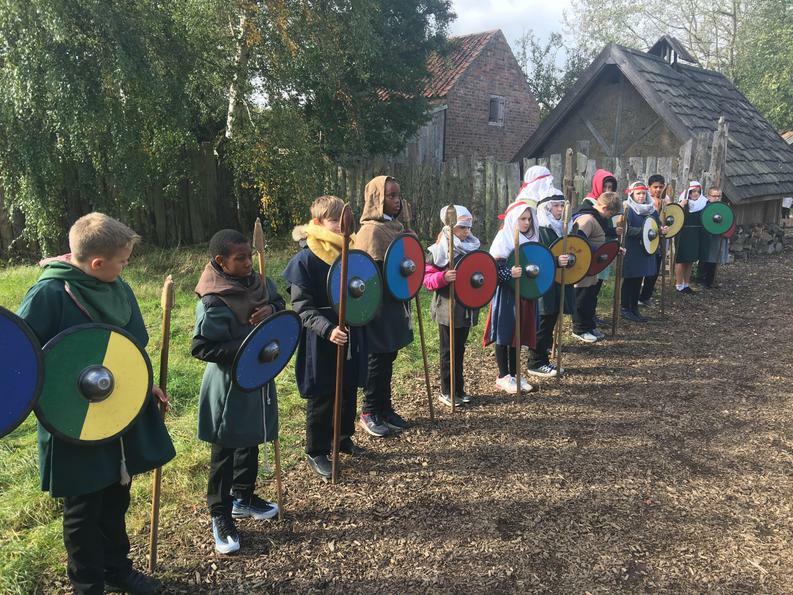 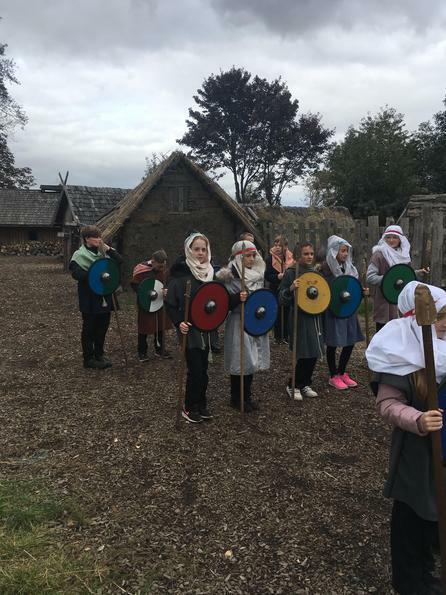 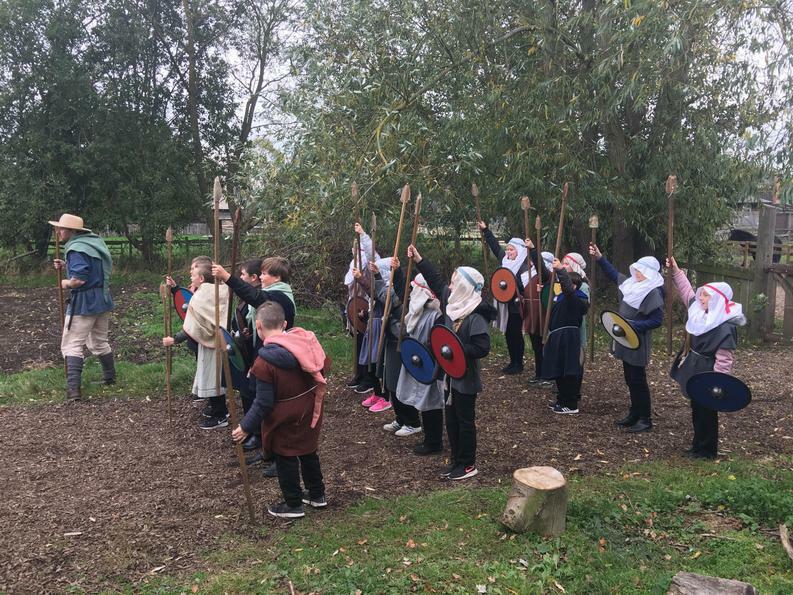 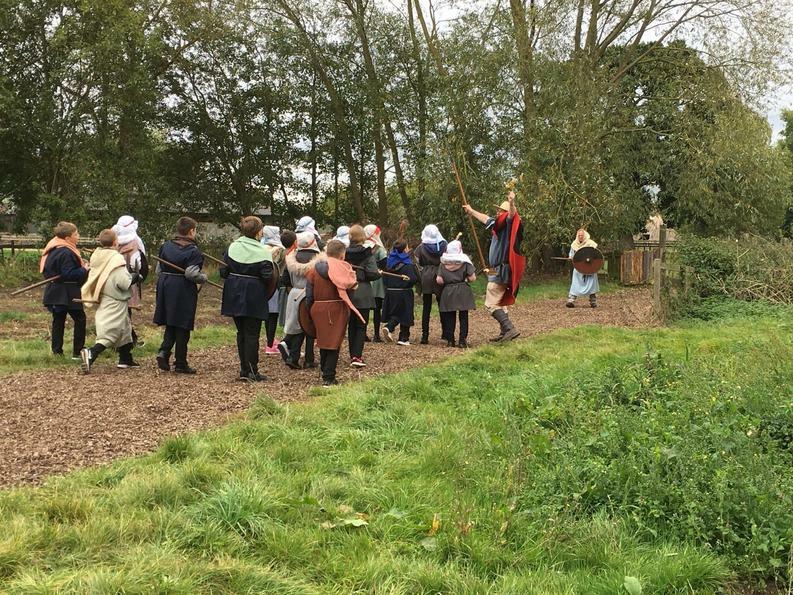 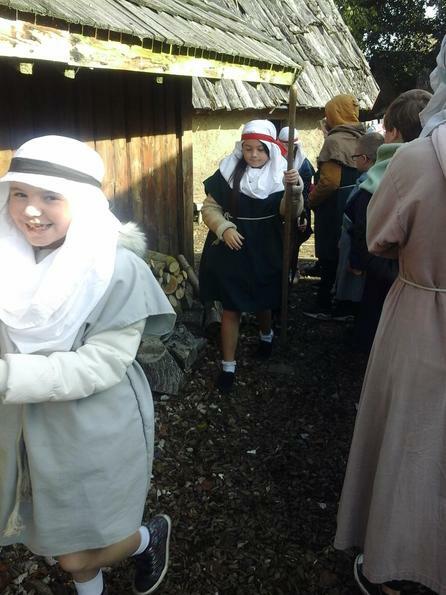 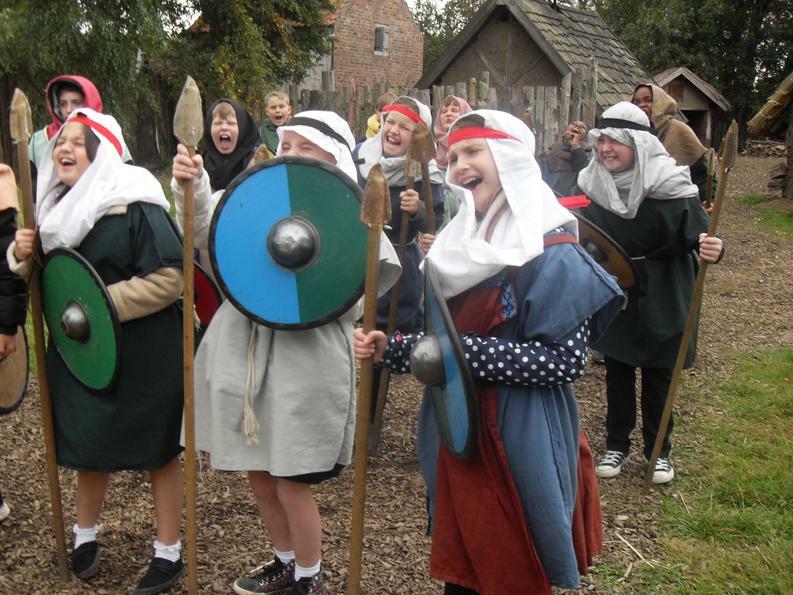 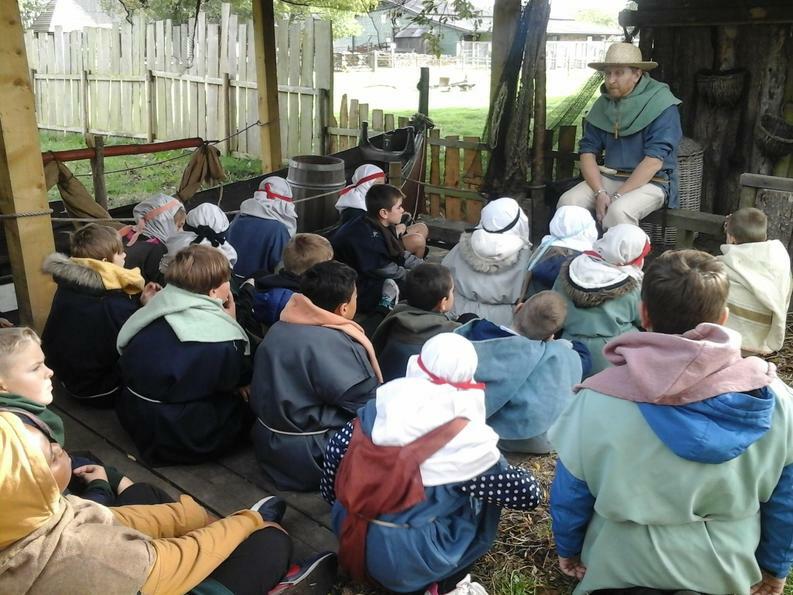 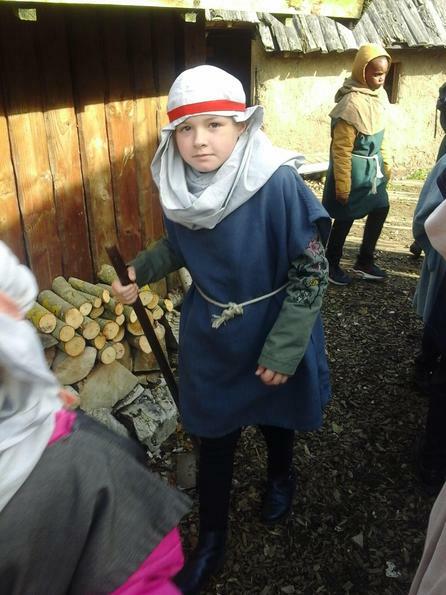 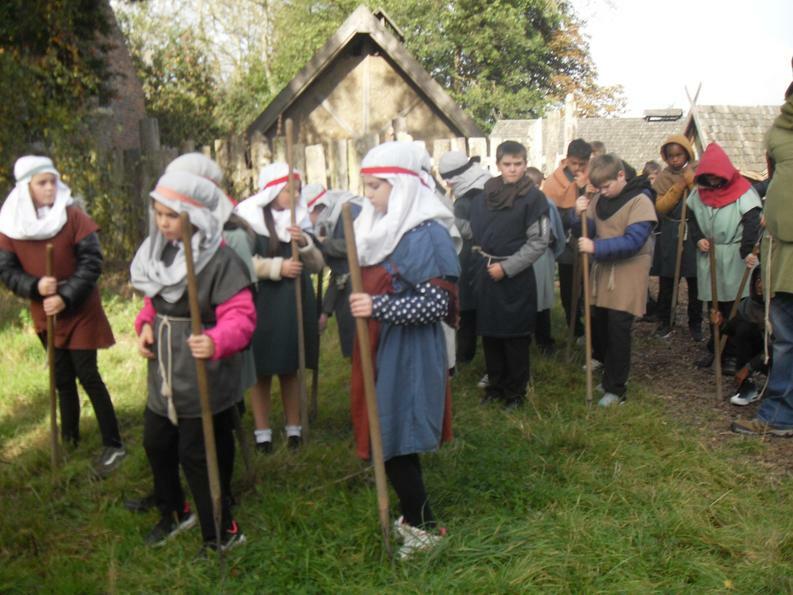 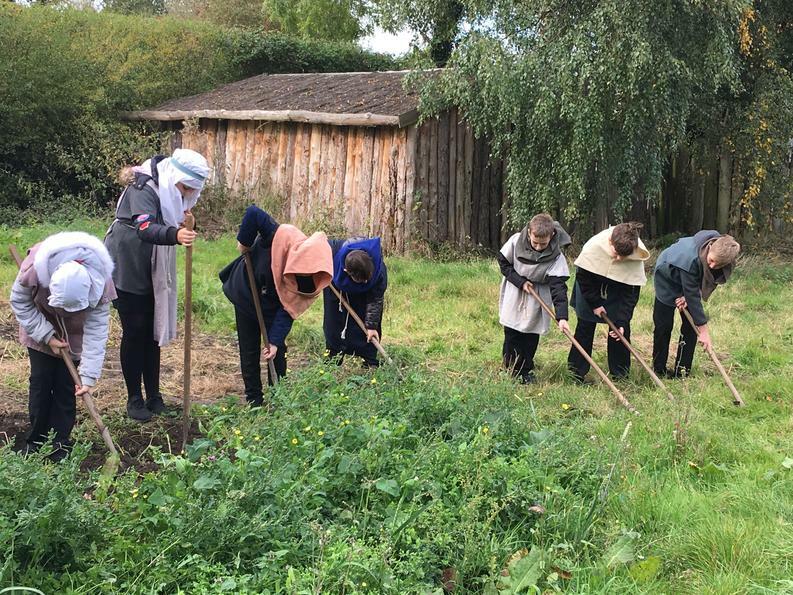 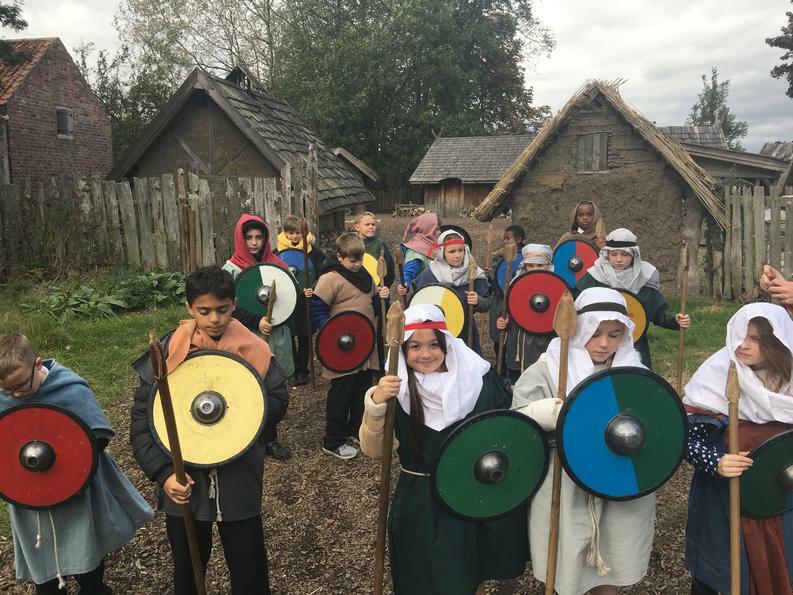 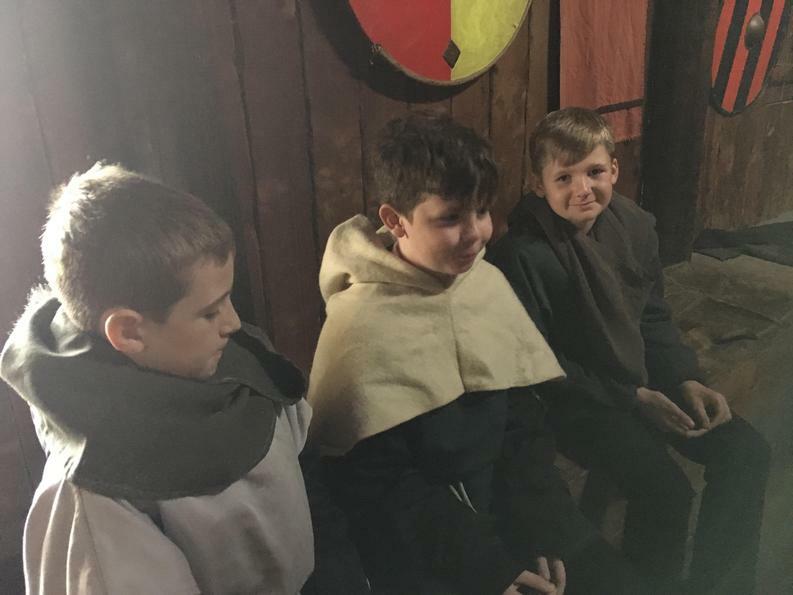 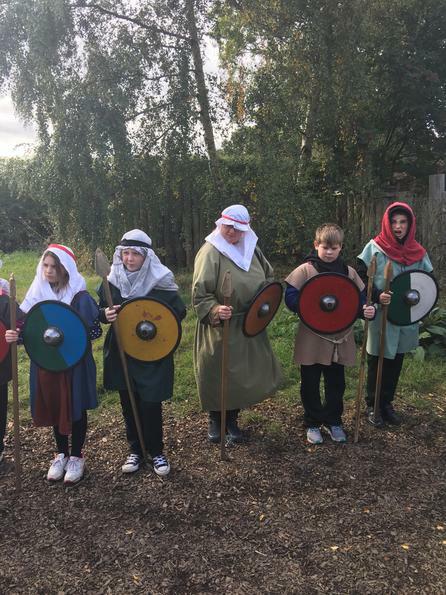 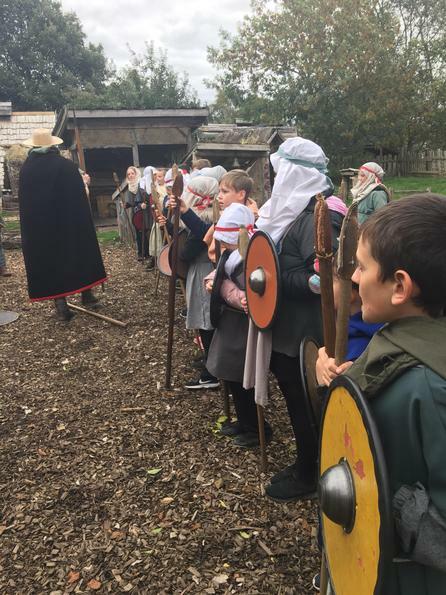 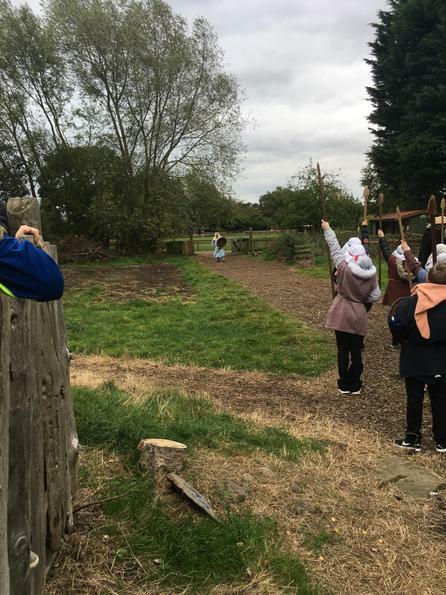 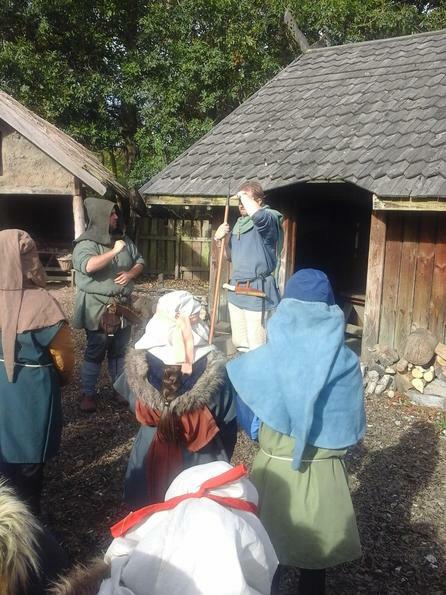 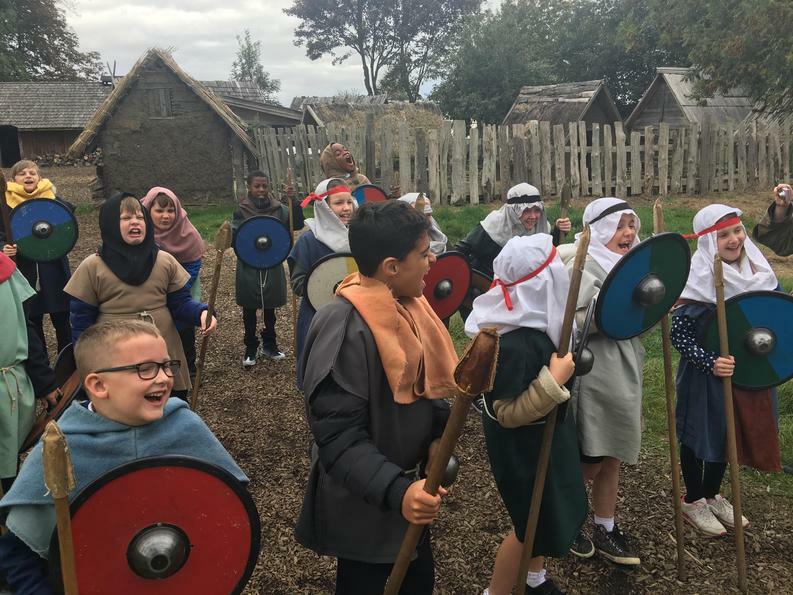 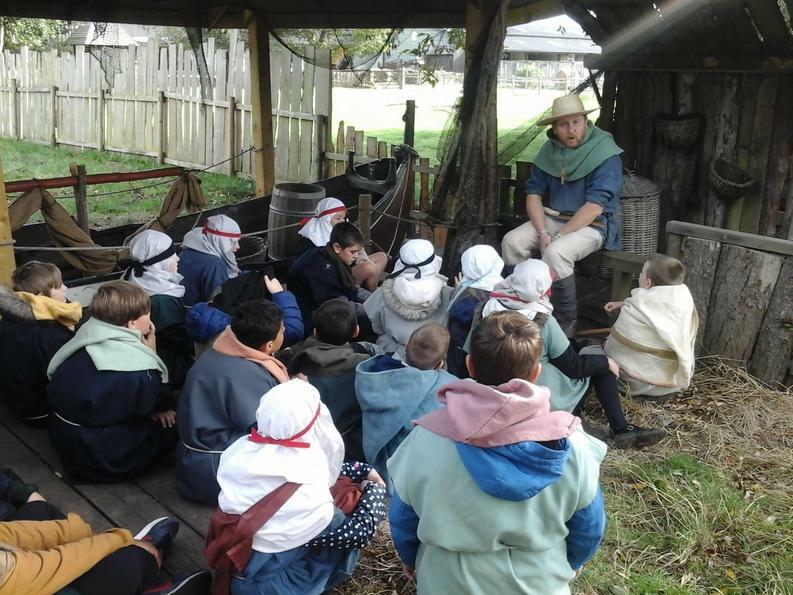 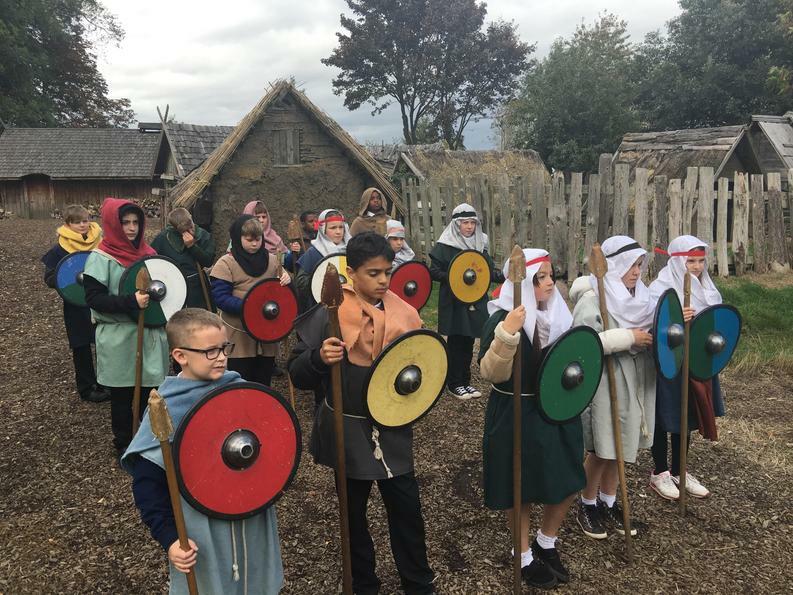 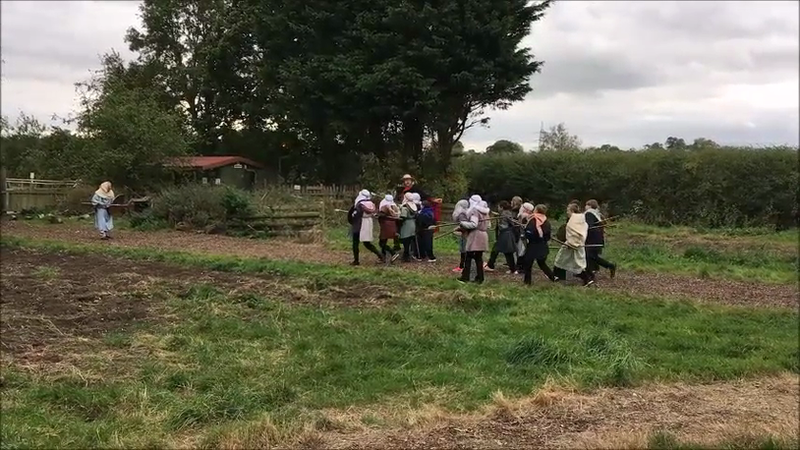 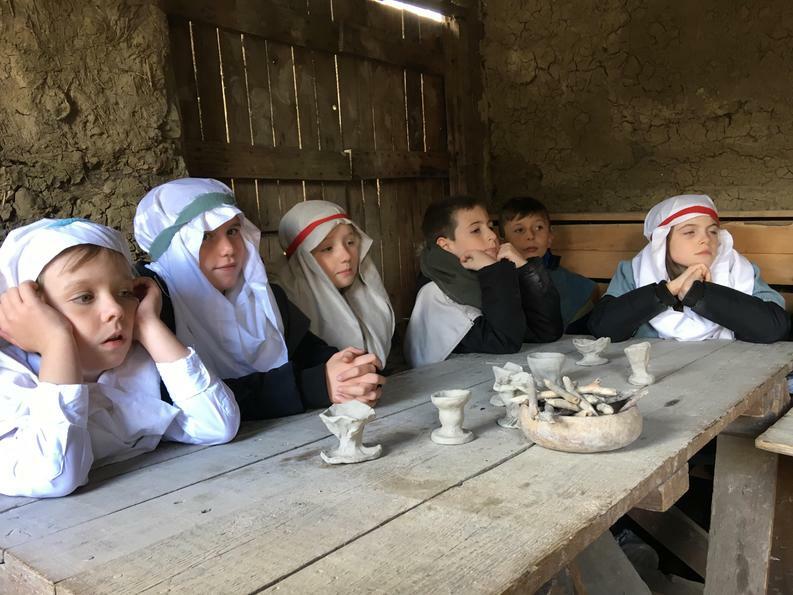 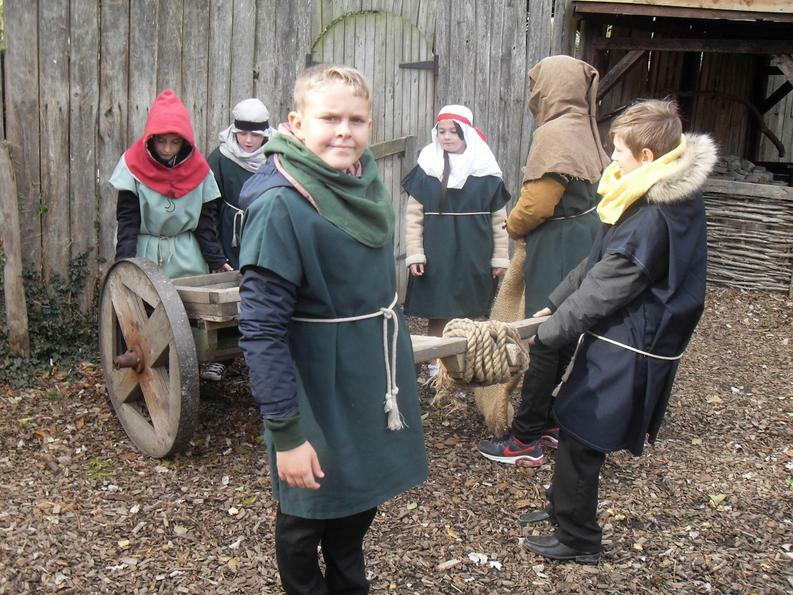 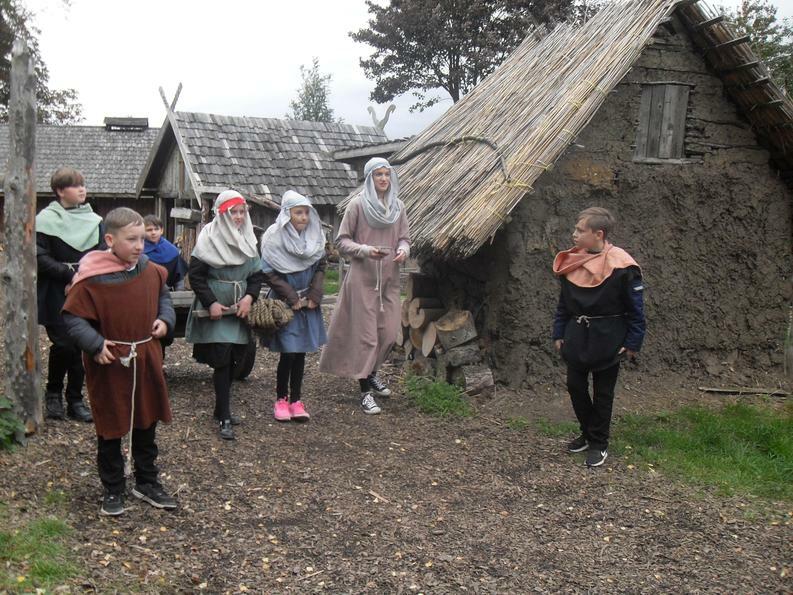 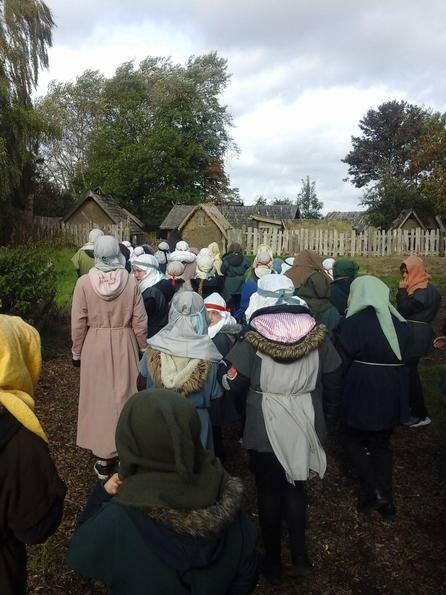 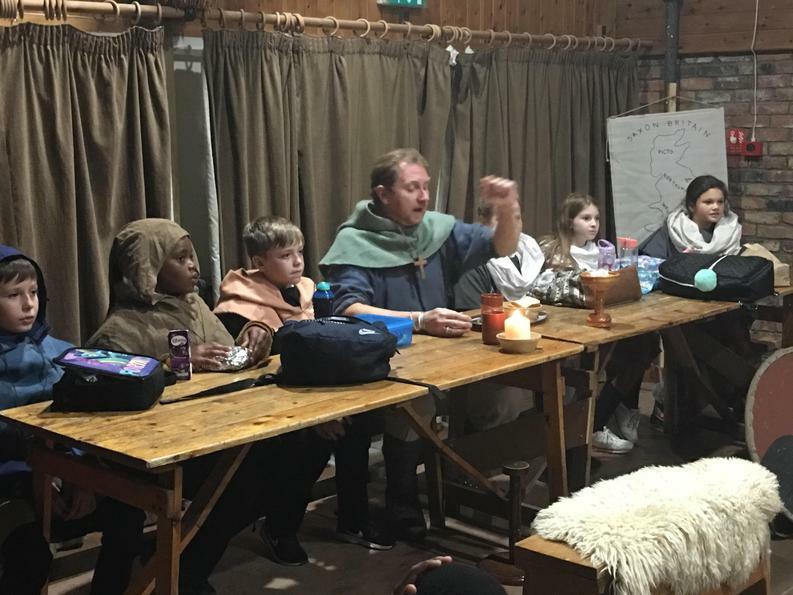 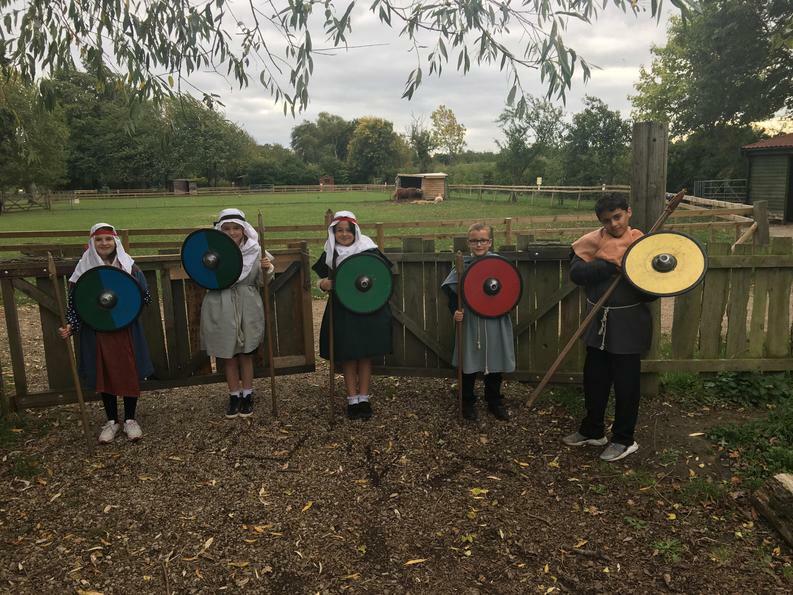 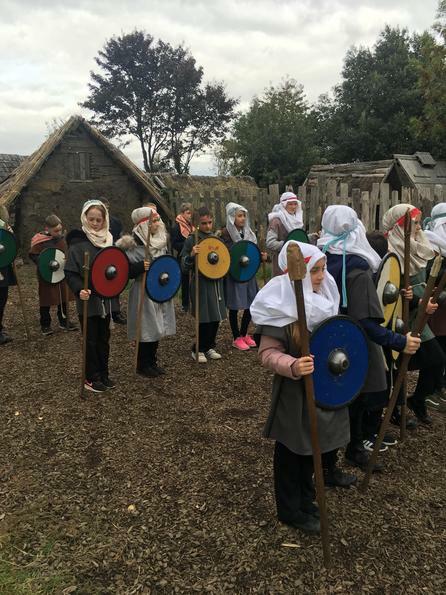 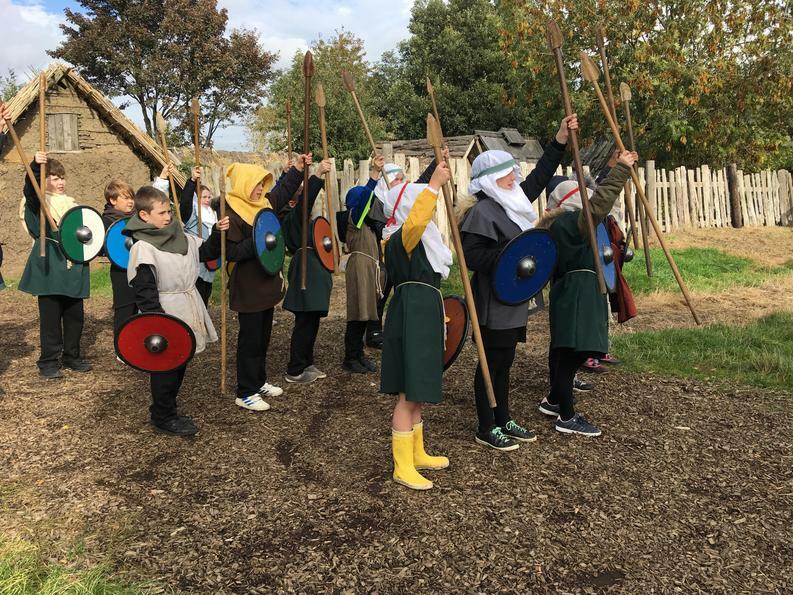 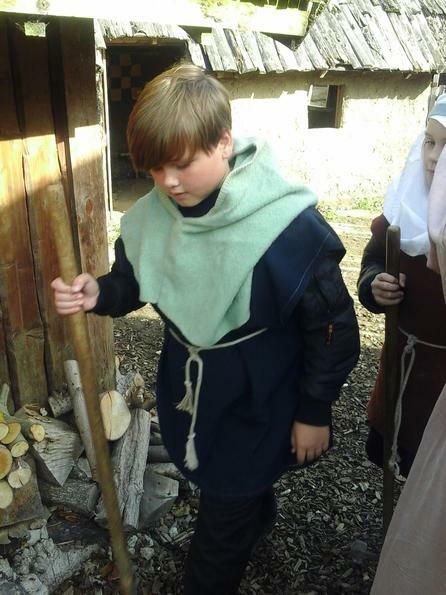 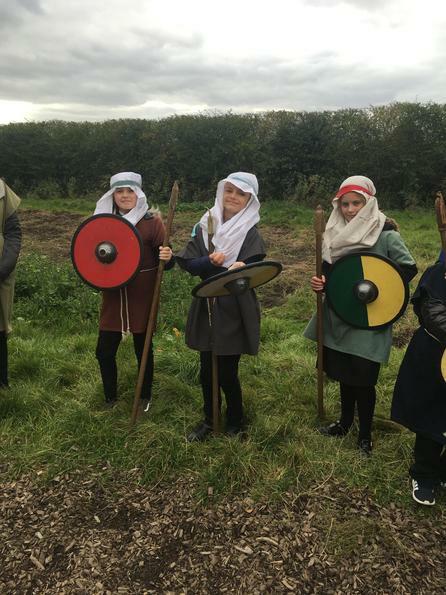 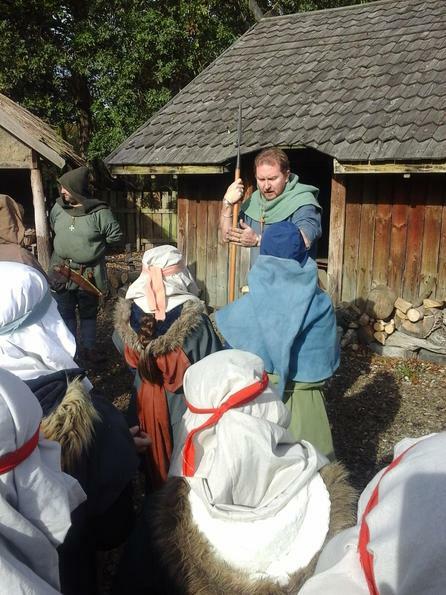 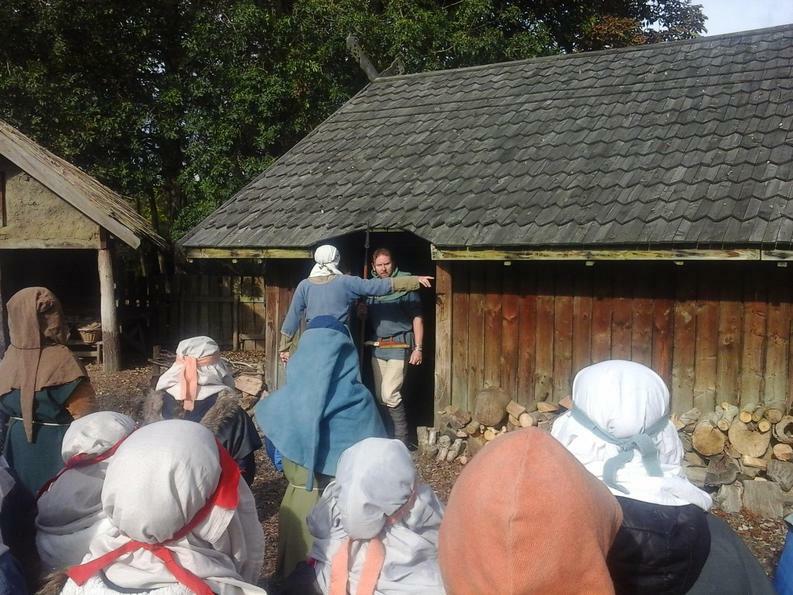 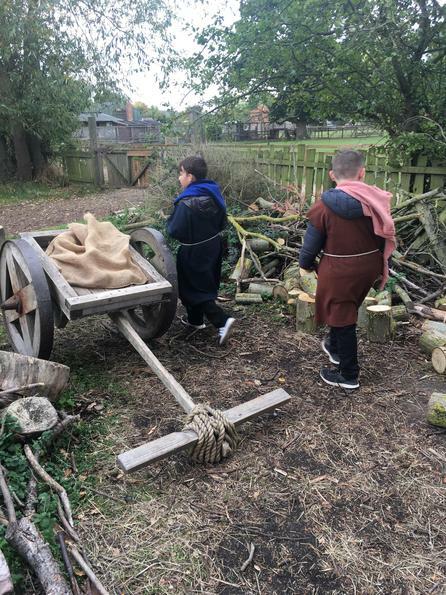 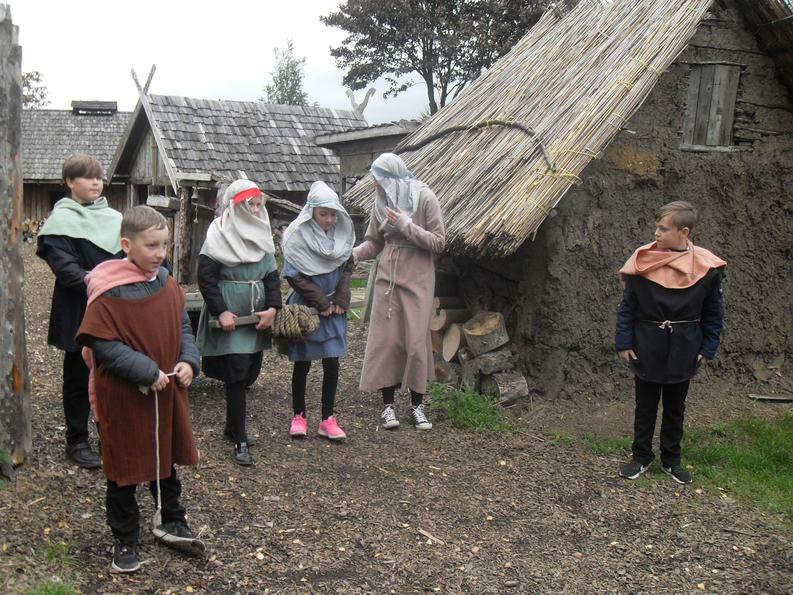 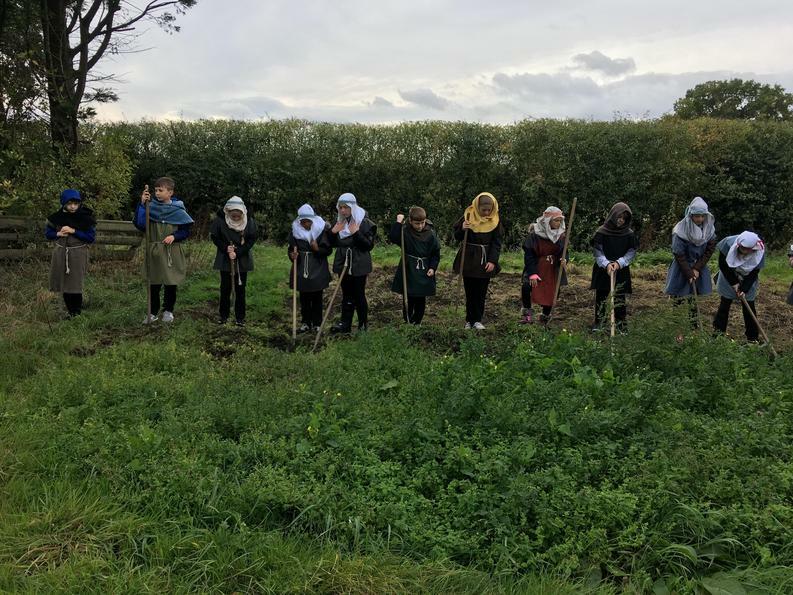 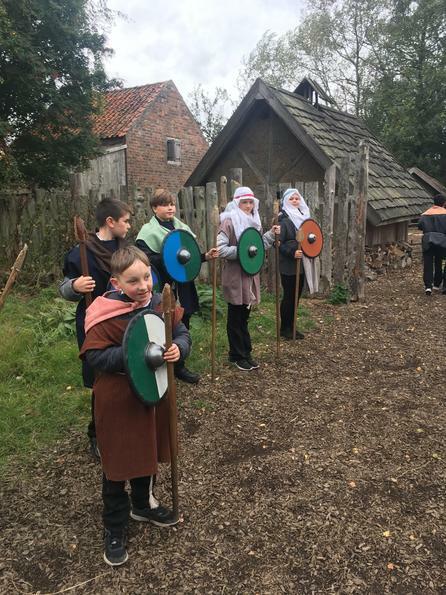 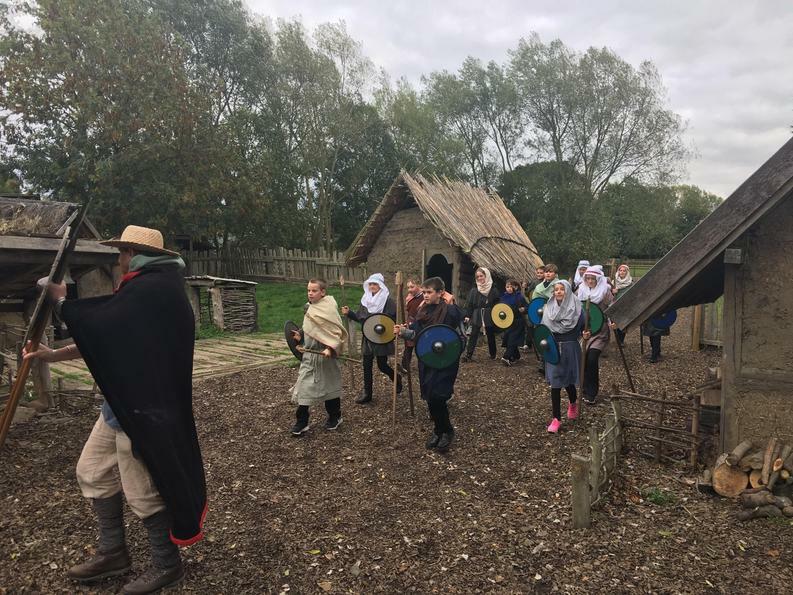 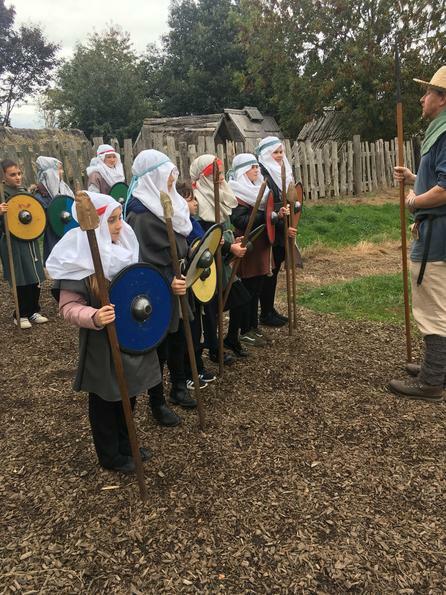 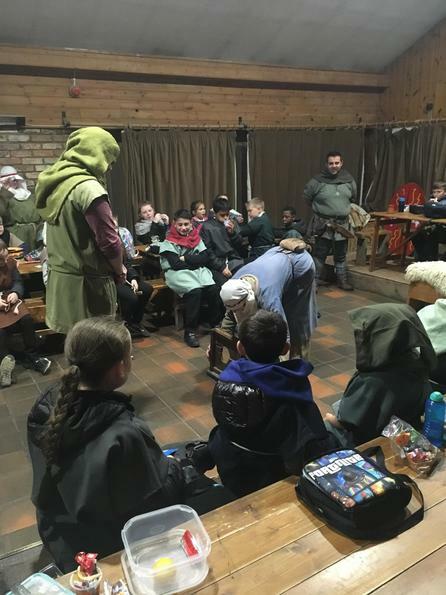 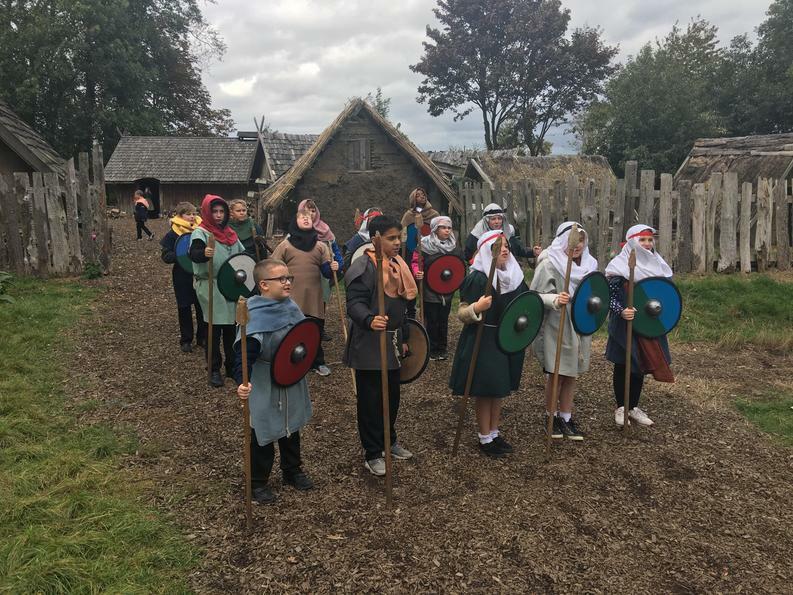 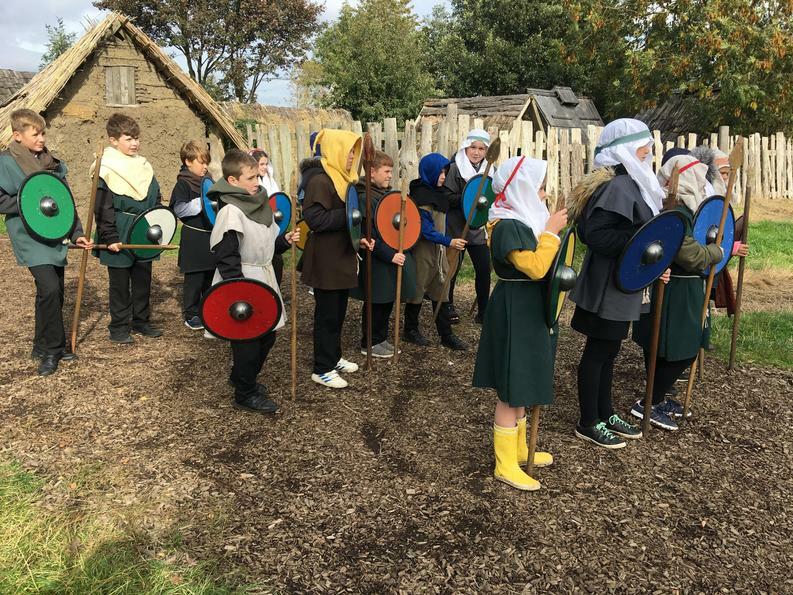 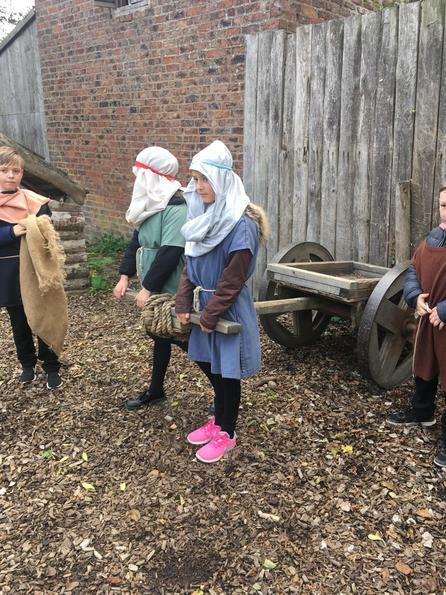 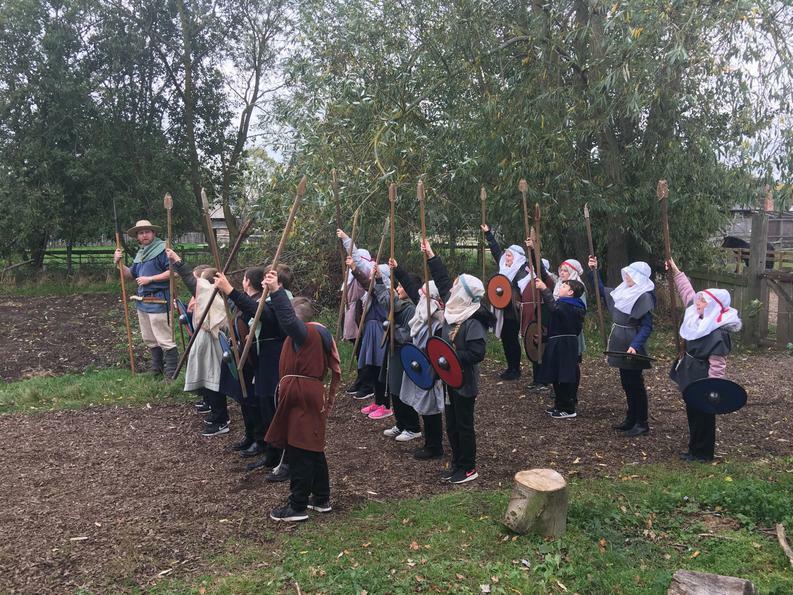 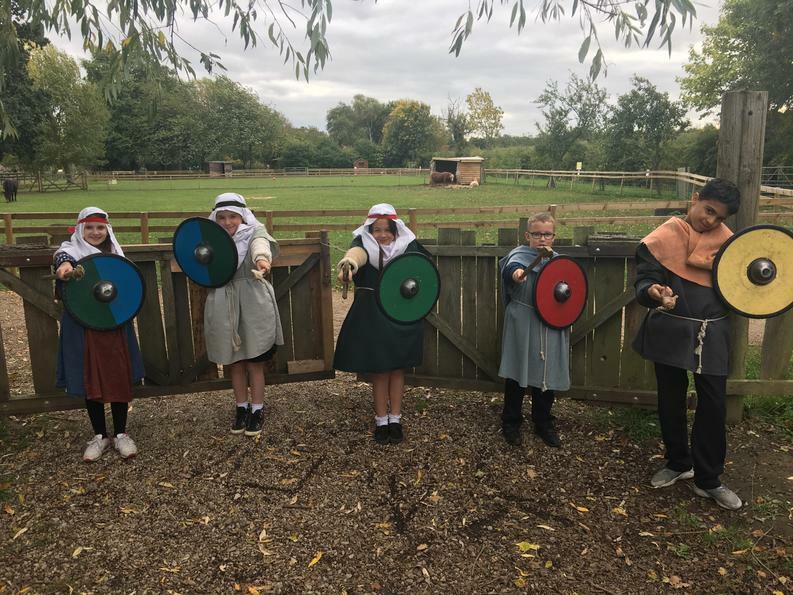 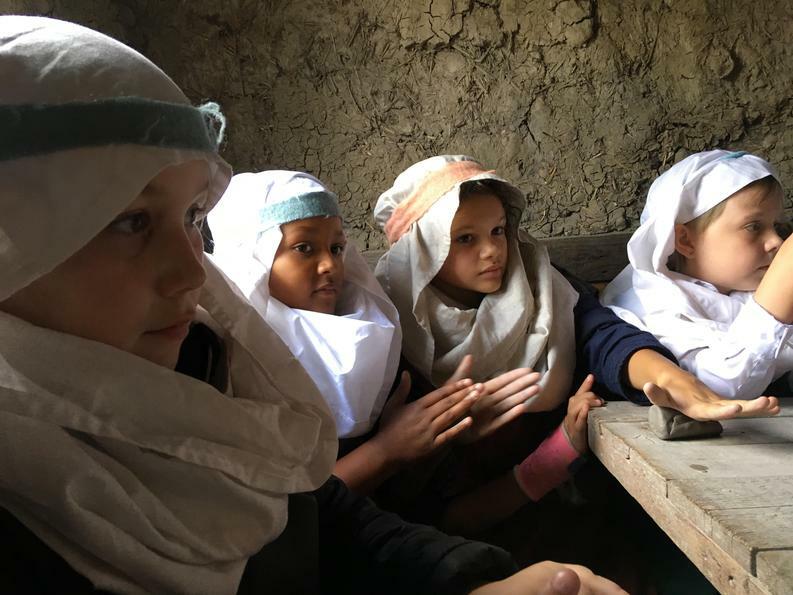 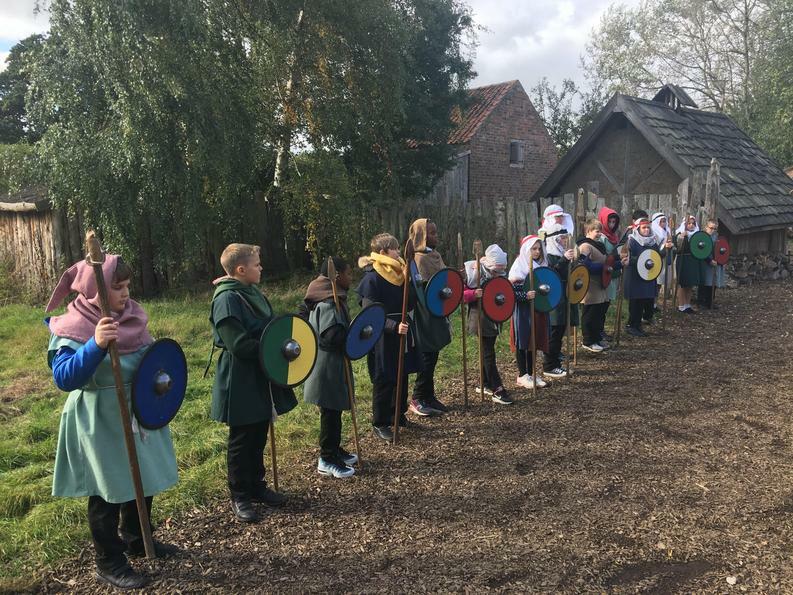 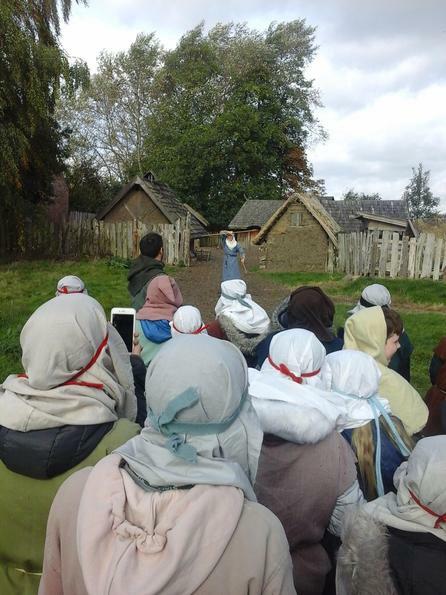 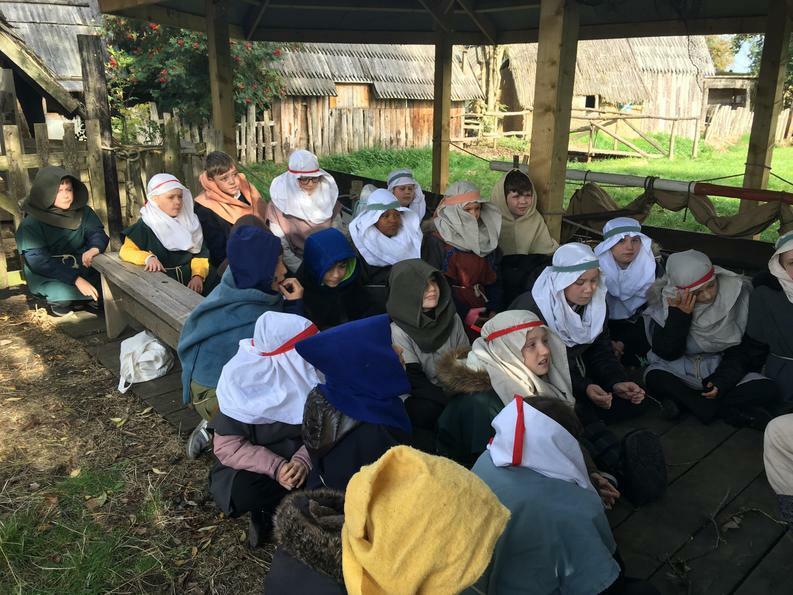 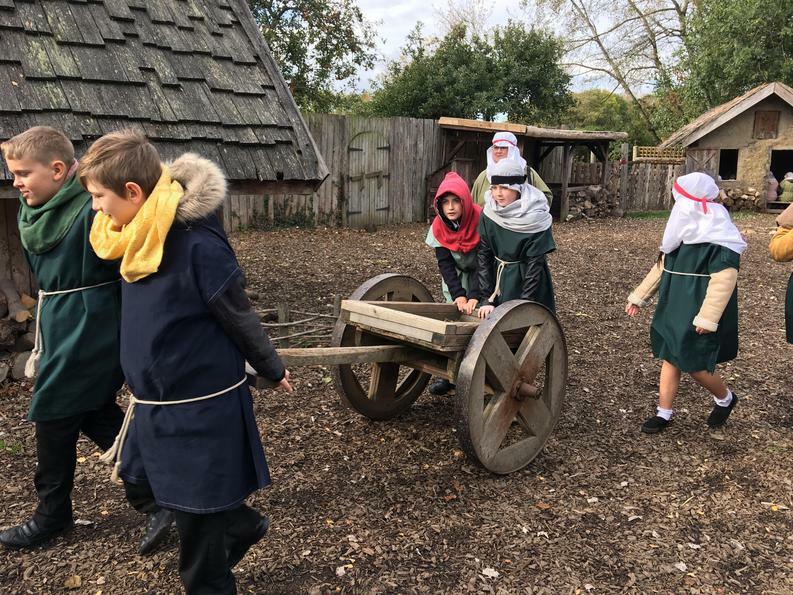 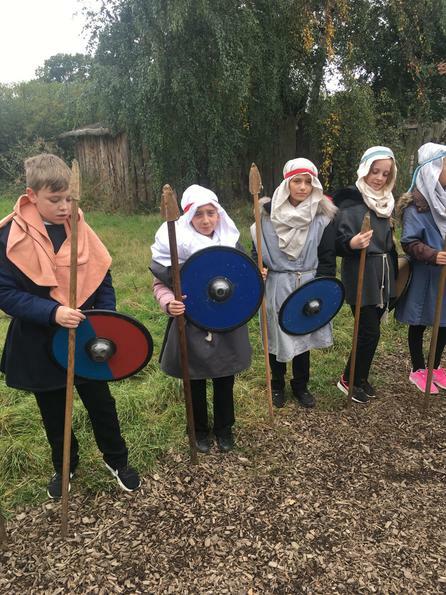 After arriving, we got changed into Anglo-Saxon clothing and went to visit the village where we met several Anglo-Saxons: Osbald, Agatha and the Thane - the leader of the village. 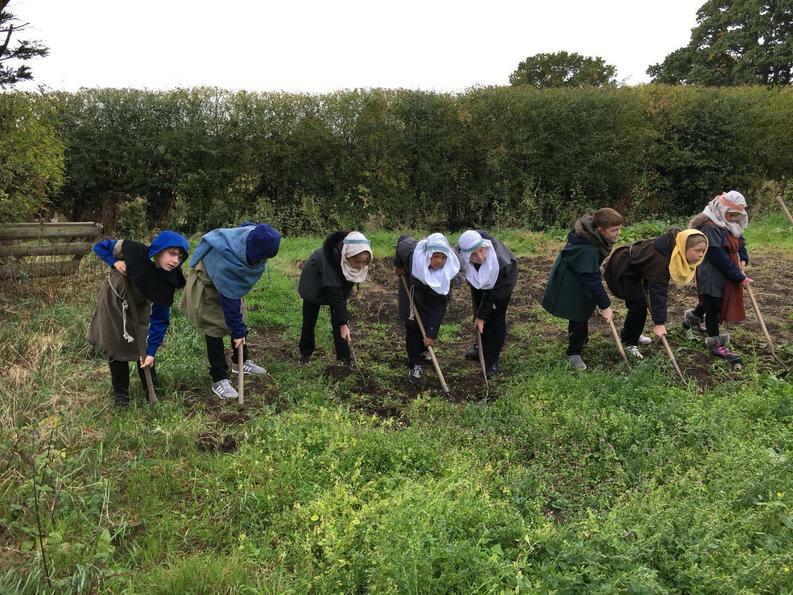 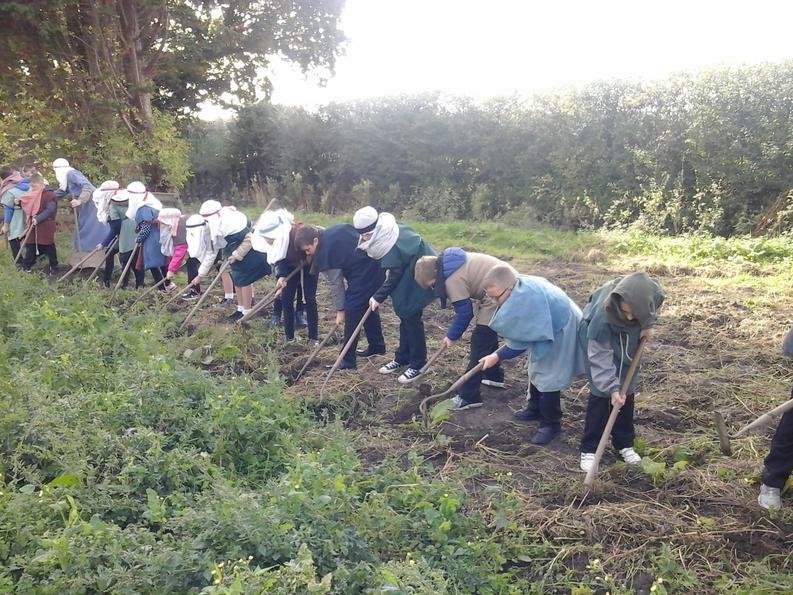 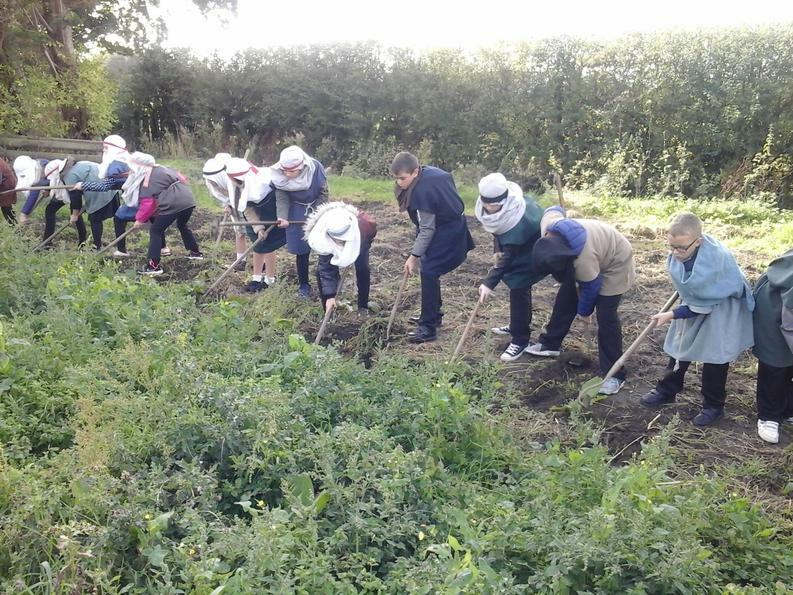 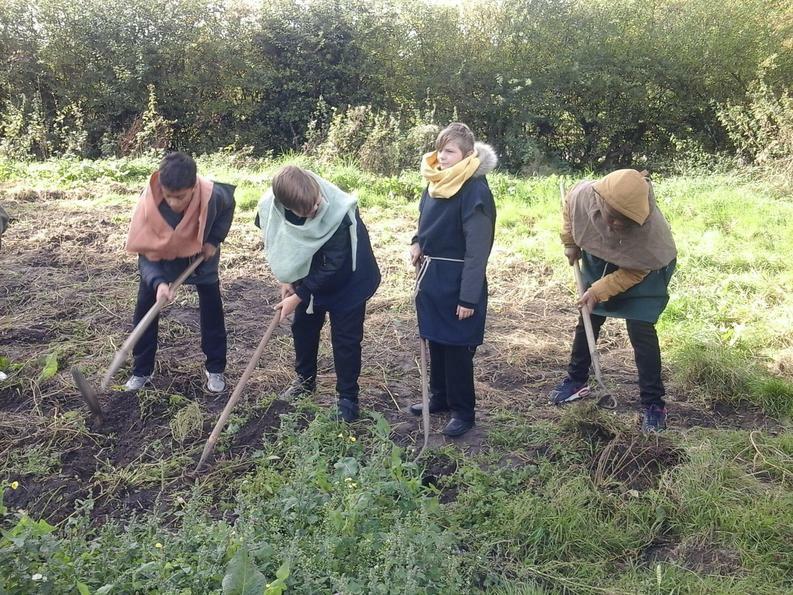 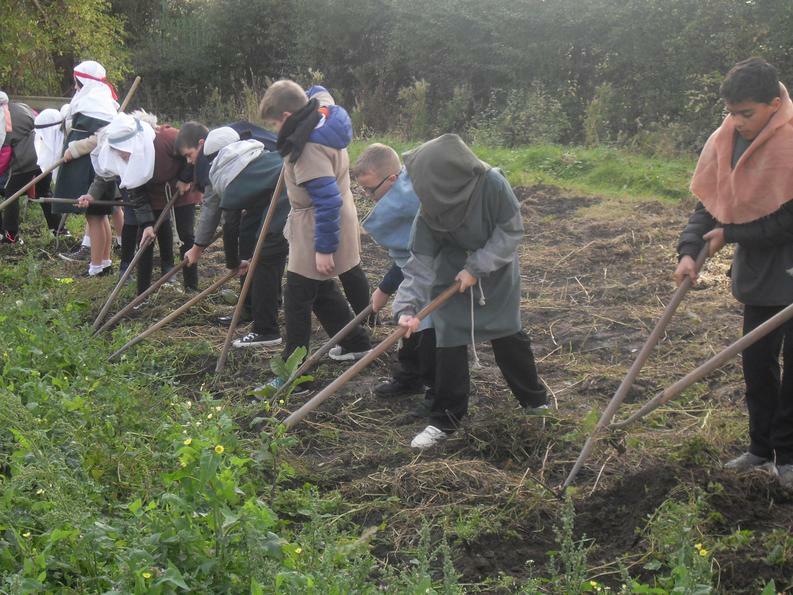 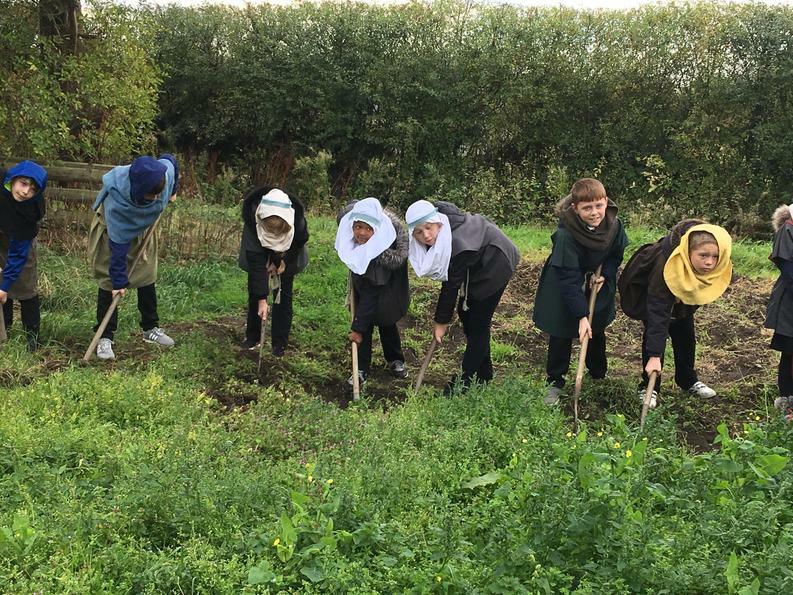 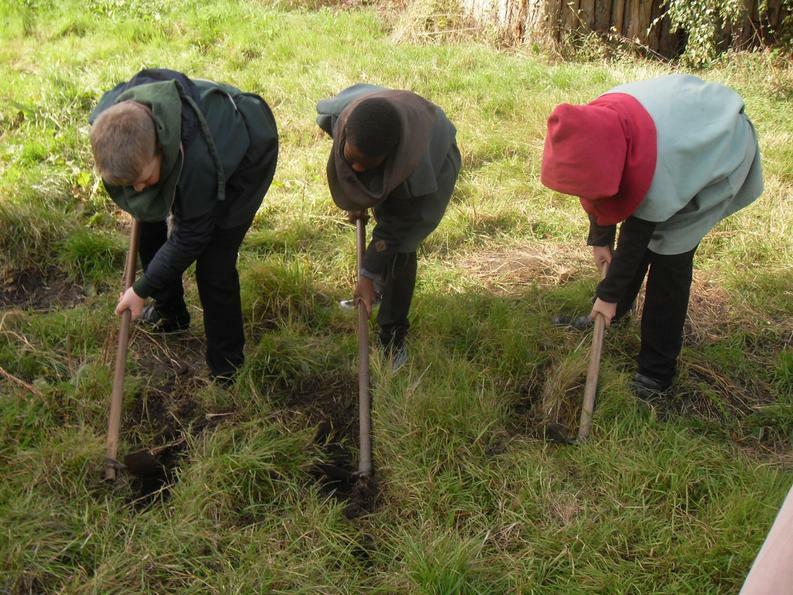 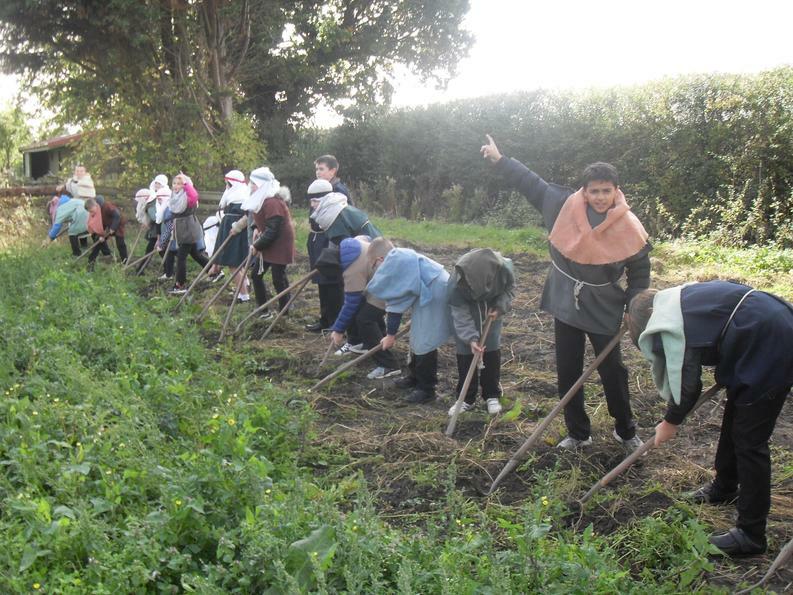 One of the first tasks we had to do - in order to prove we were hard working - was to work in the fields. 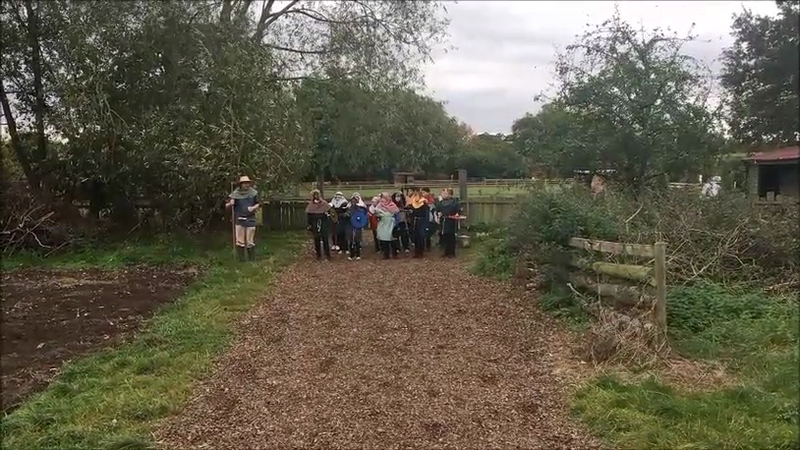 We were exhausted after only 10 minutes. 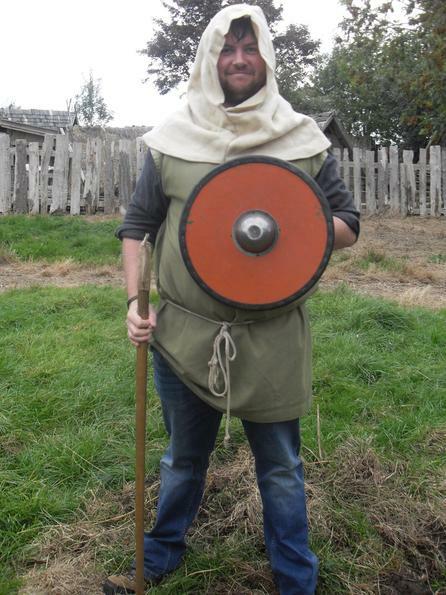 but this was a task an Anglo-Saxon might spend the whole day doing. 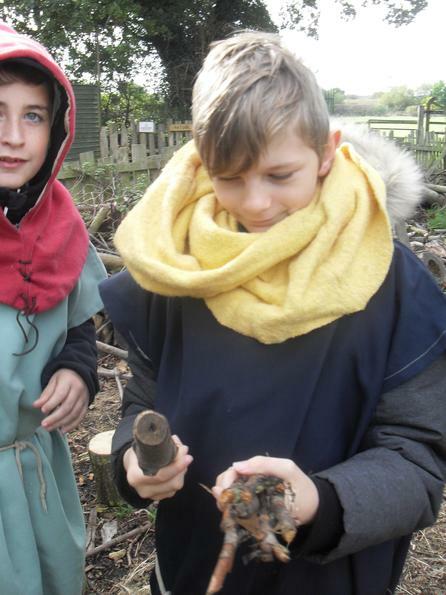 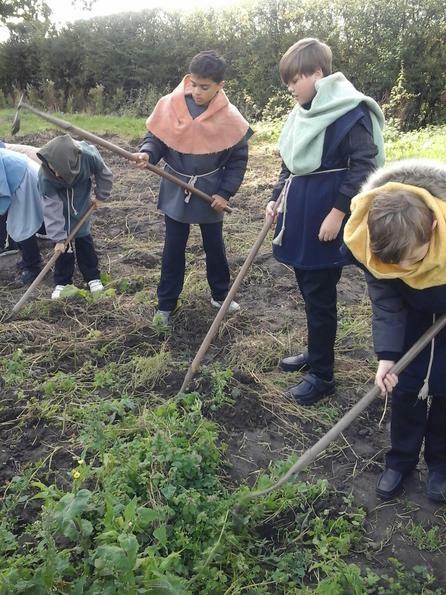 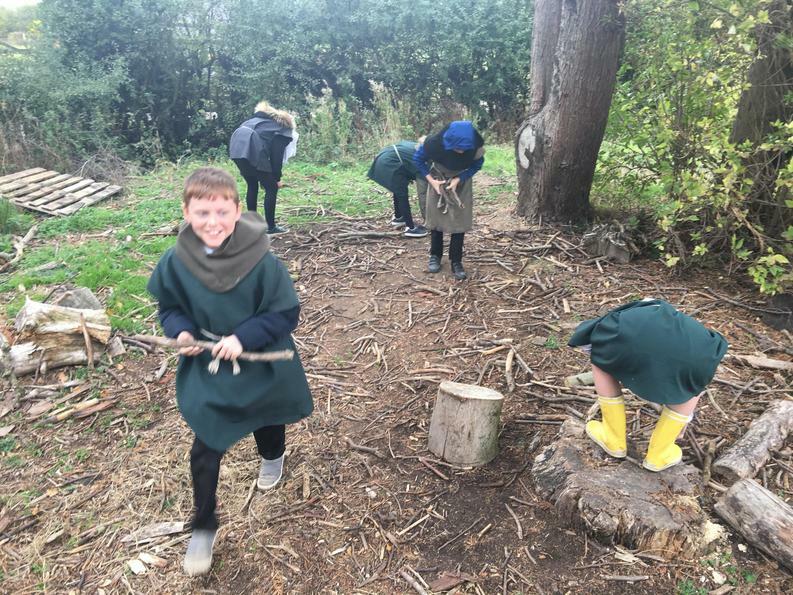 Hunting, gathering and fishing were all other ways the Anglo-Saxons found food. 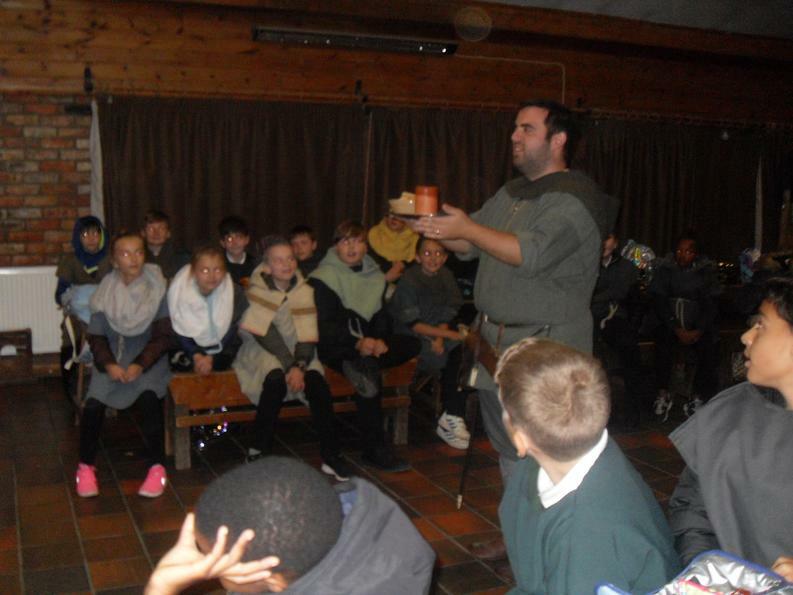 The Thane explained all about the various edible plants they would have eaten. 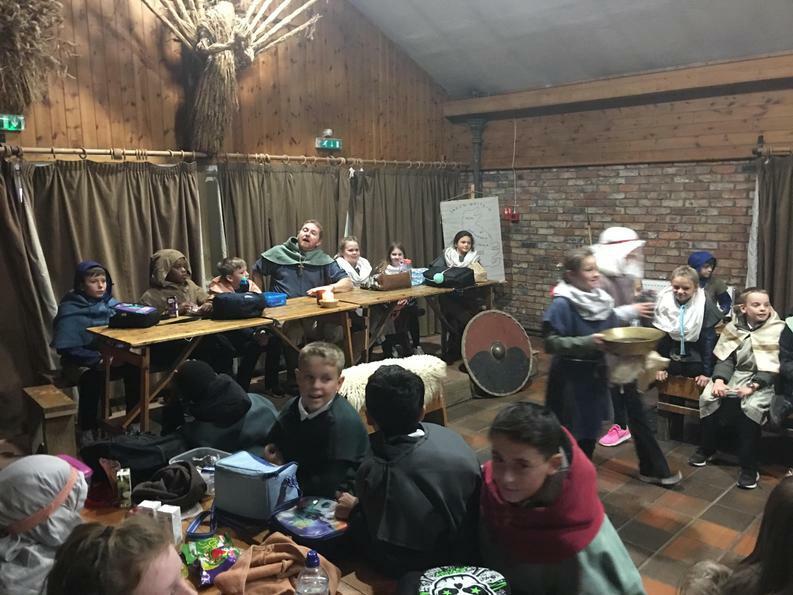 Come dinner time, after a hard mornings work, we retired to the Thanes banquet hall where we ate at the long tables. 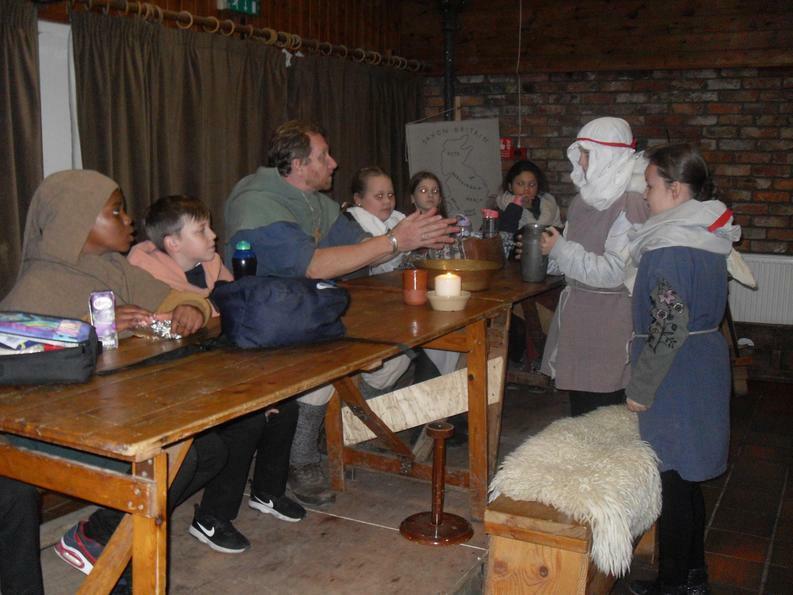 Some of us (the heads of the families) were even allowed to eat at the Thane's table! 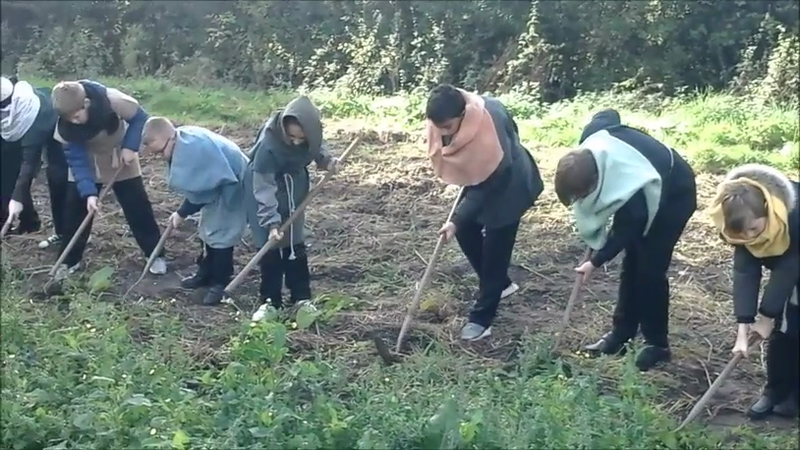 laziest of his new workers. 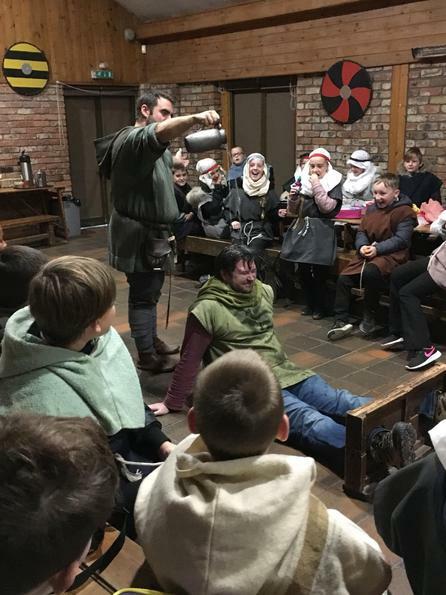 Mr McKittrick was locked in stocks and had water repeatedly poured over his head until he agreed to work harder. 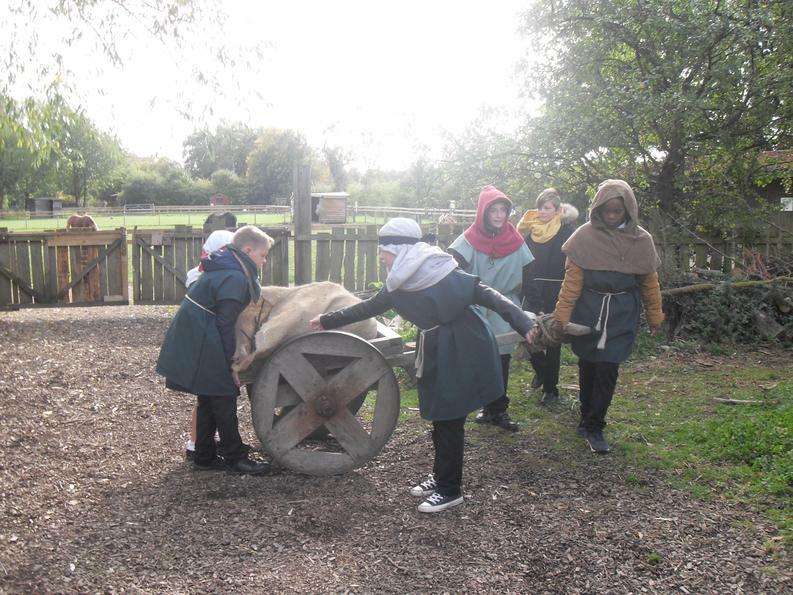 For some reason the children found this very entertaining and cheered lots! 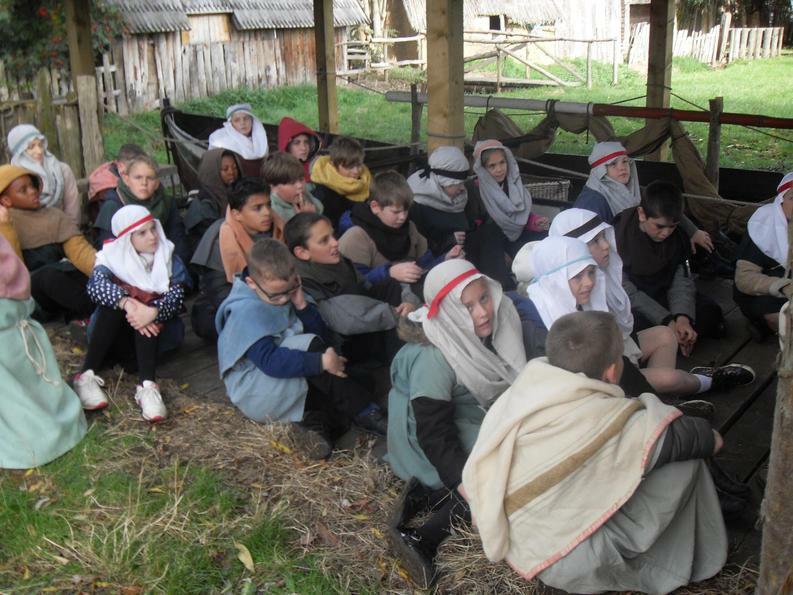 During the day, we were split into 3 groups or 'families'. 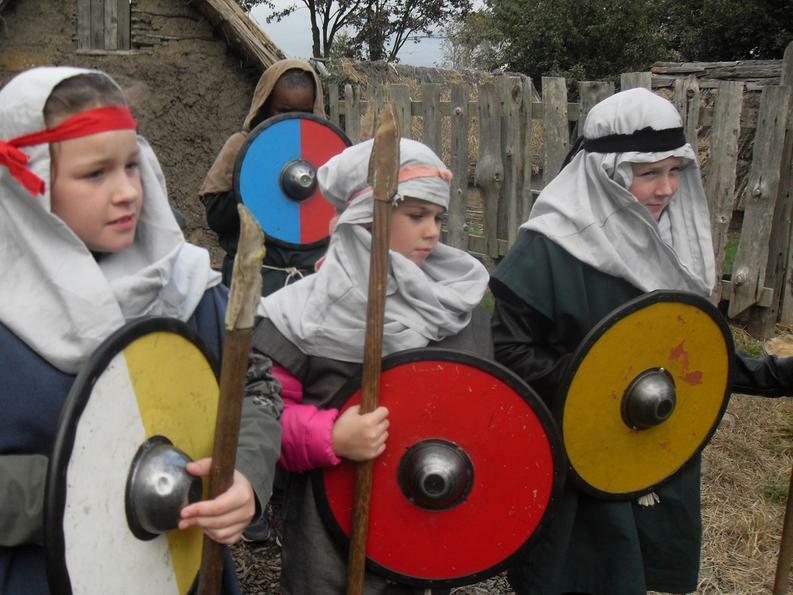 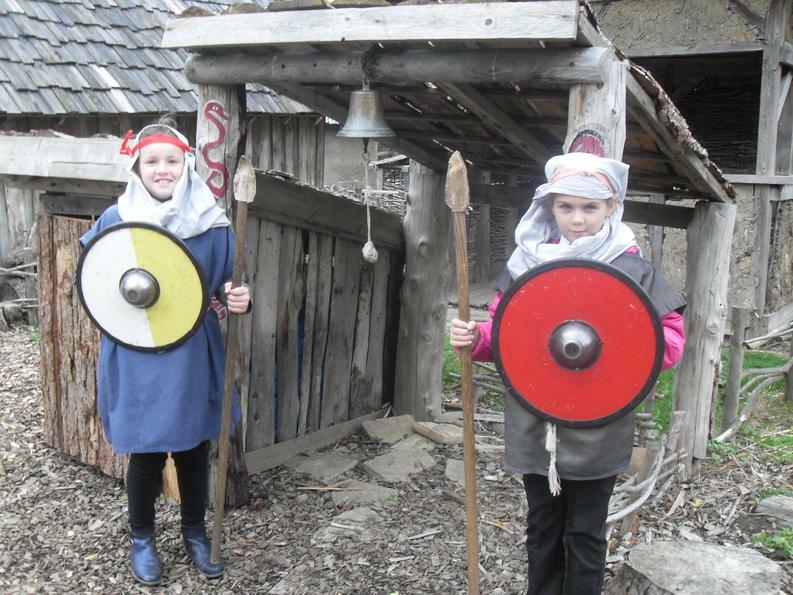 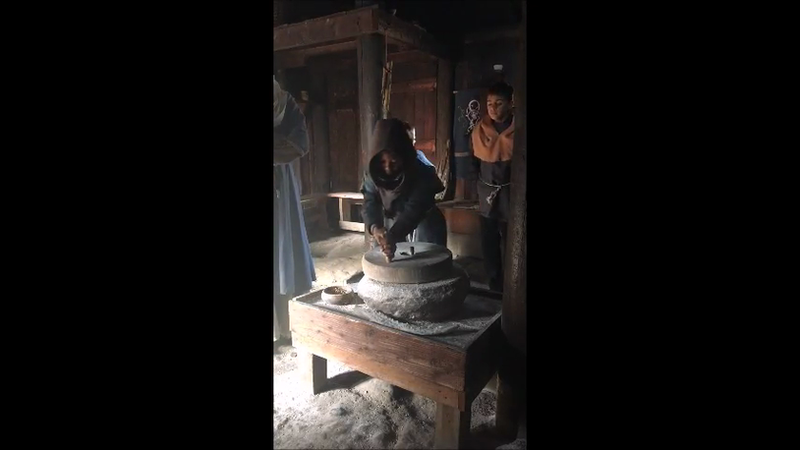 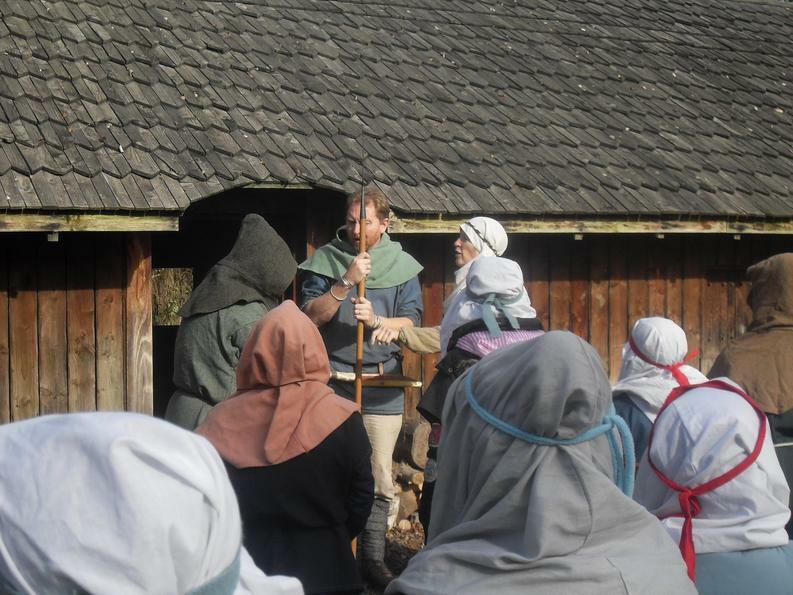 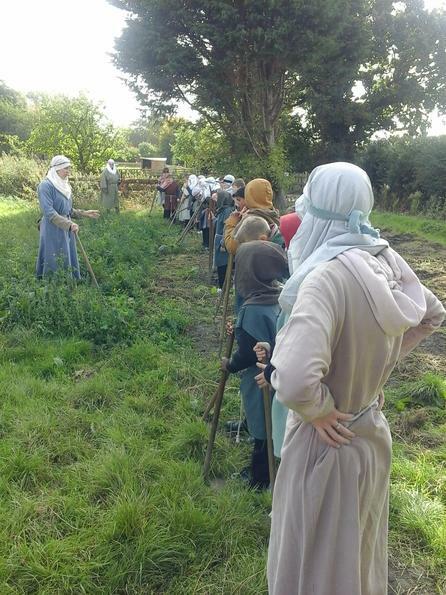 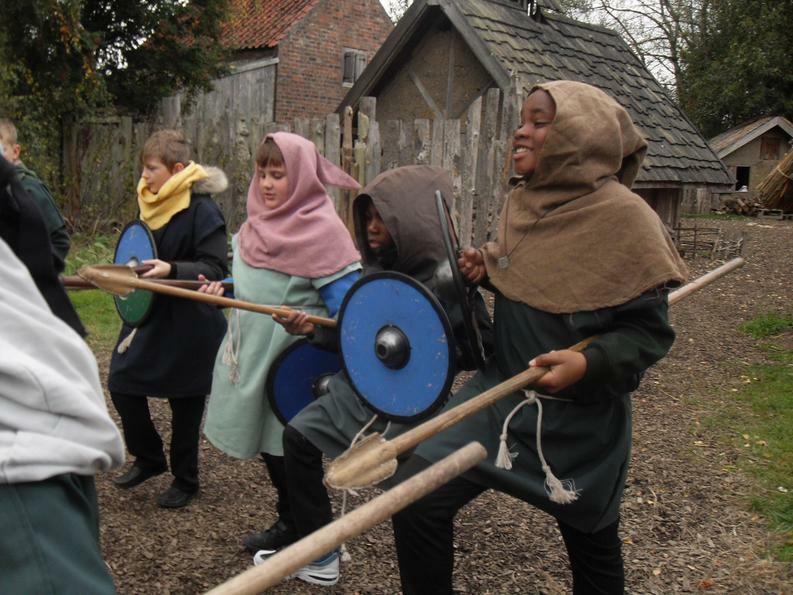 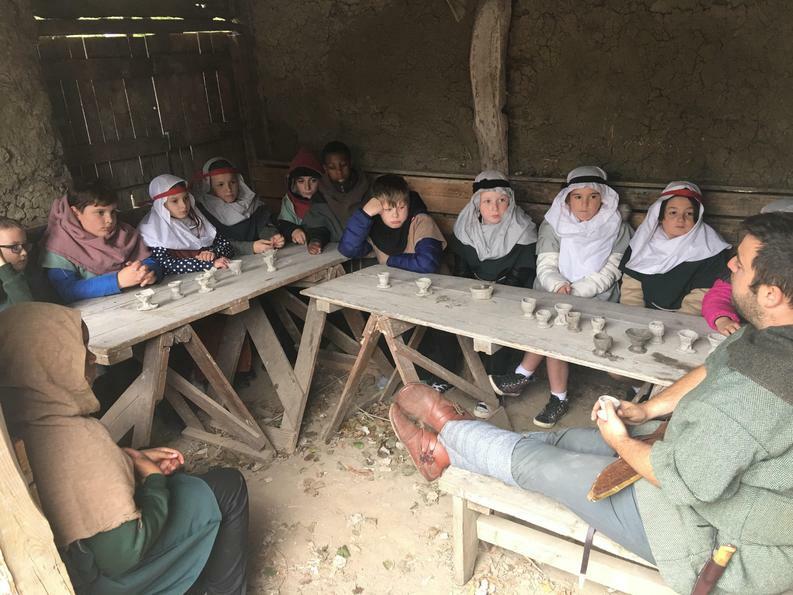 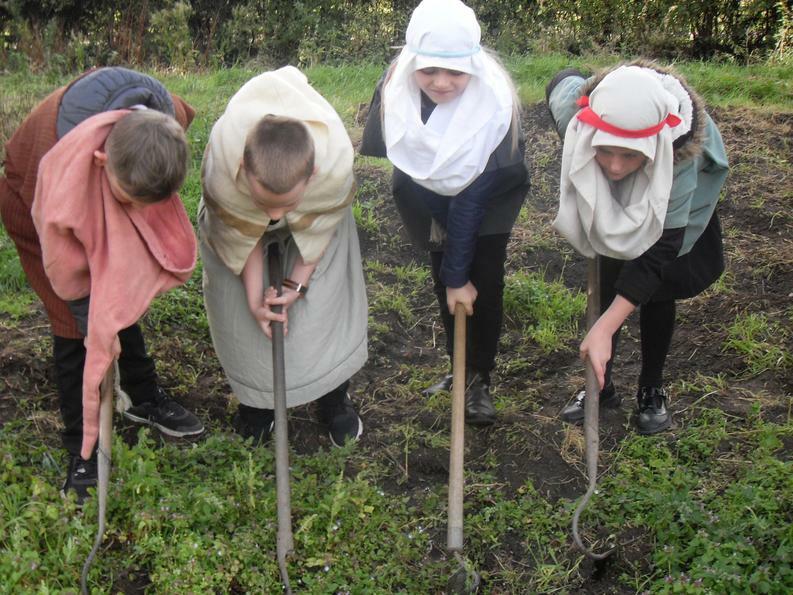 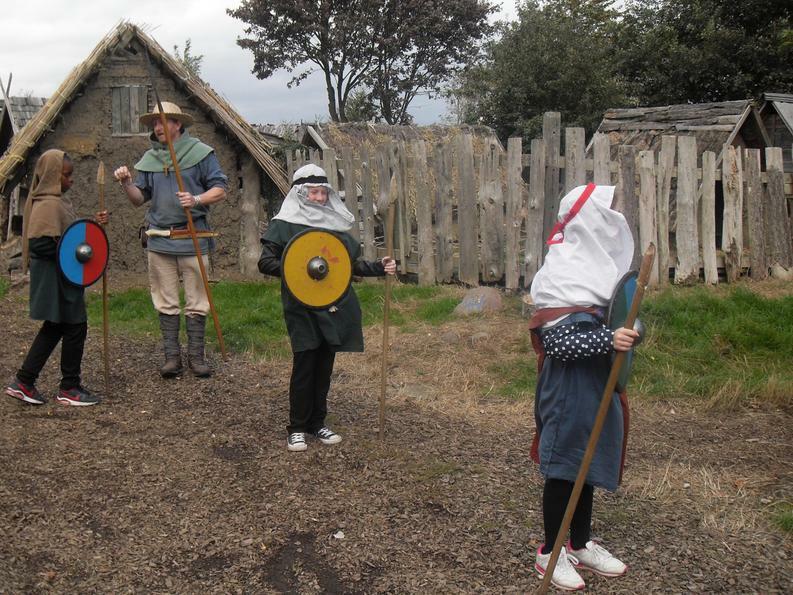 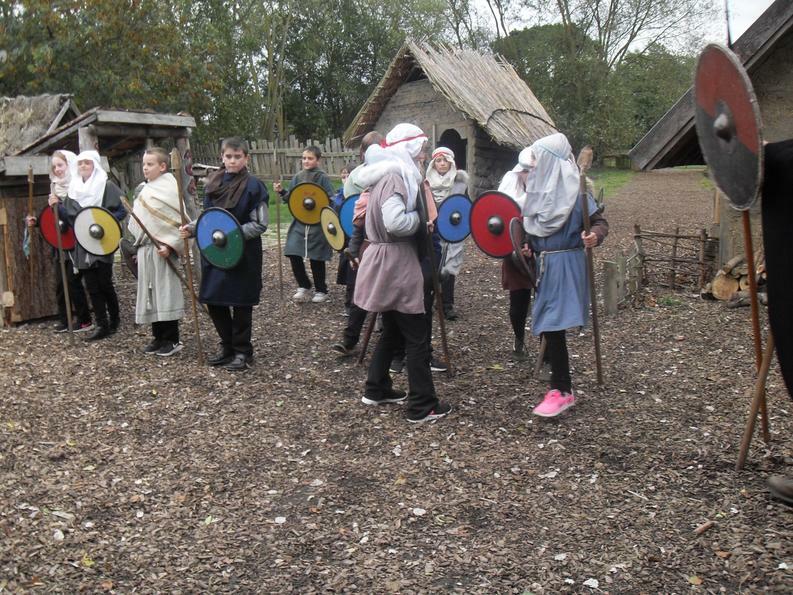 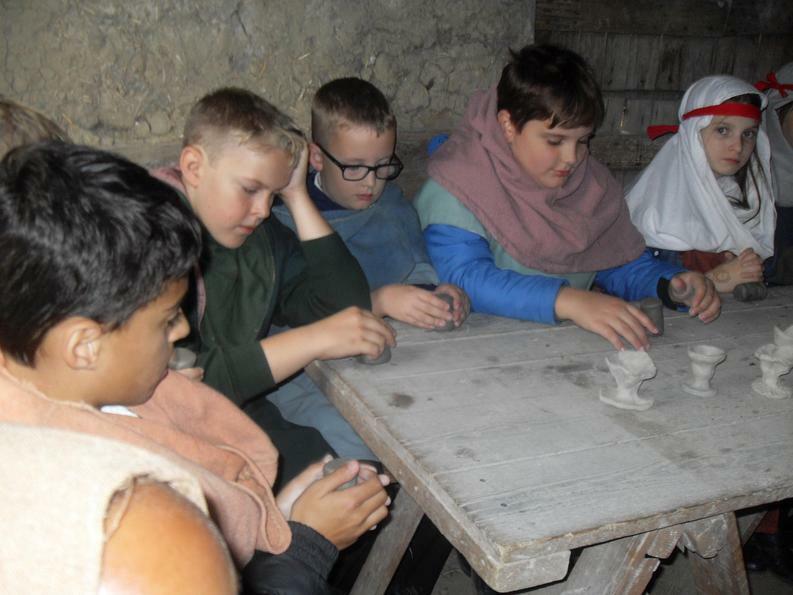 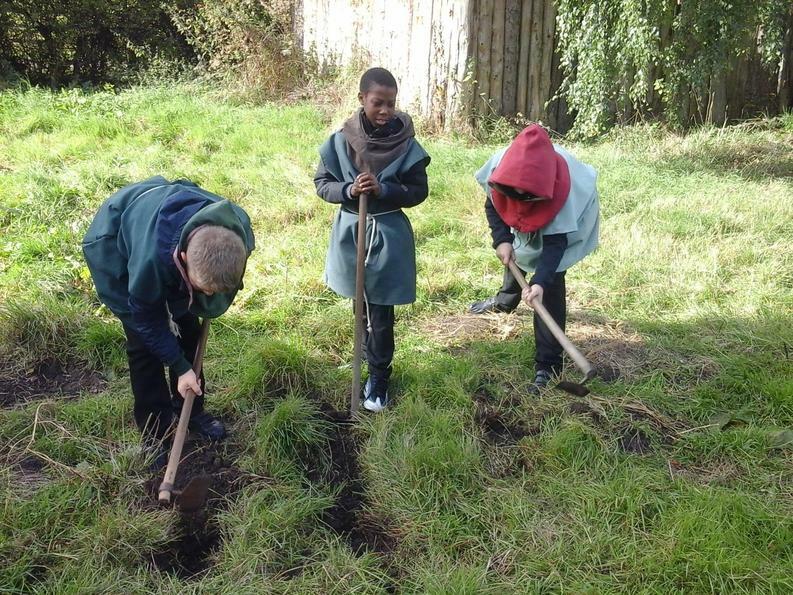 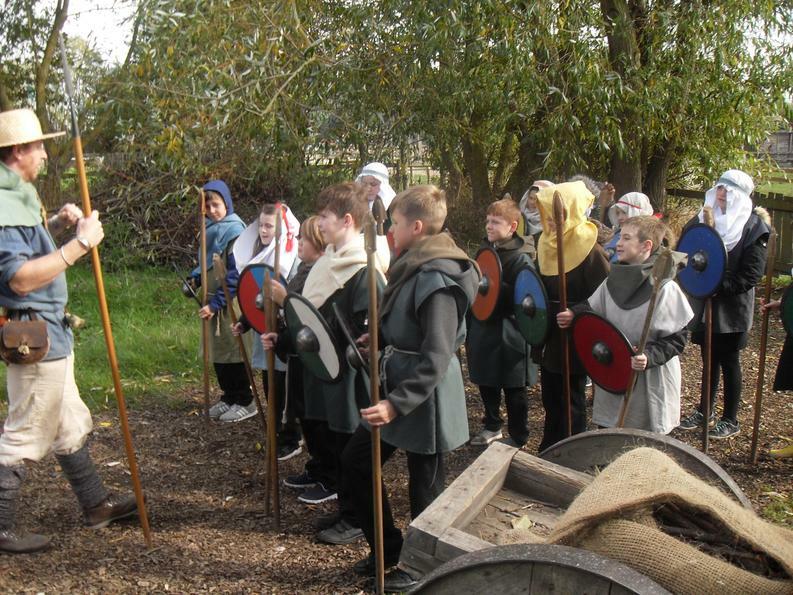 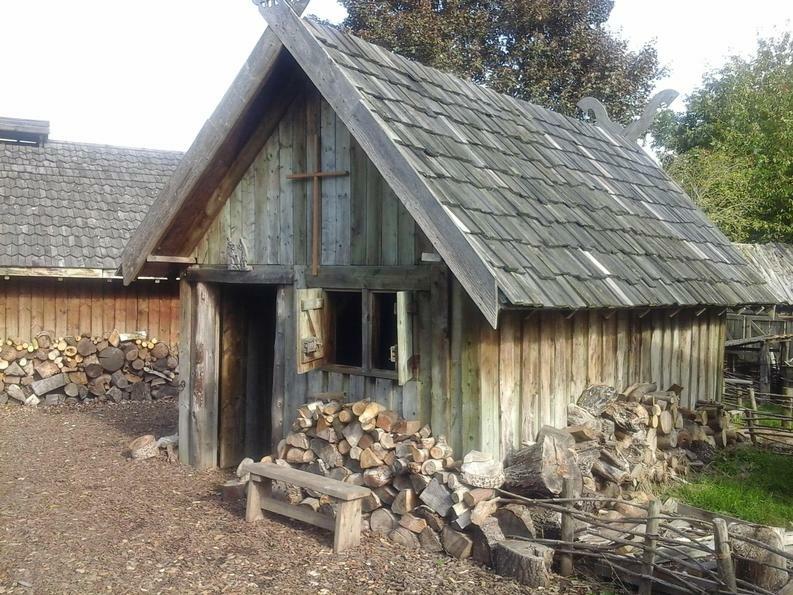 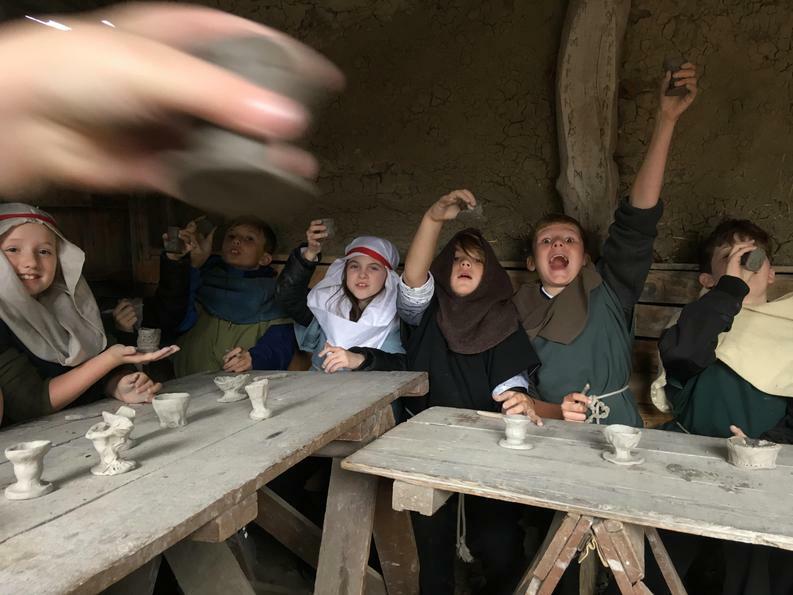 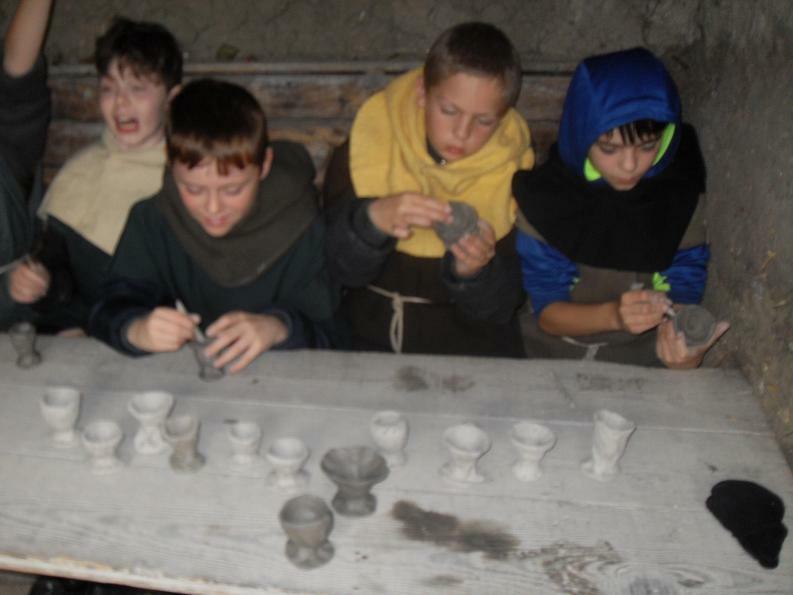 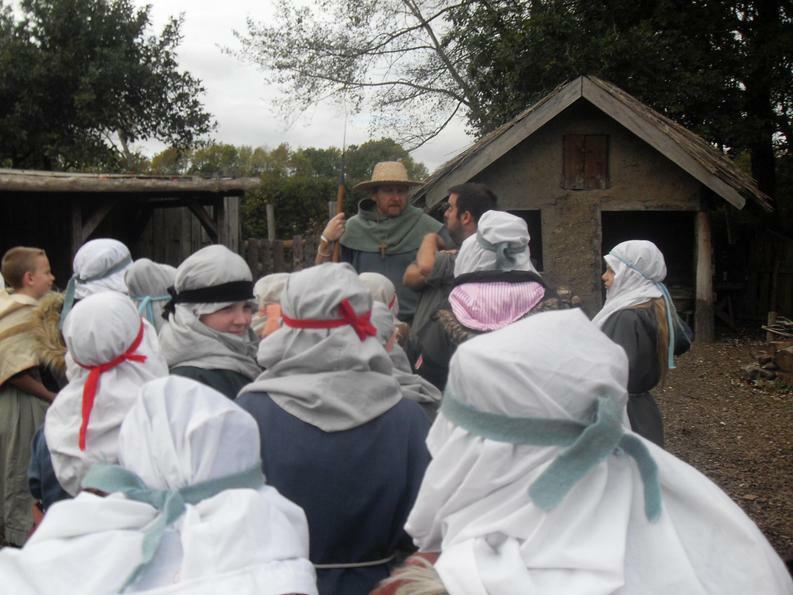 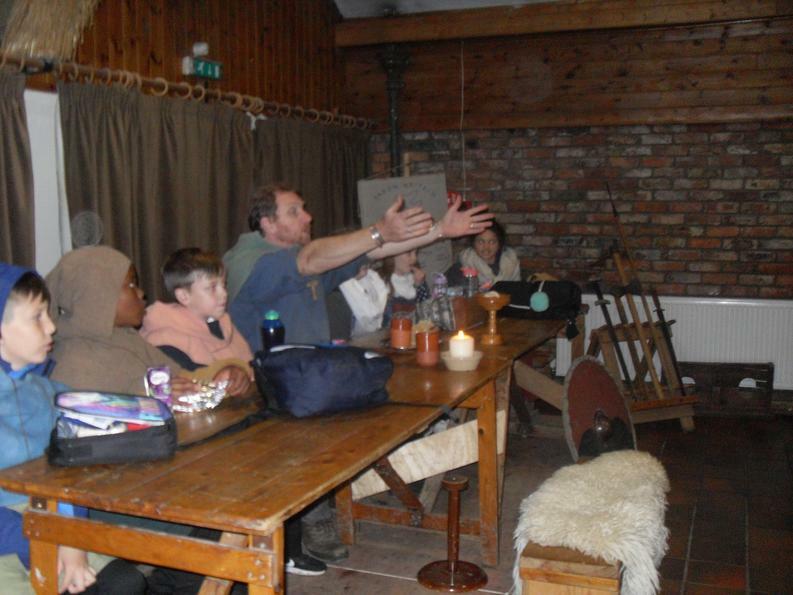 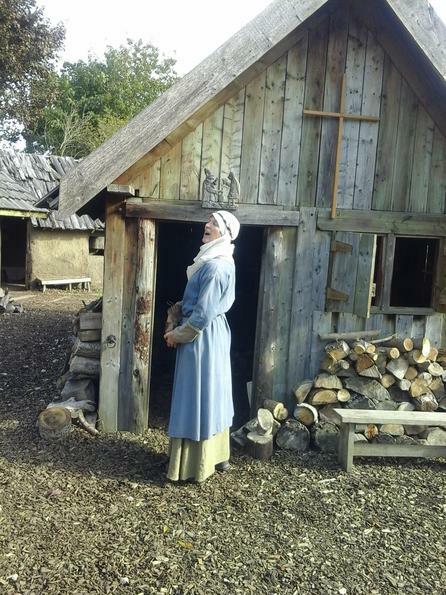 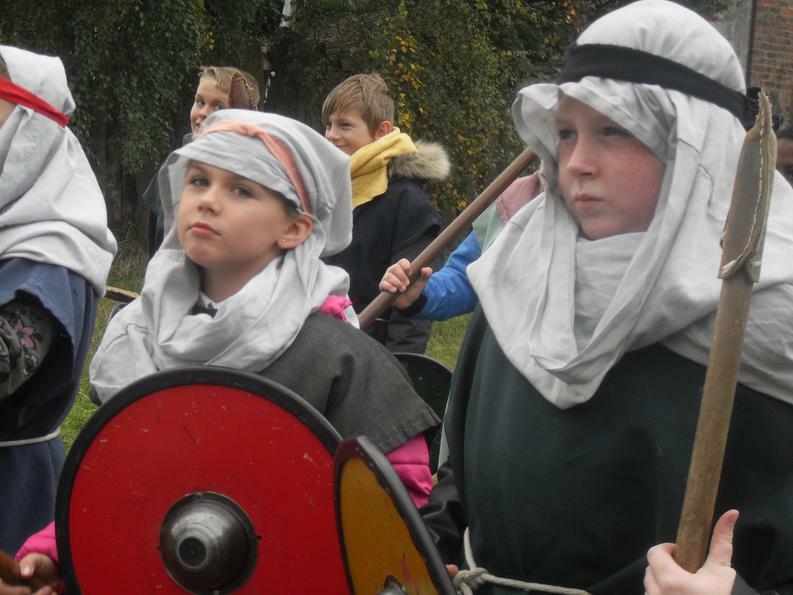 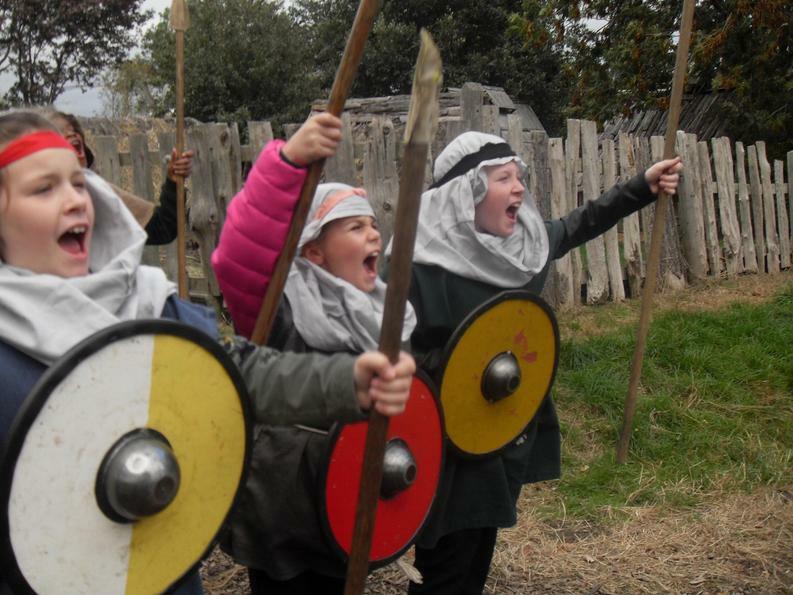 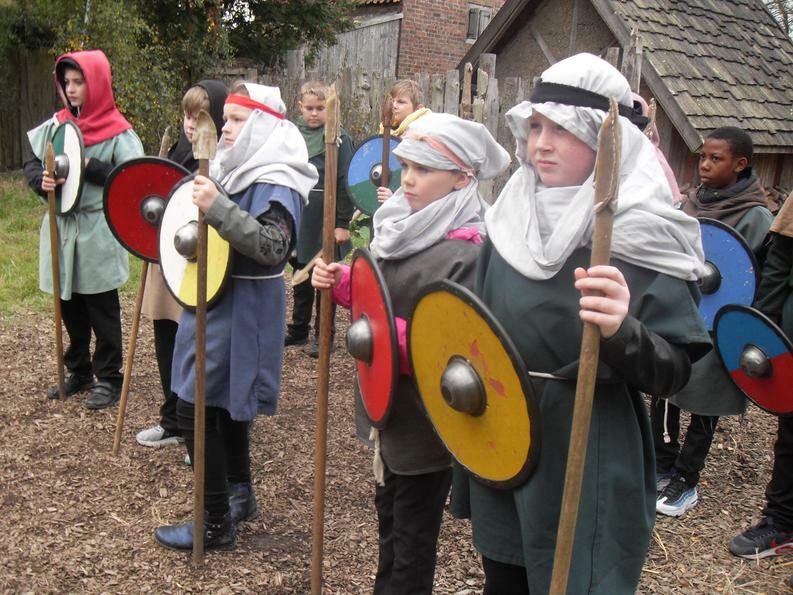 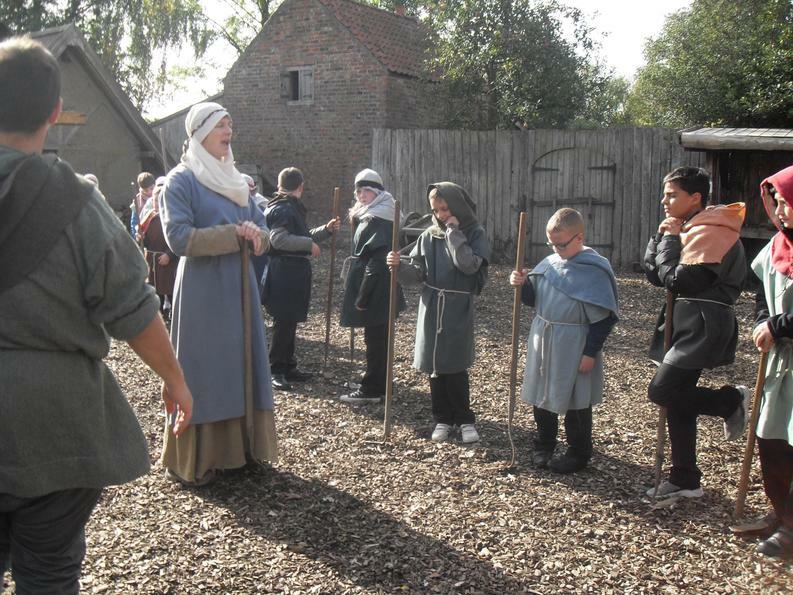 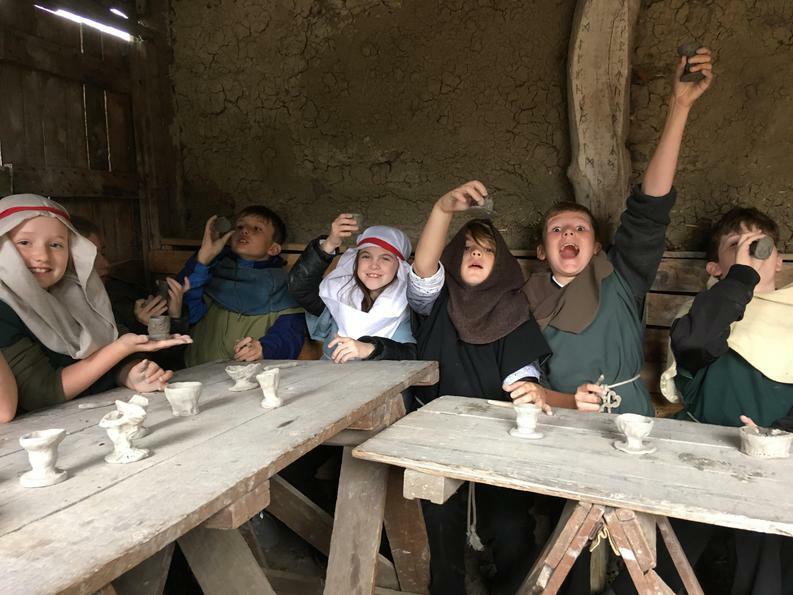 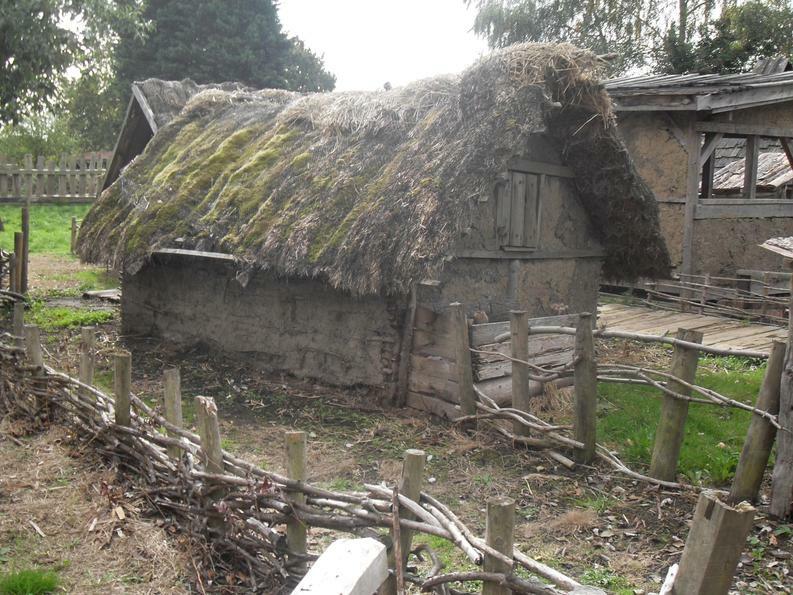 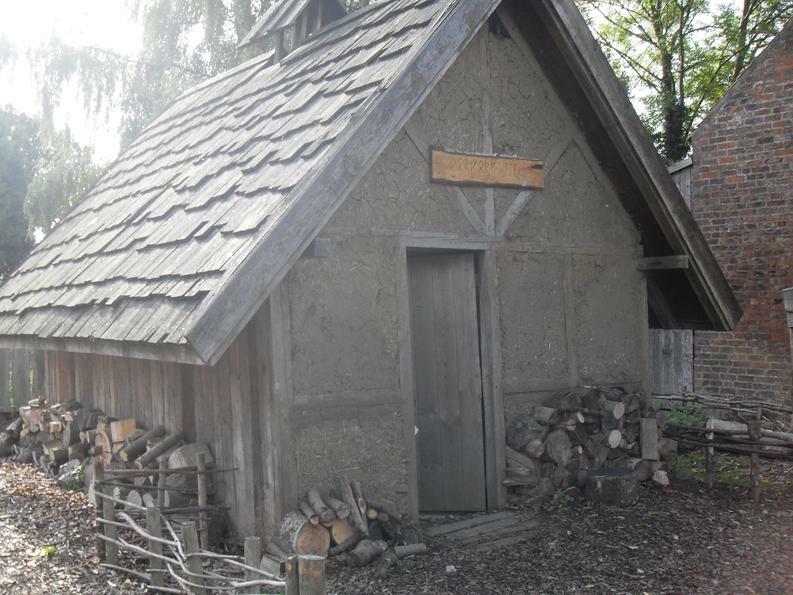 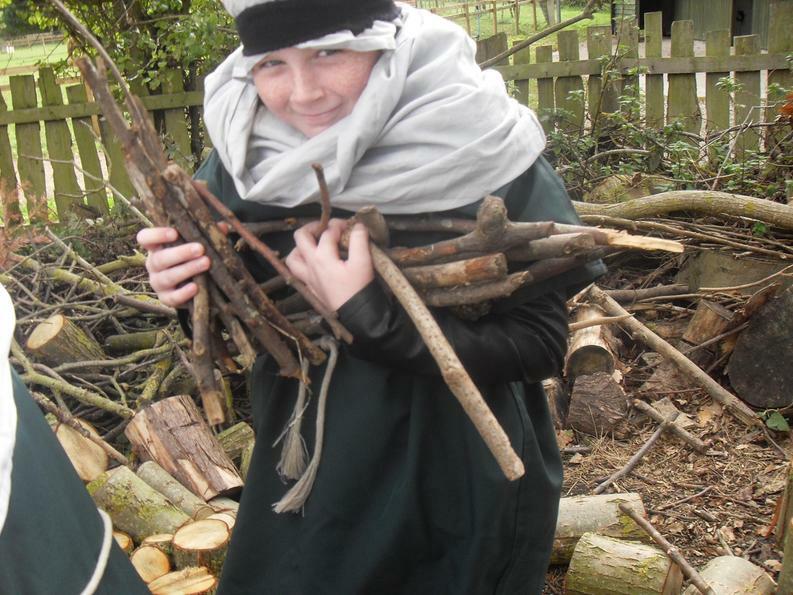 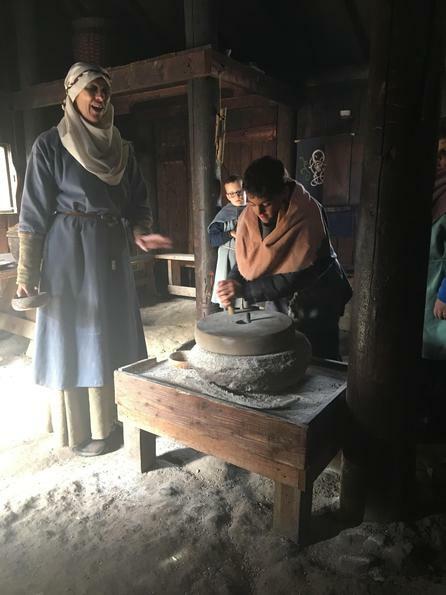 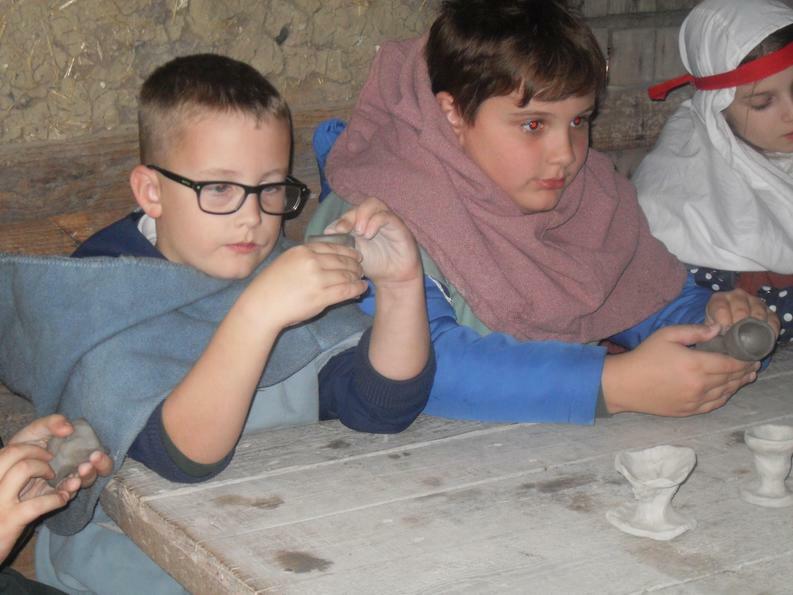 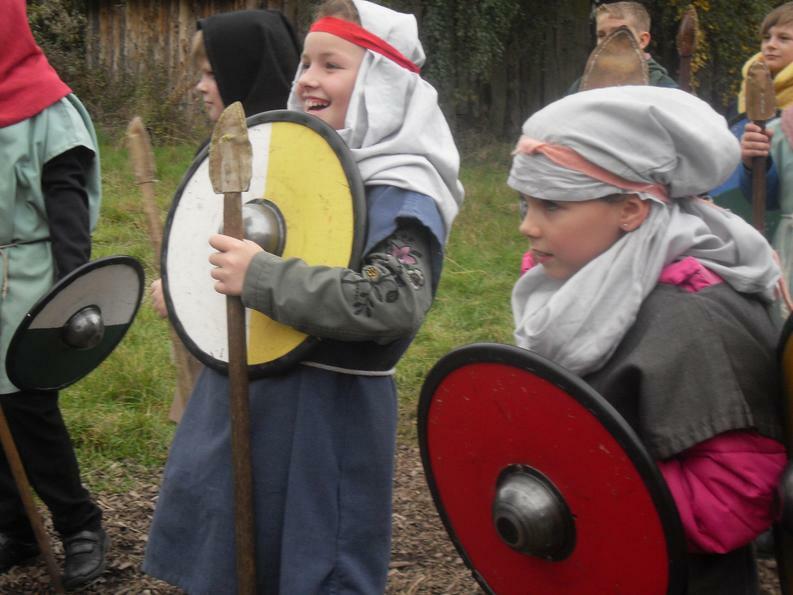 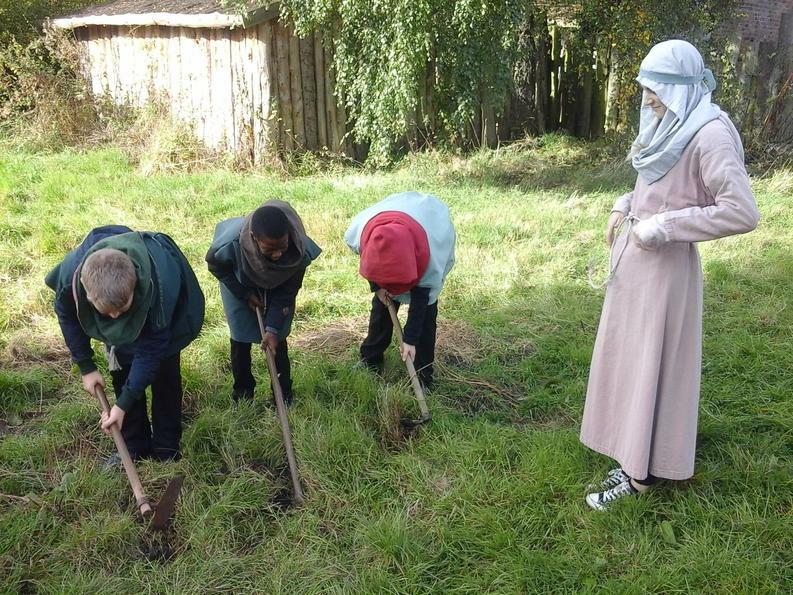 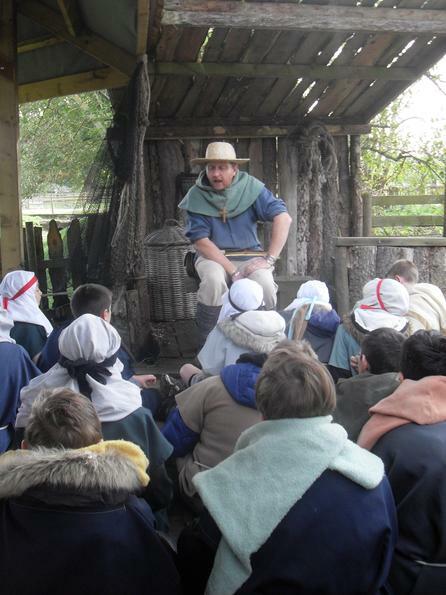 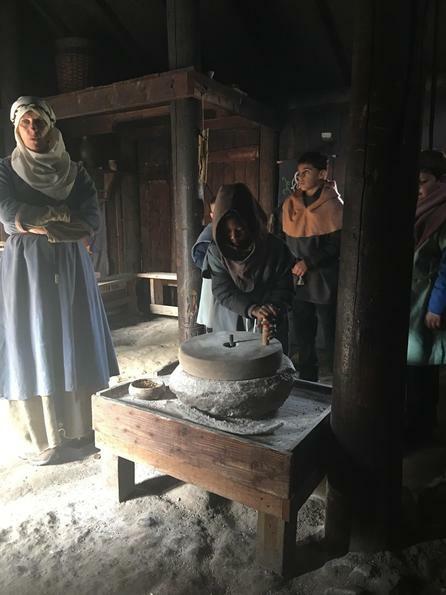 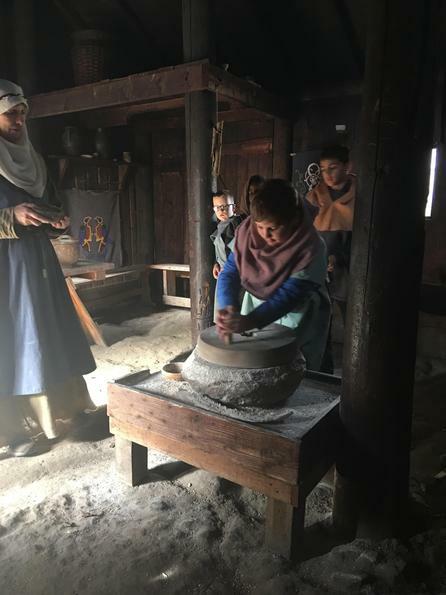 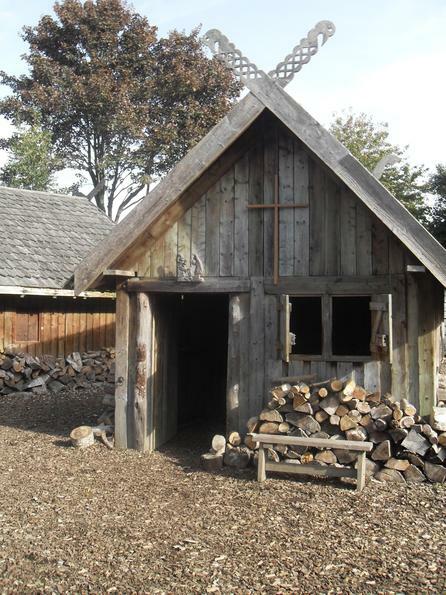 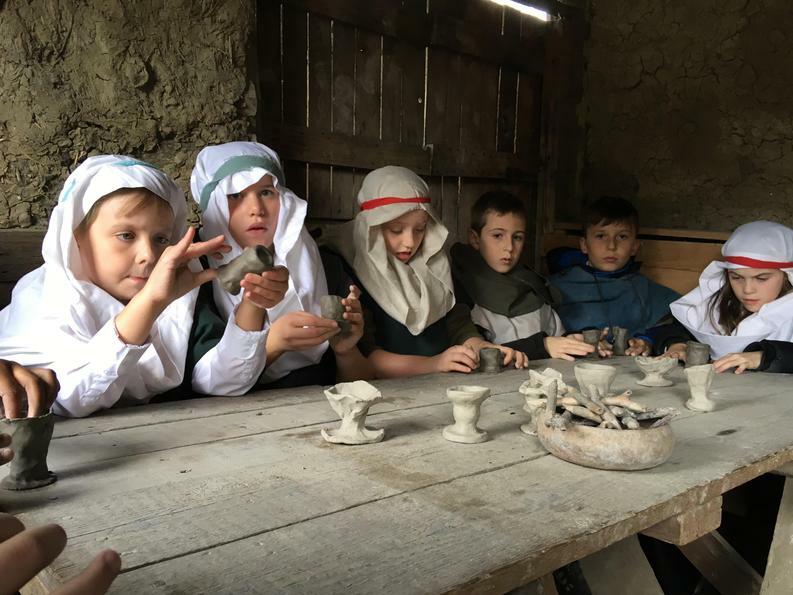 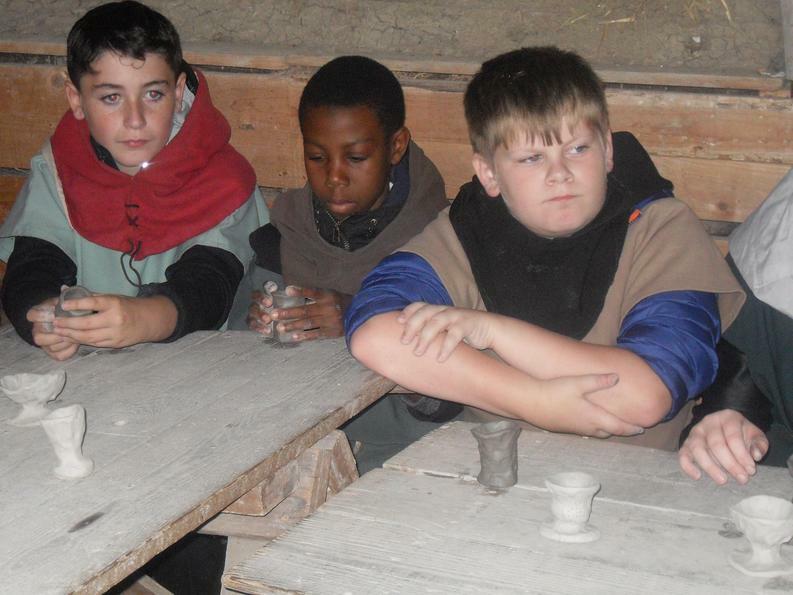 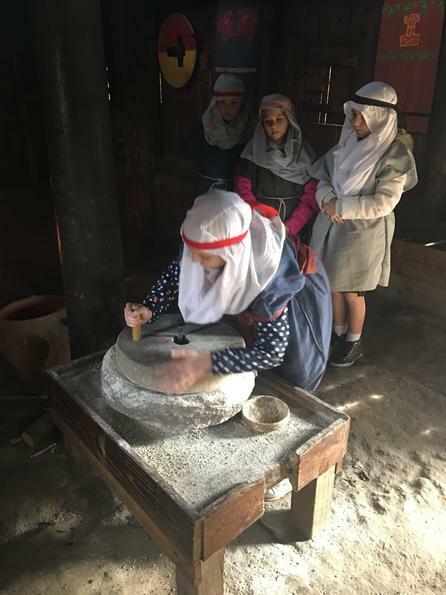 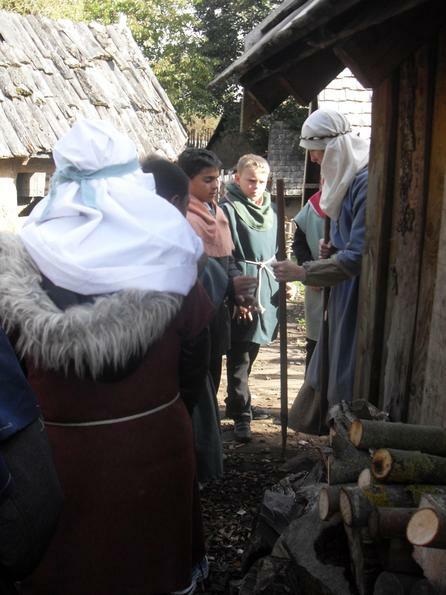 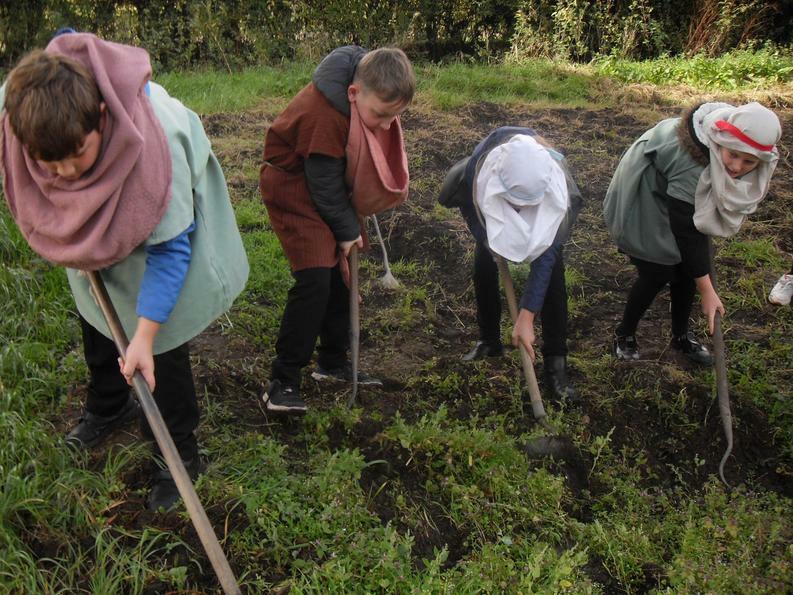 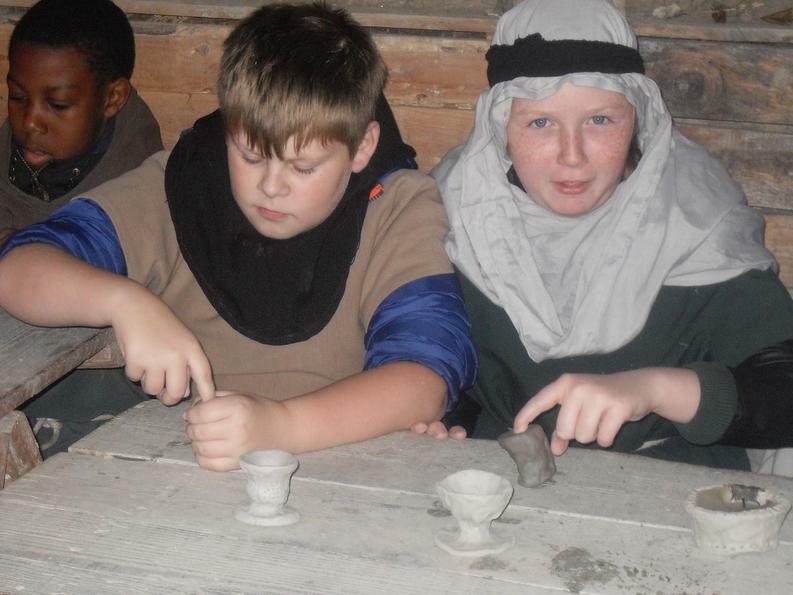 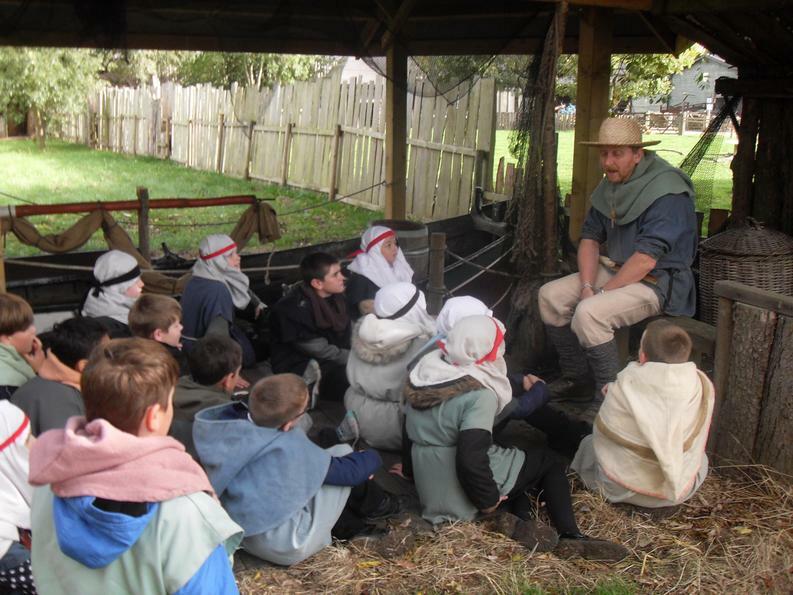 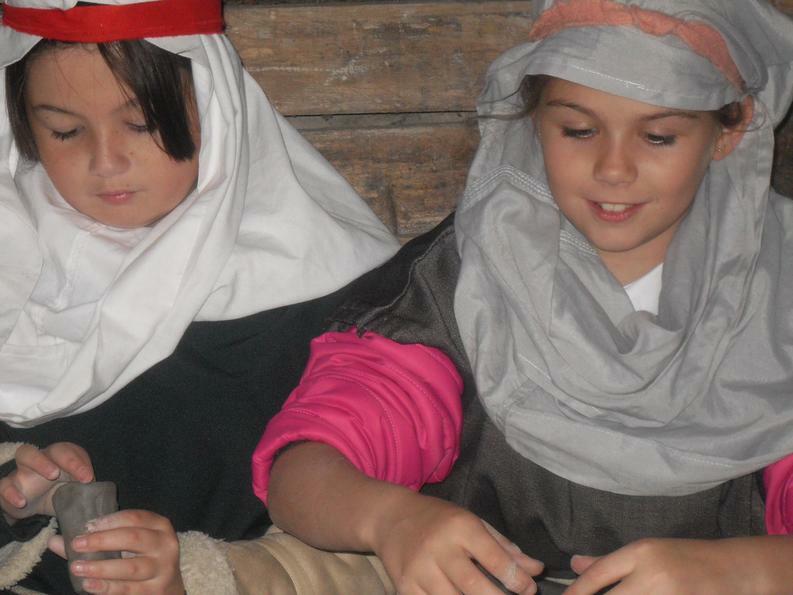 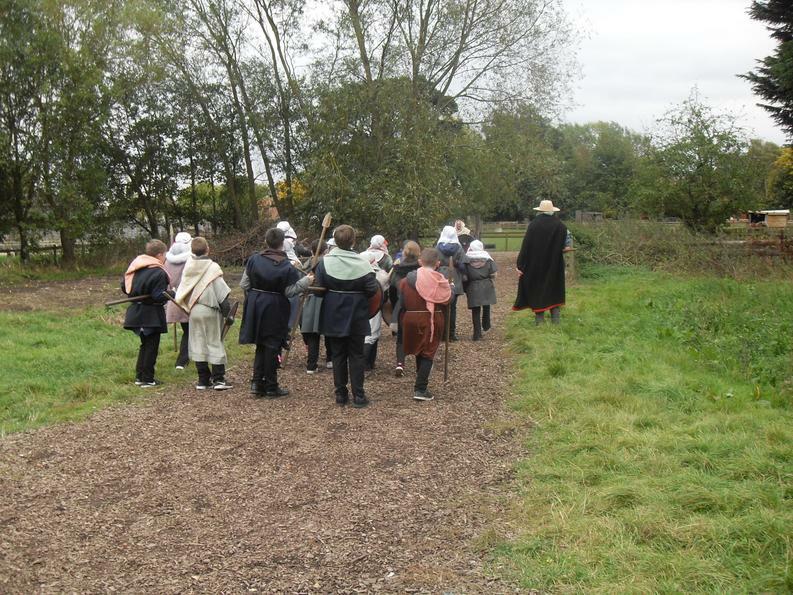 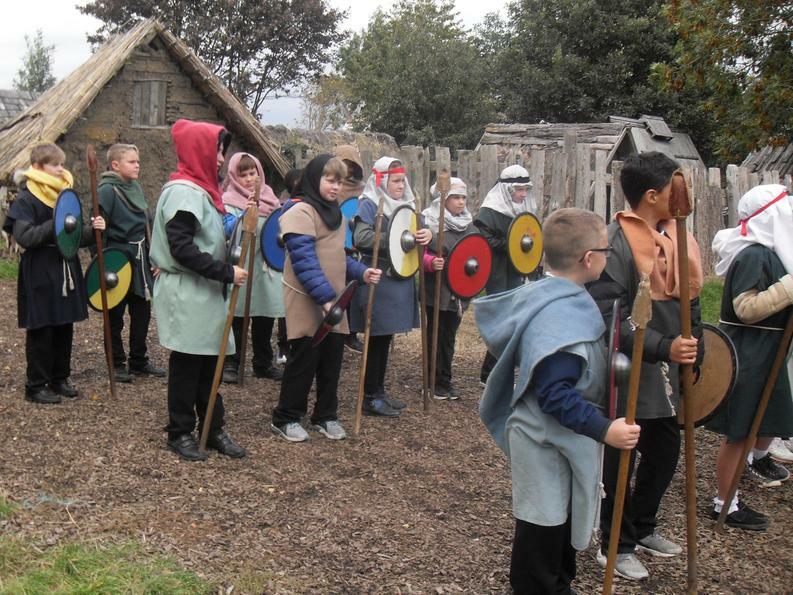 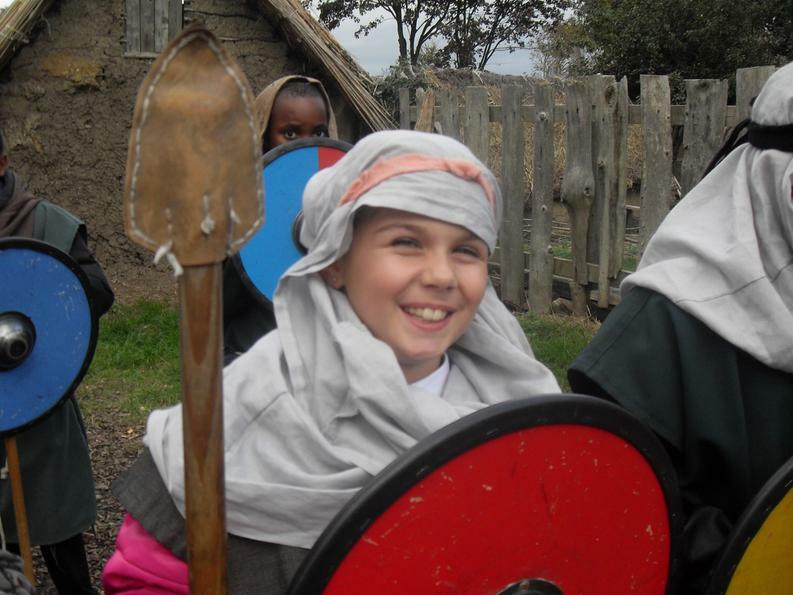 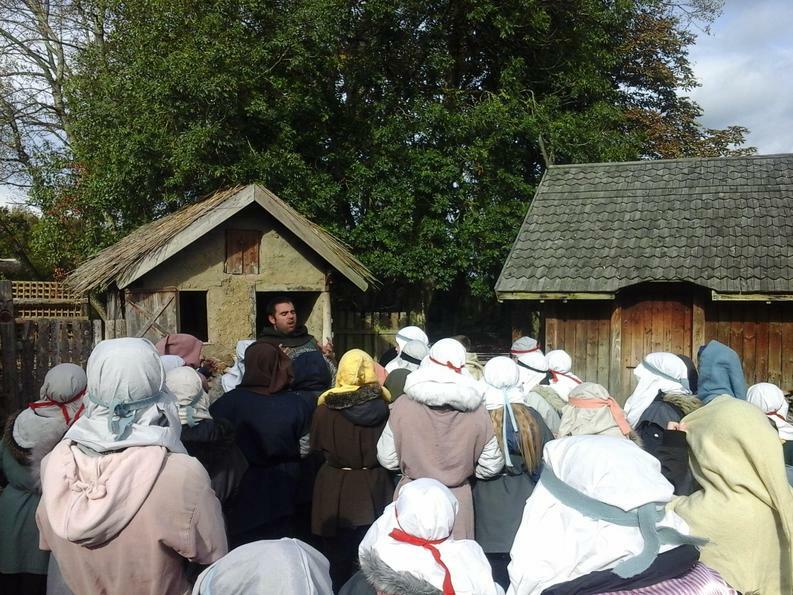 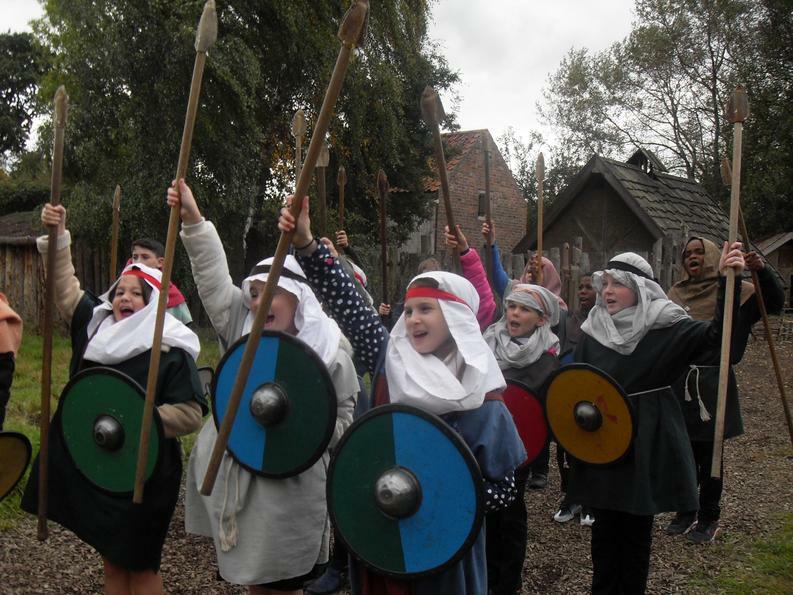 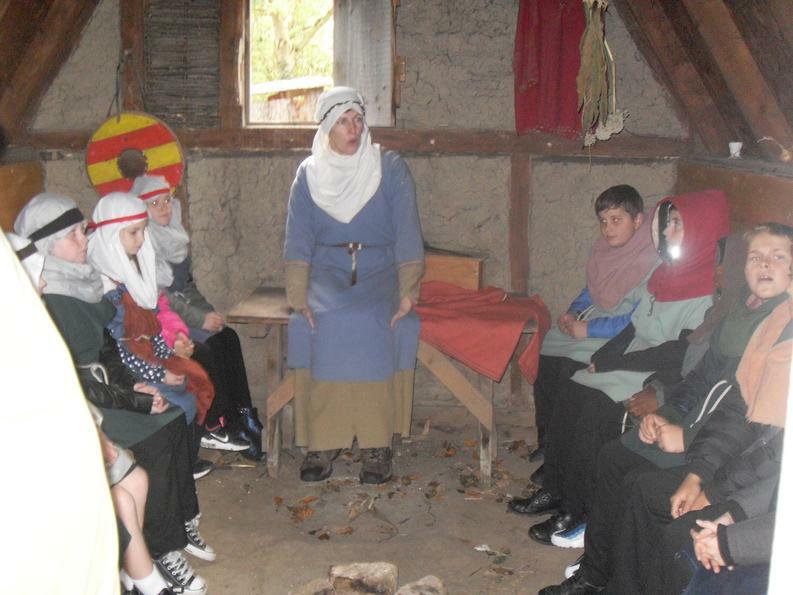 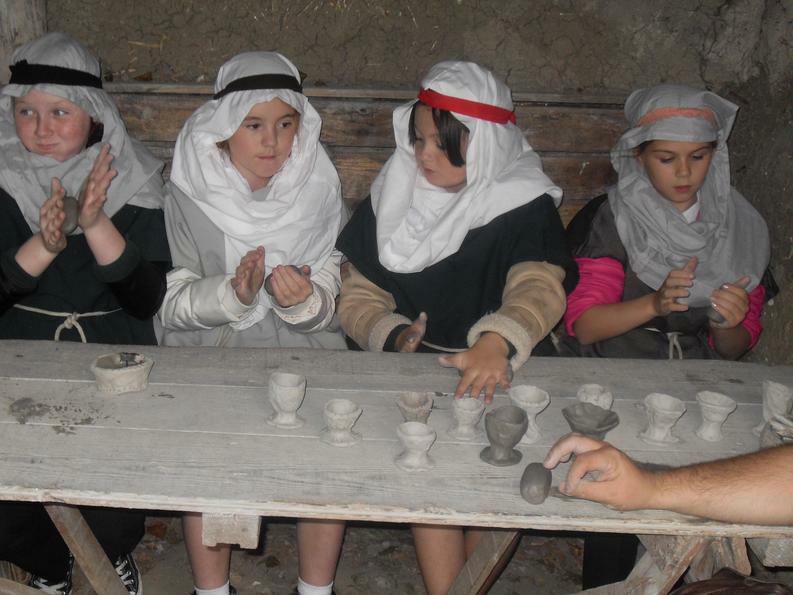 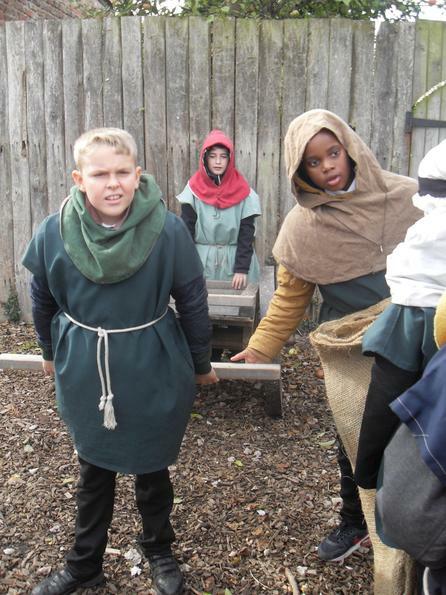 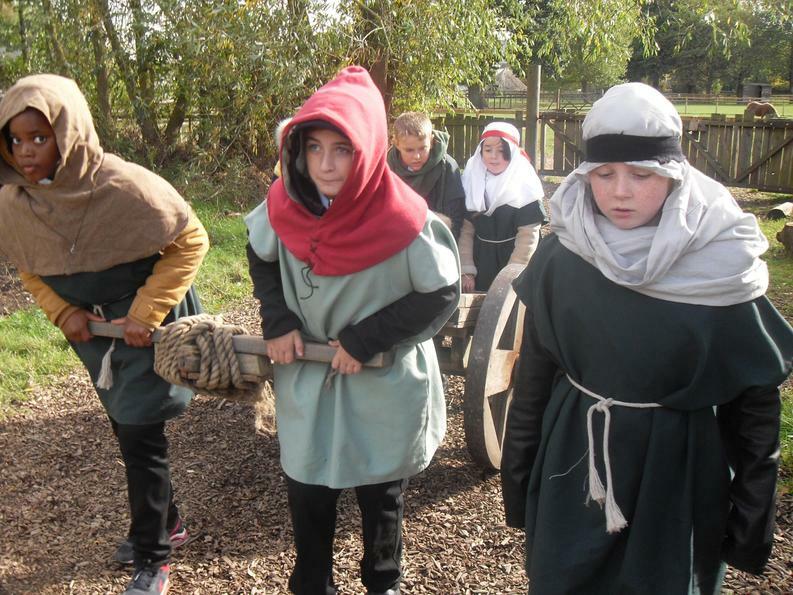 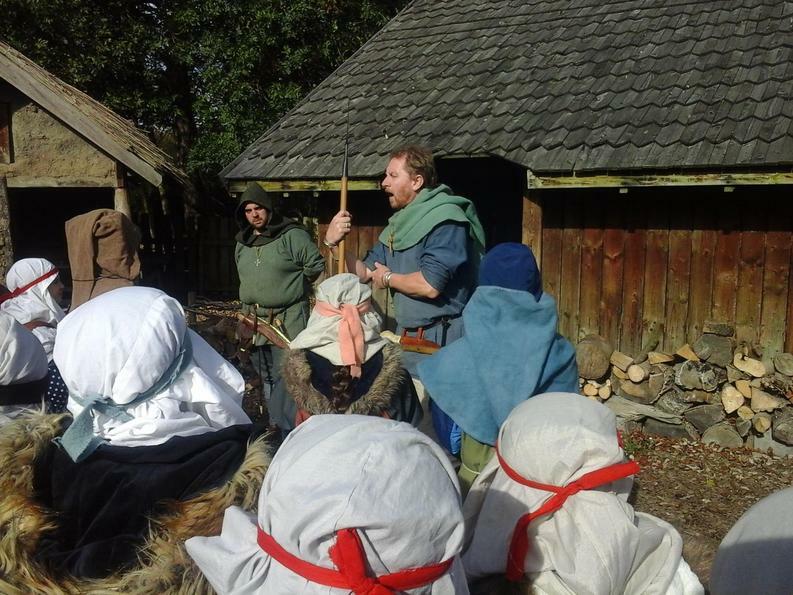 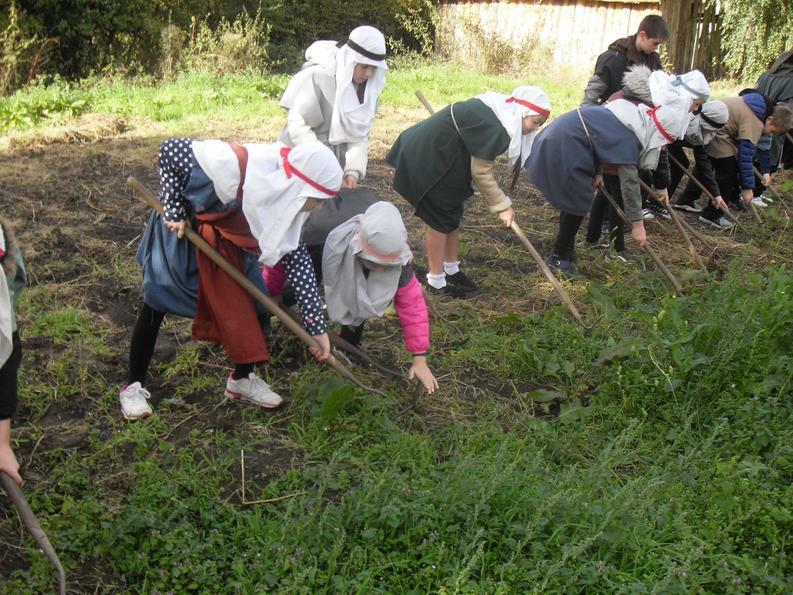 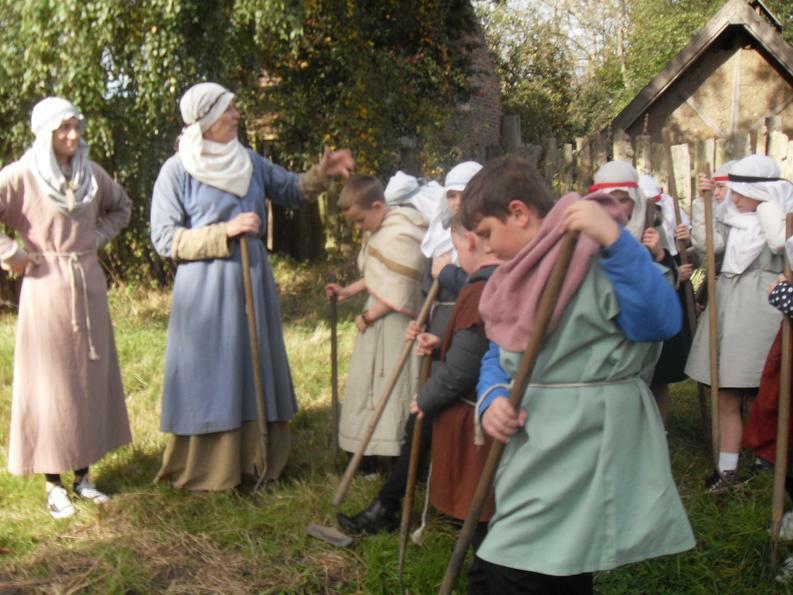 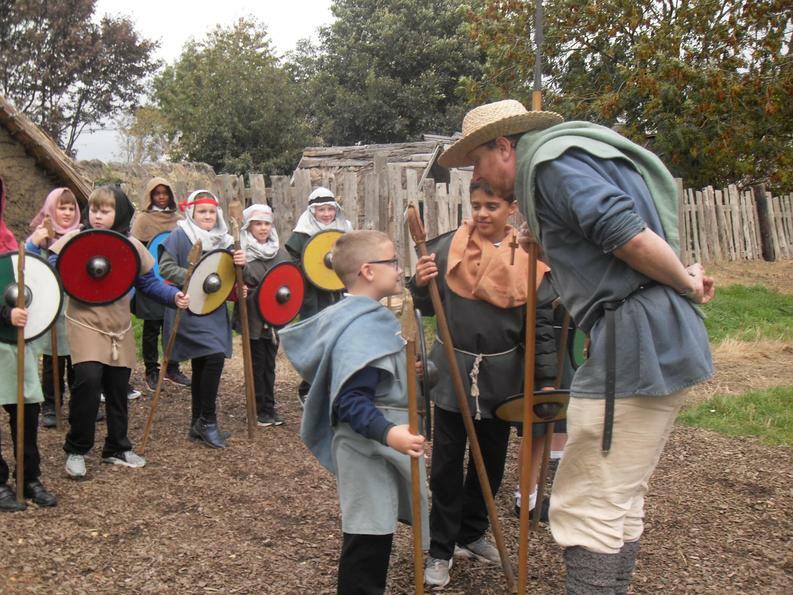 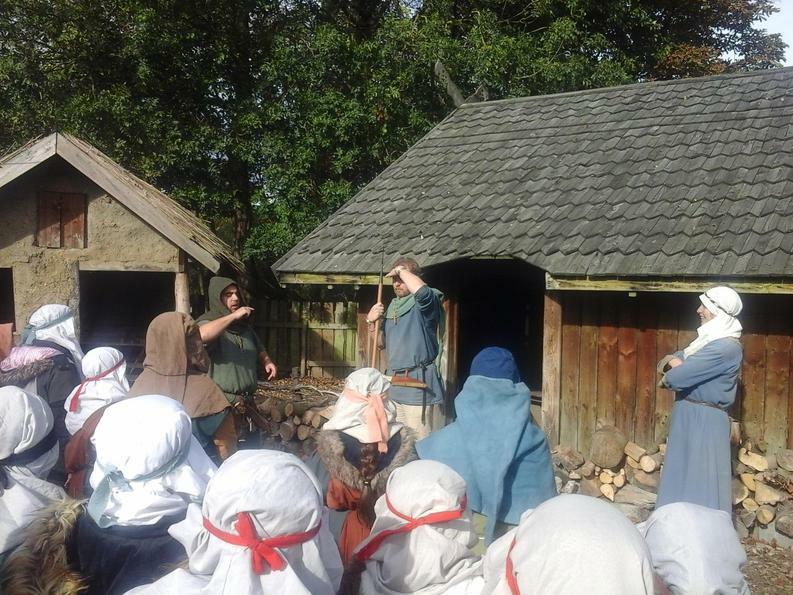 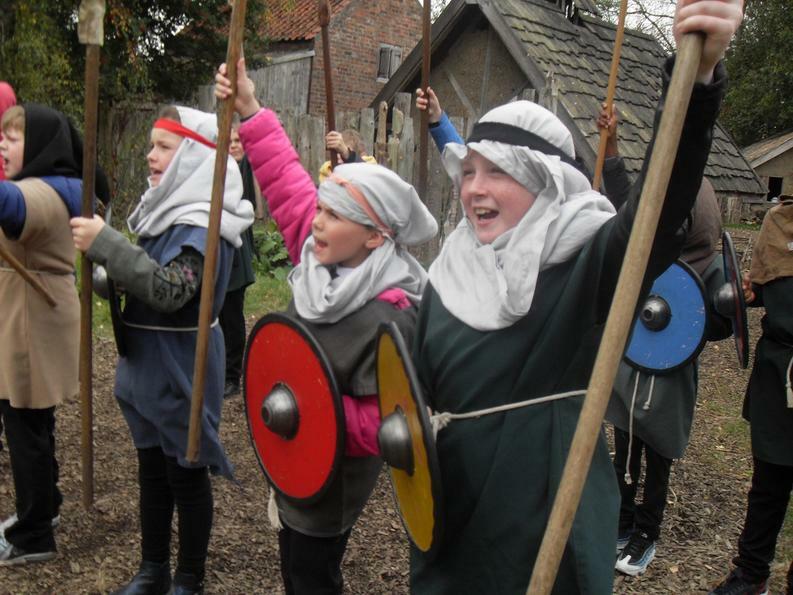 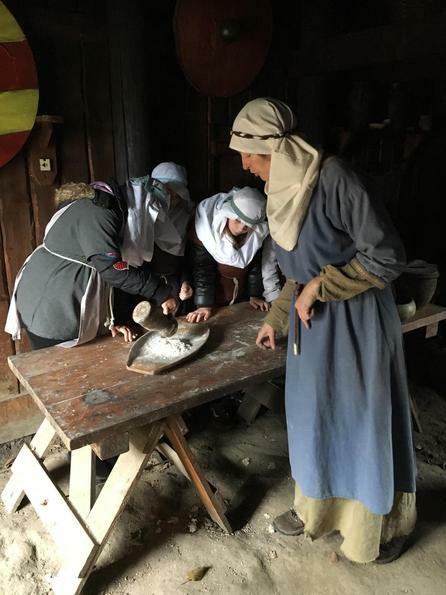 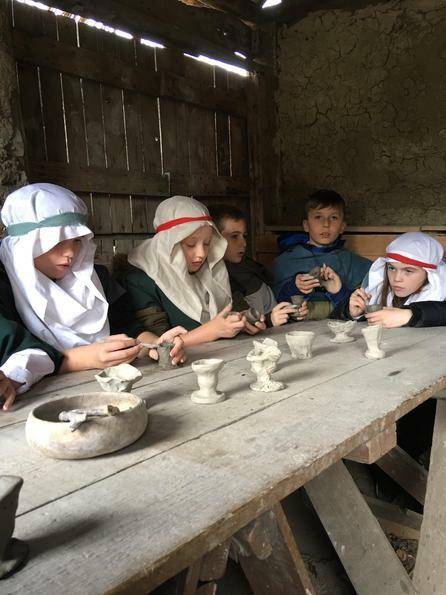 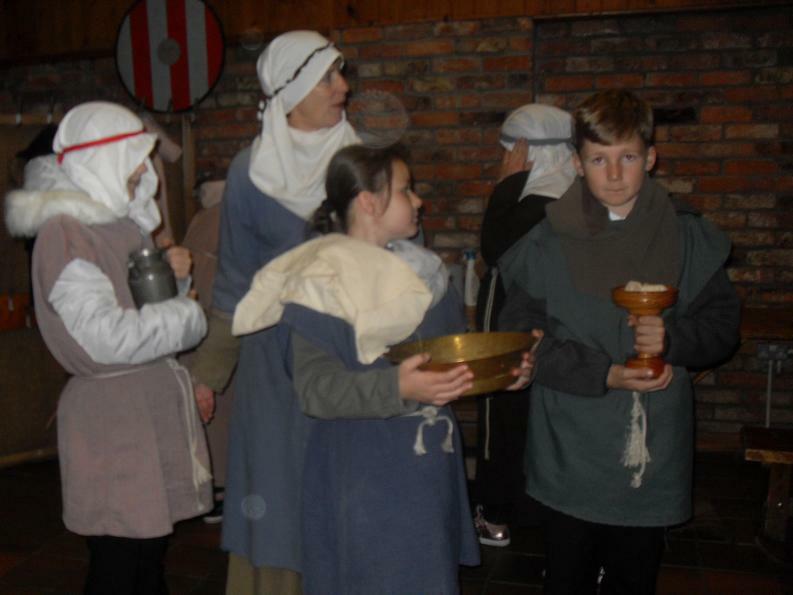 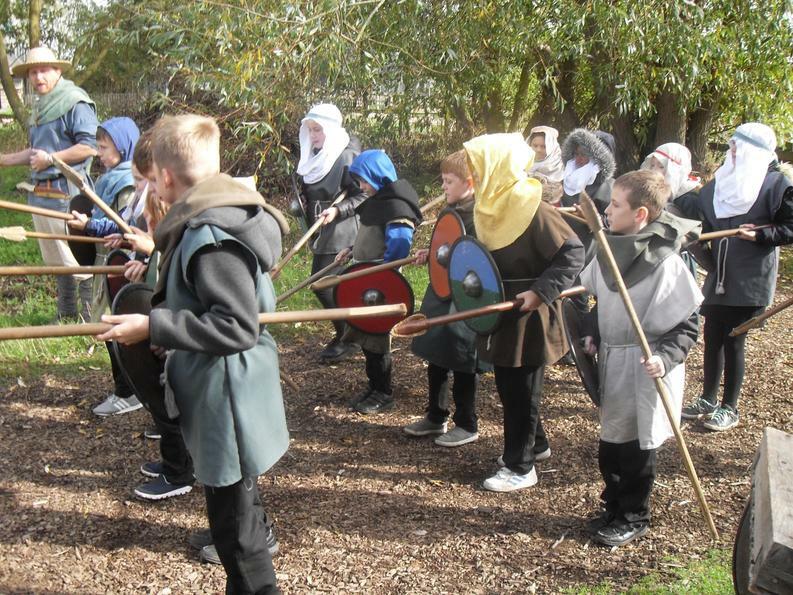 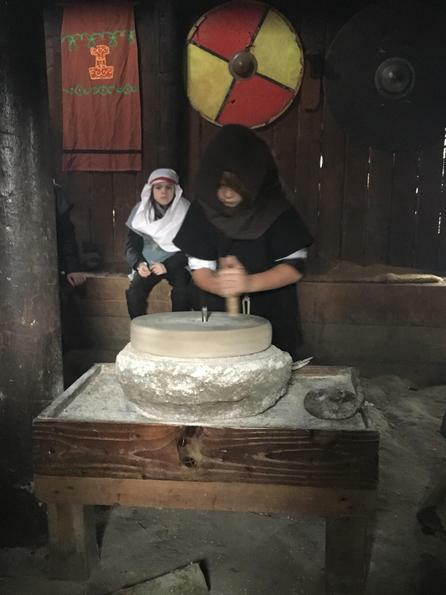 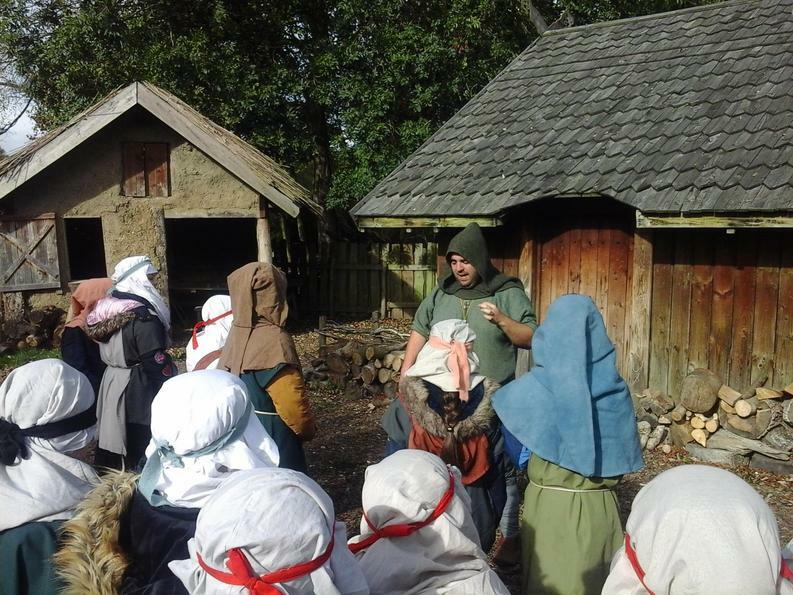 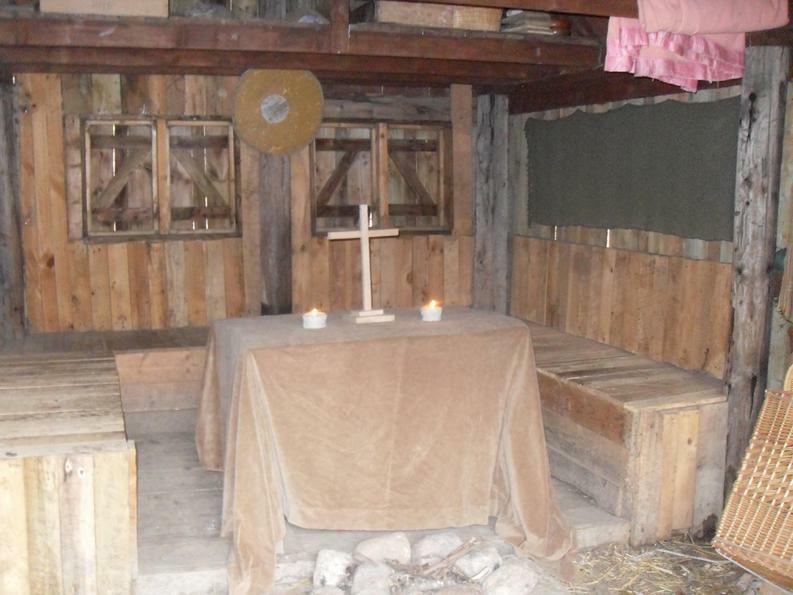 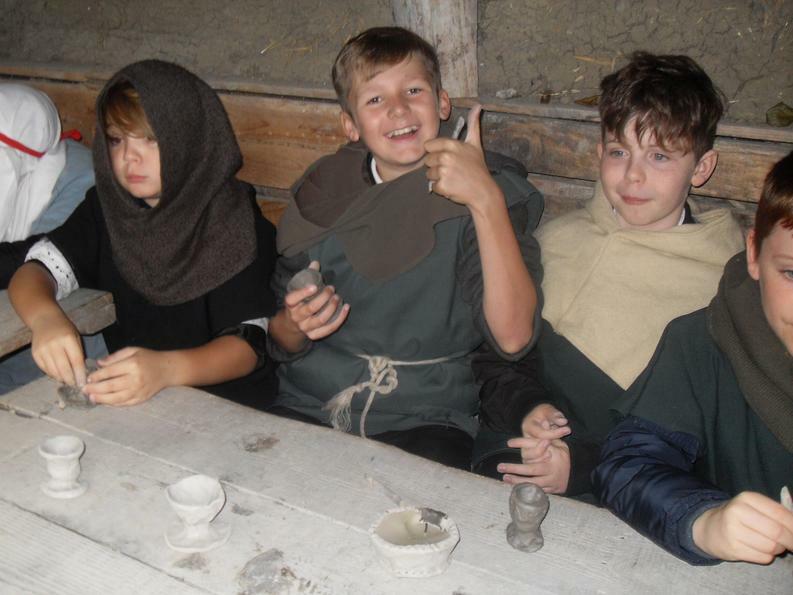 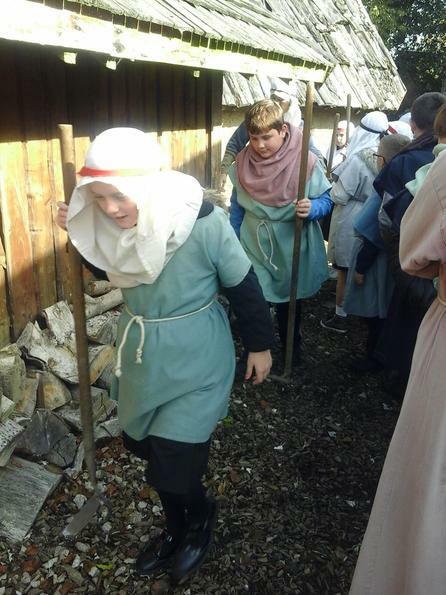 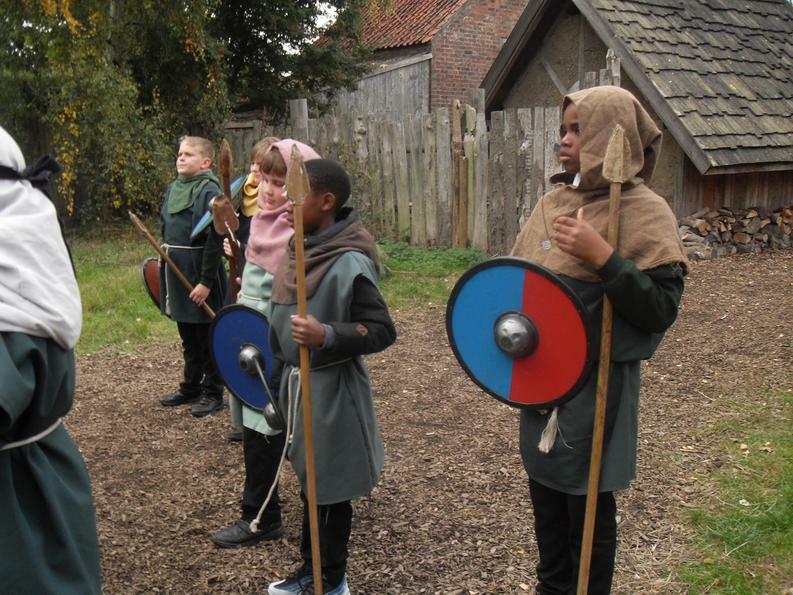 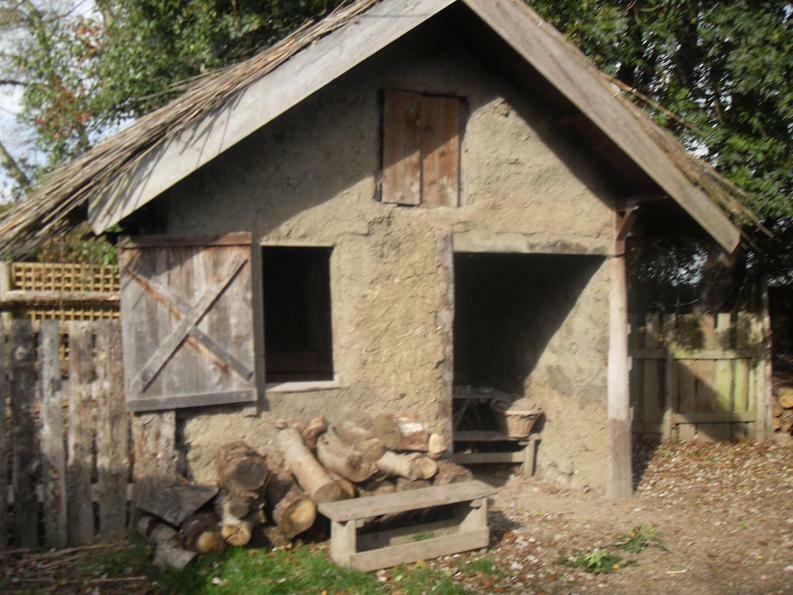 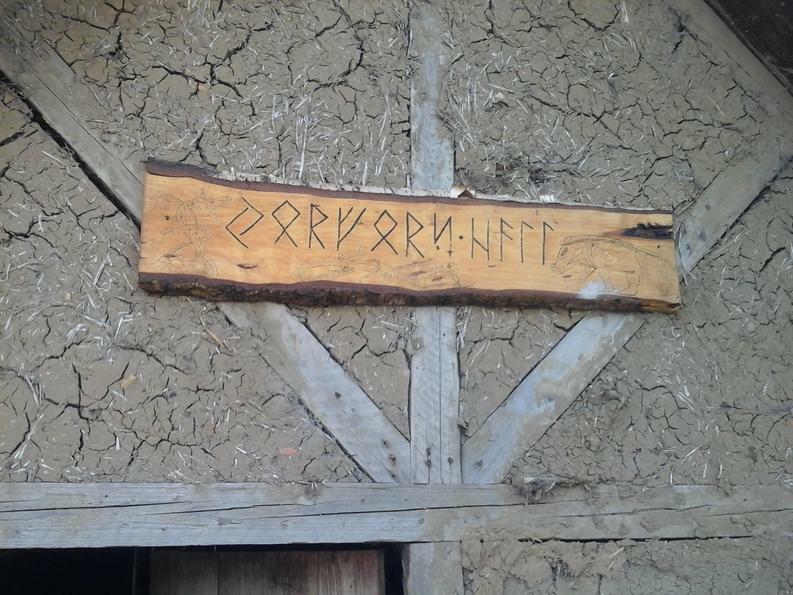 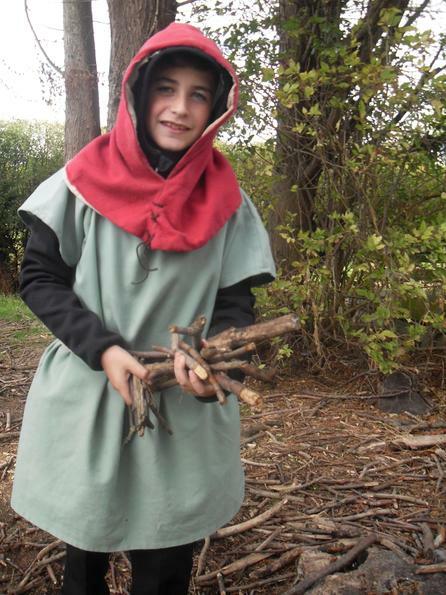 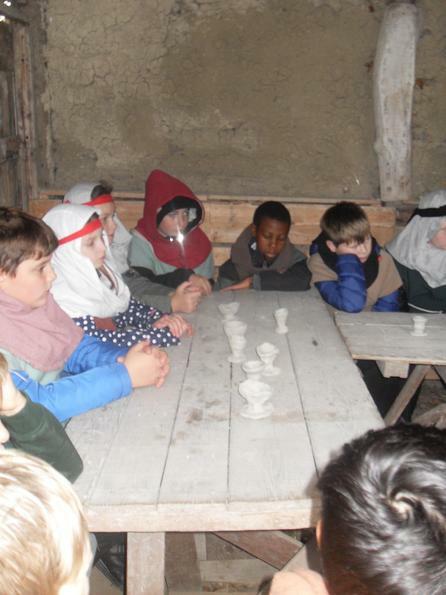 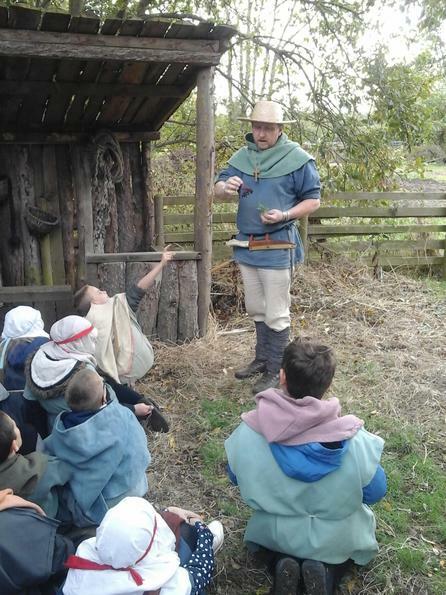 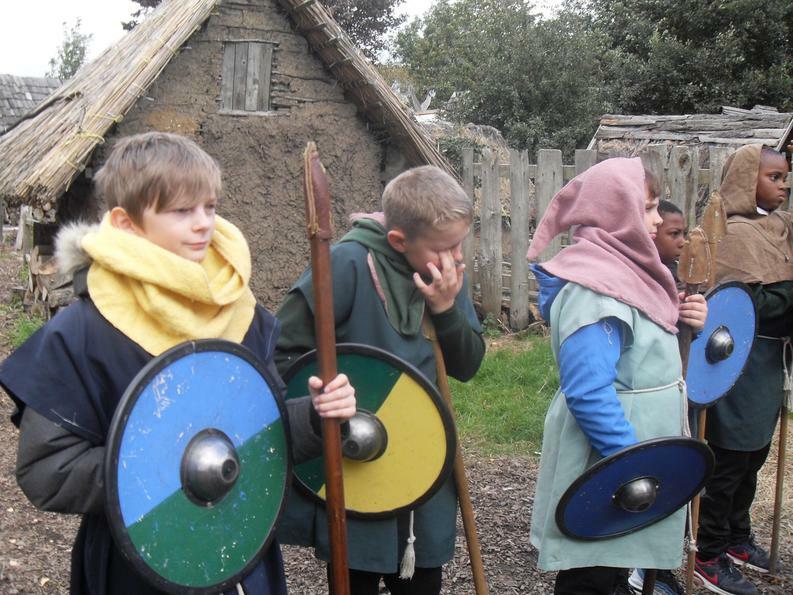 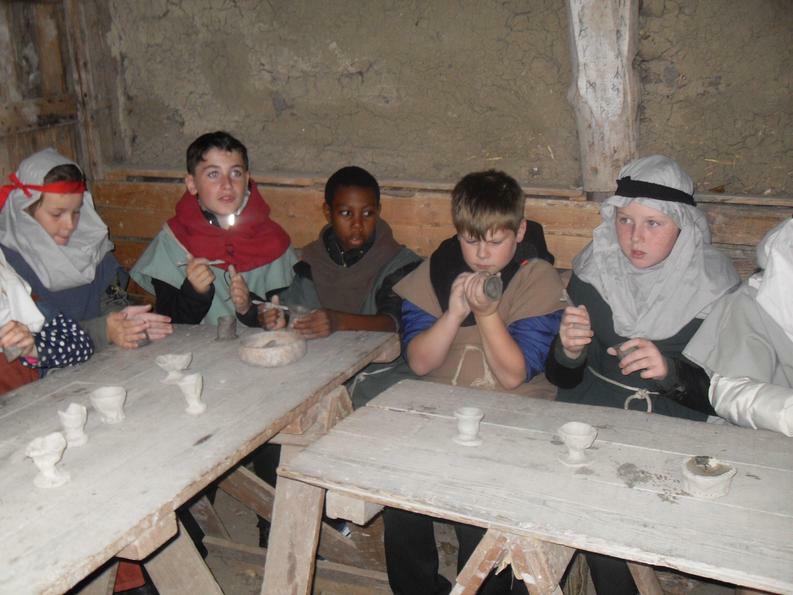 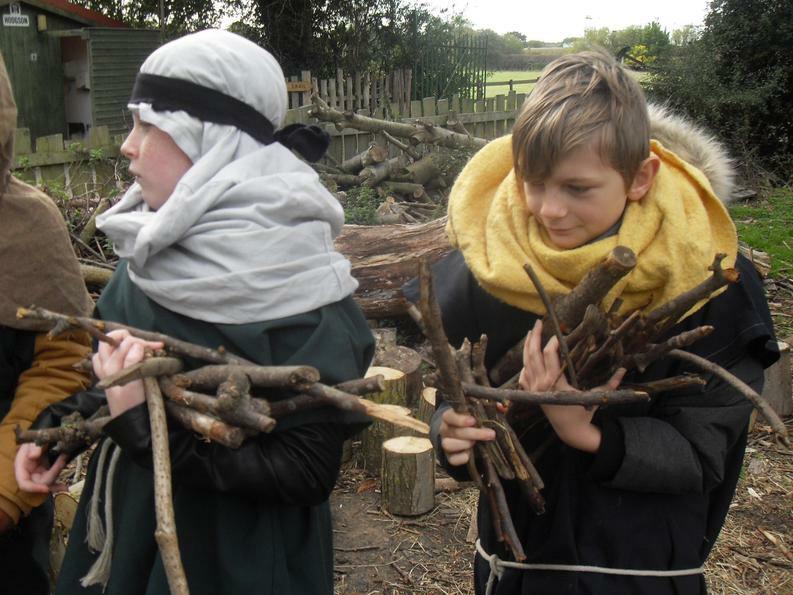 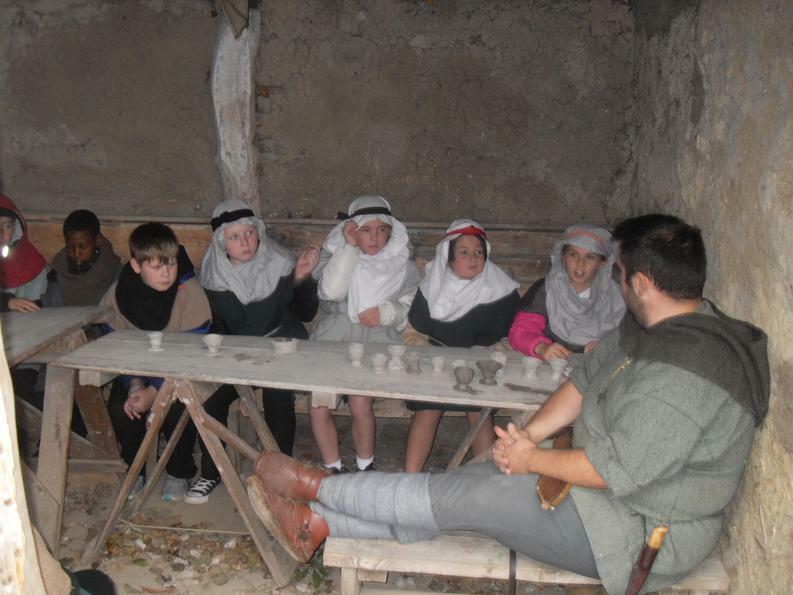 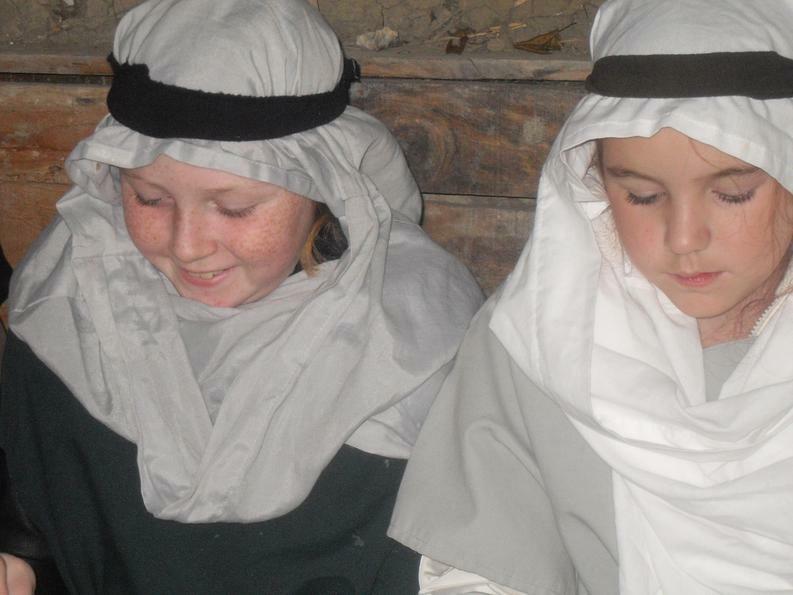 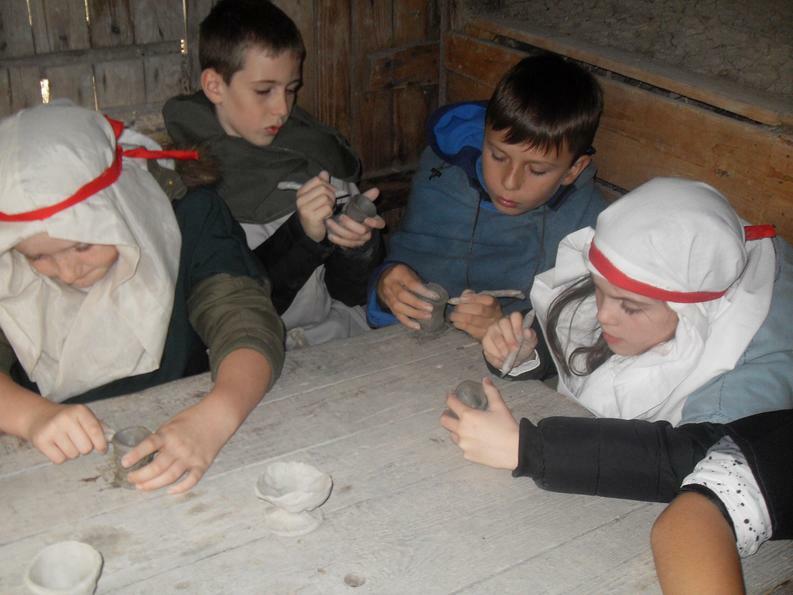 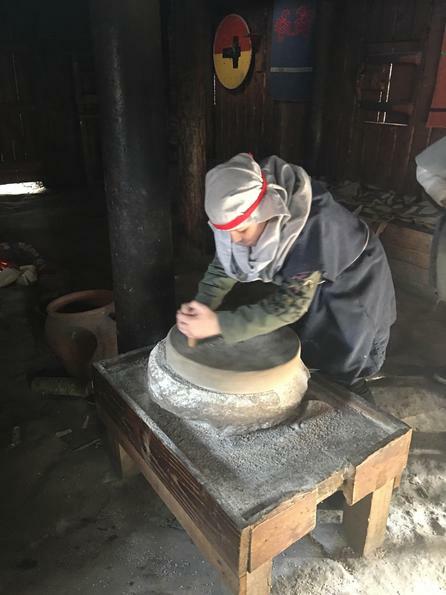 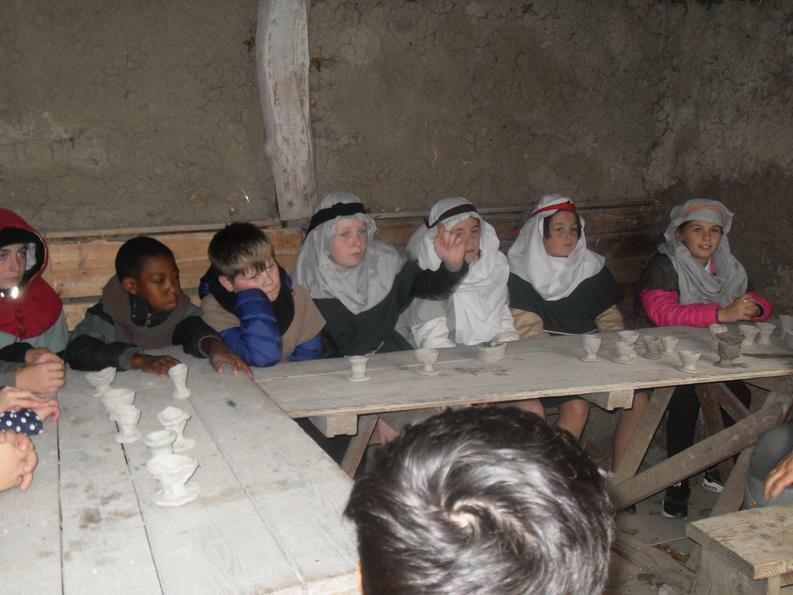 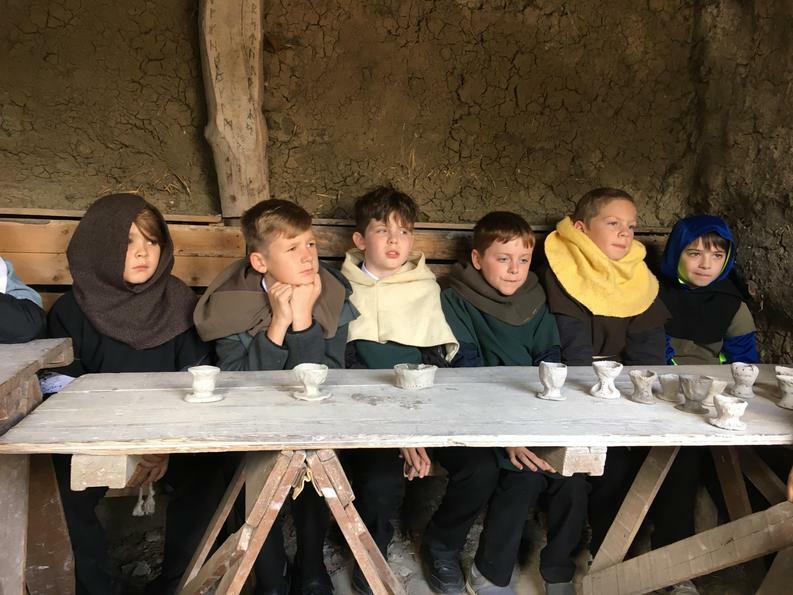 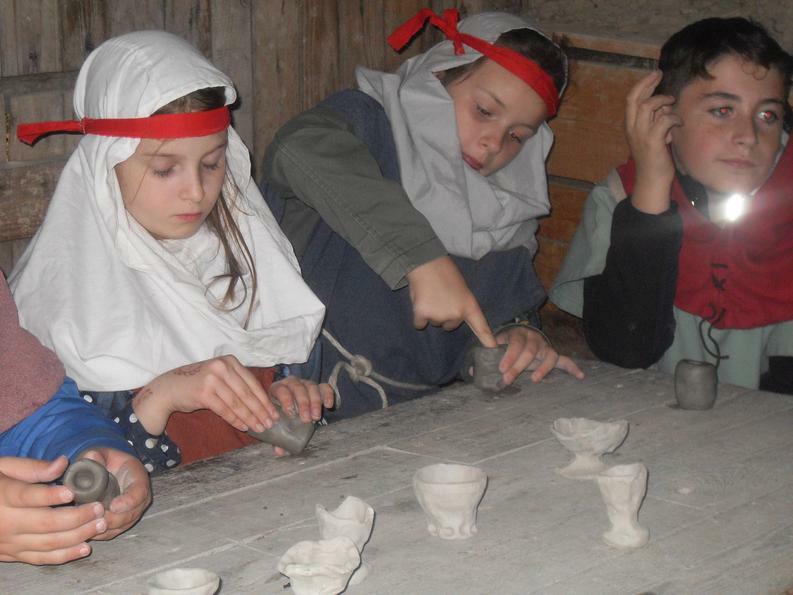 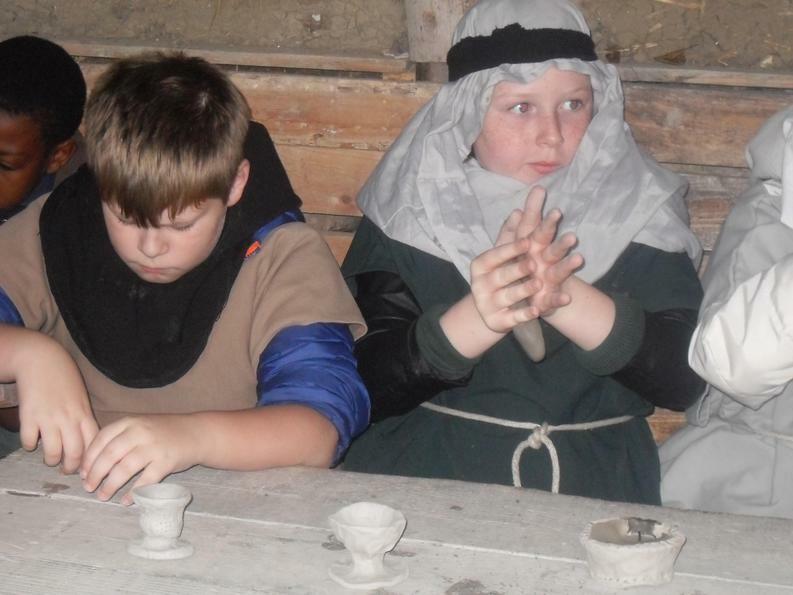 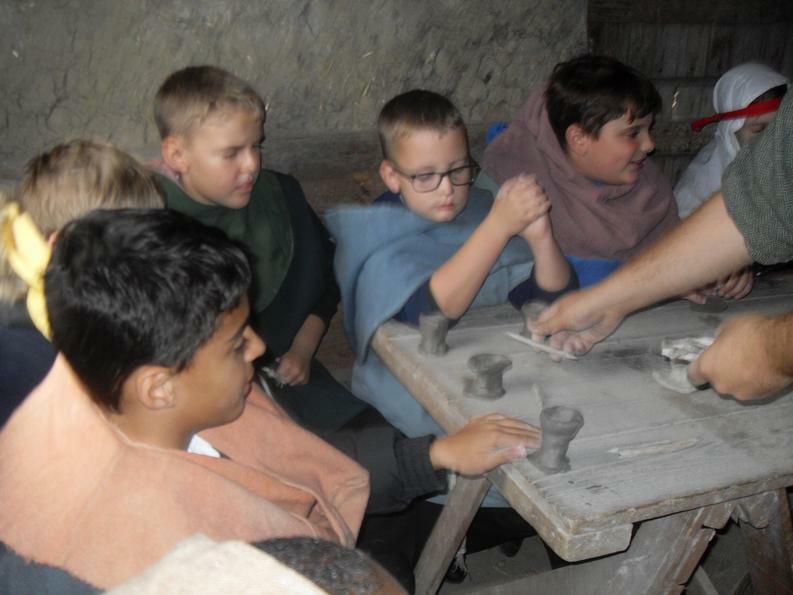 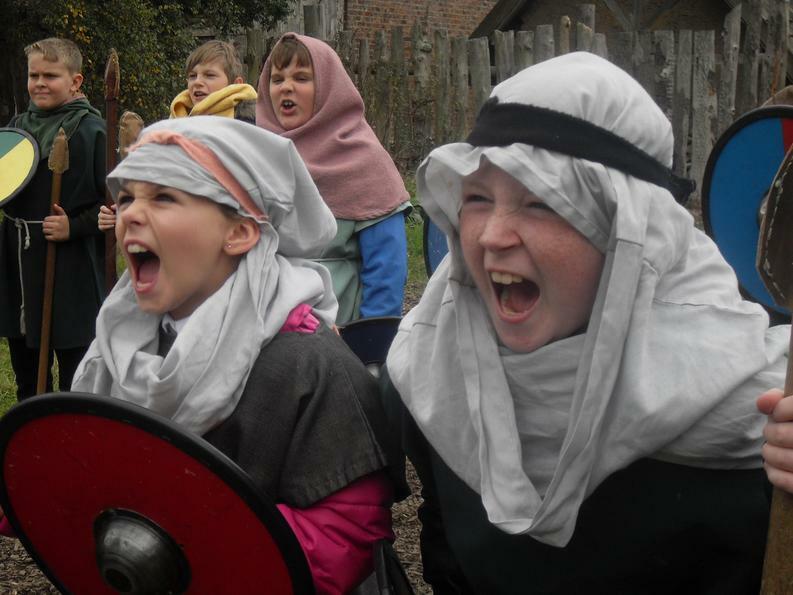 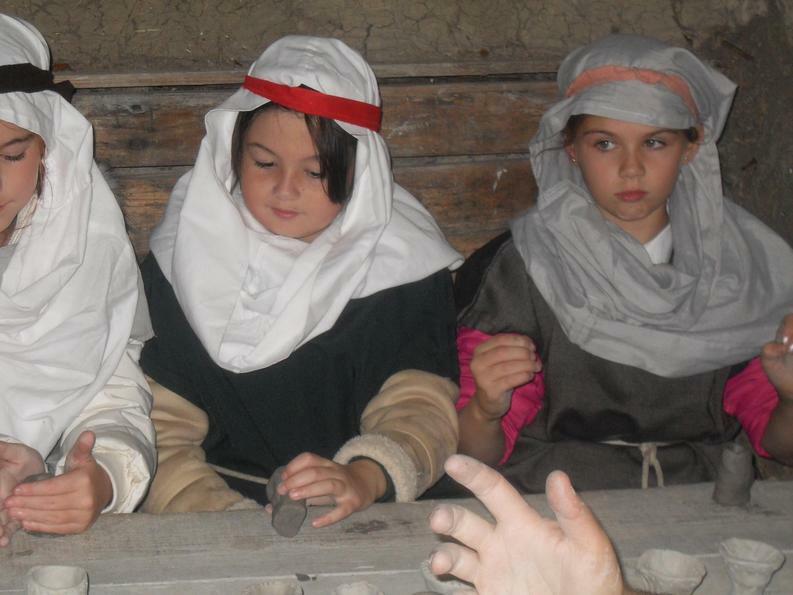 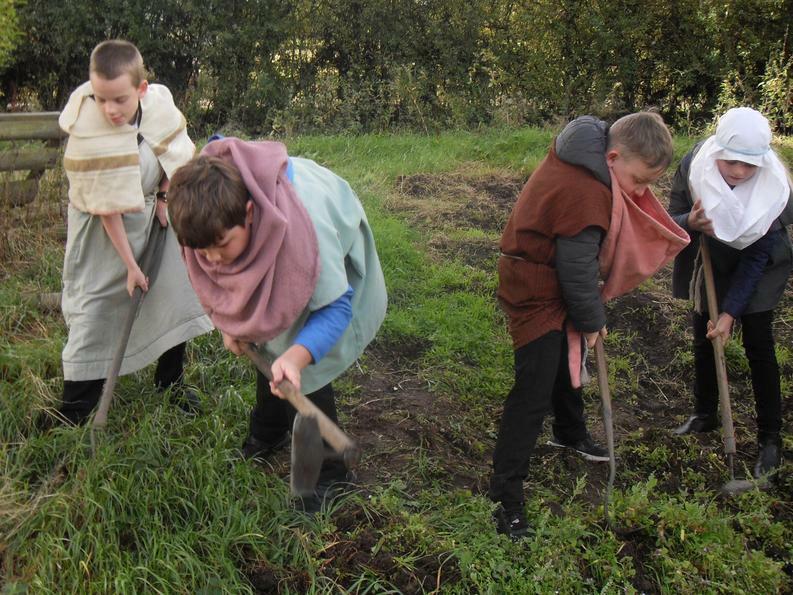 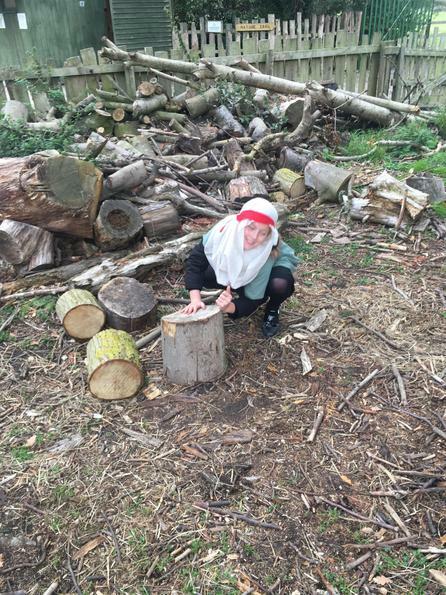 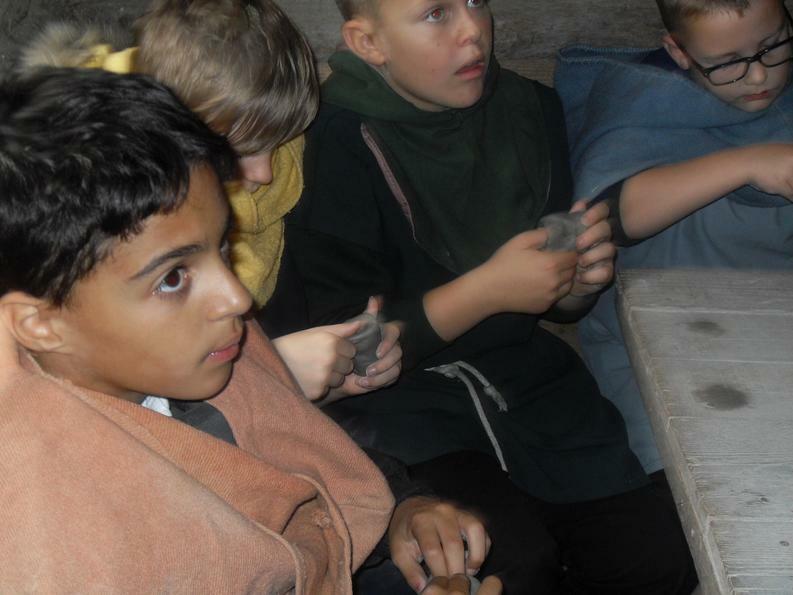 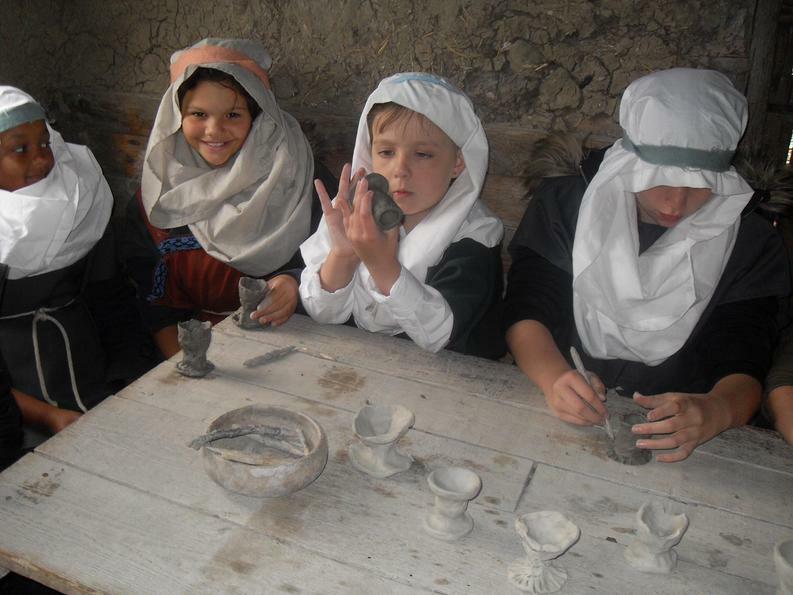 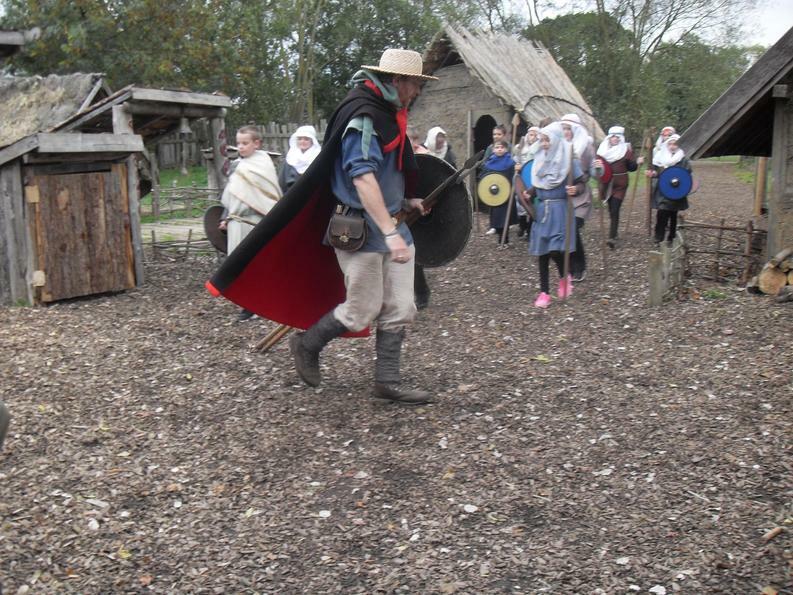 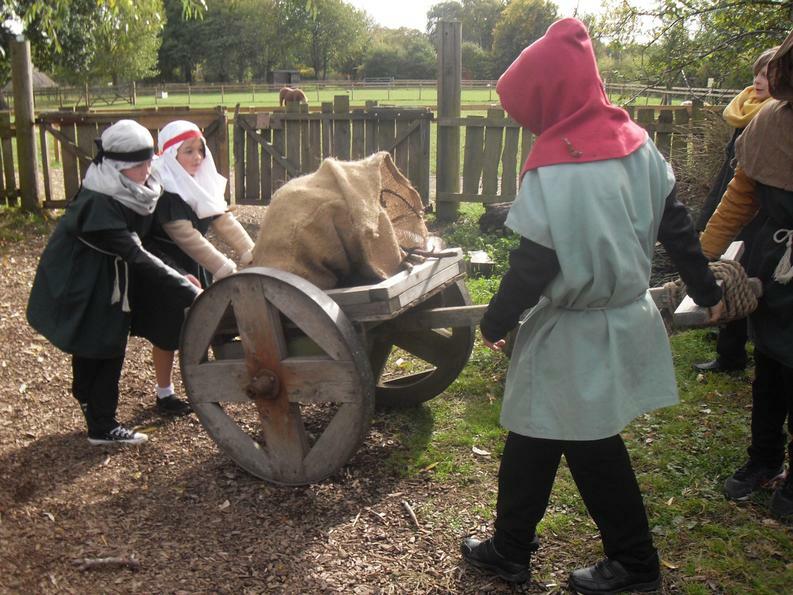 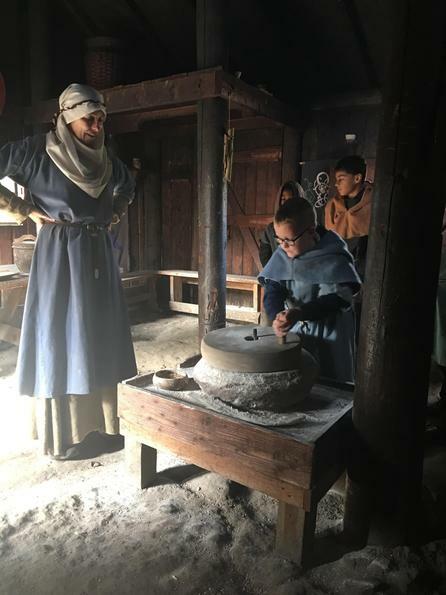 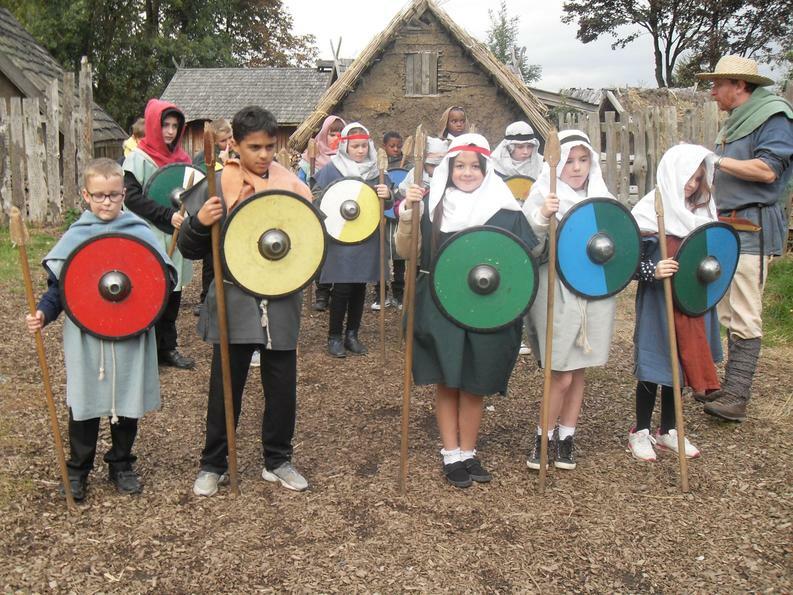 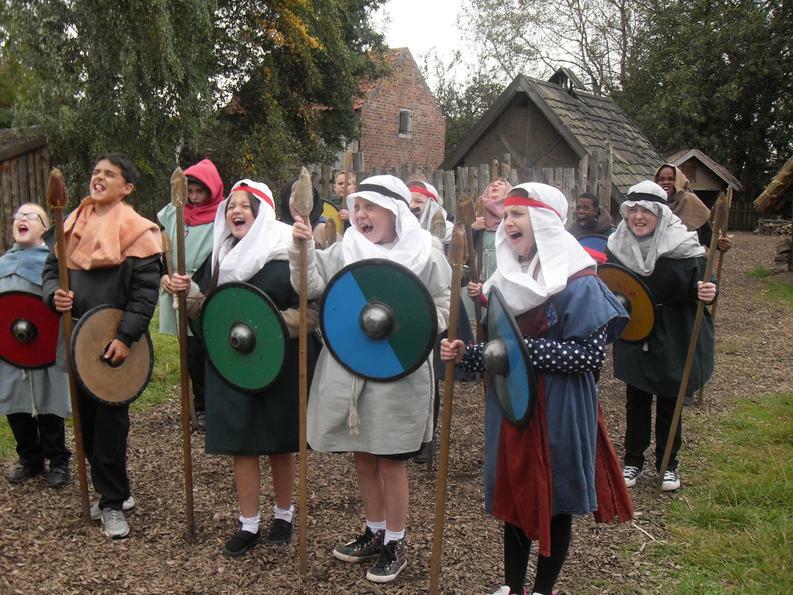 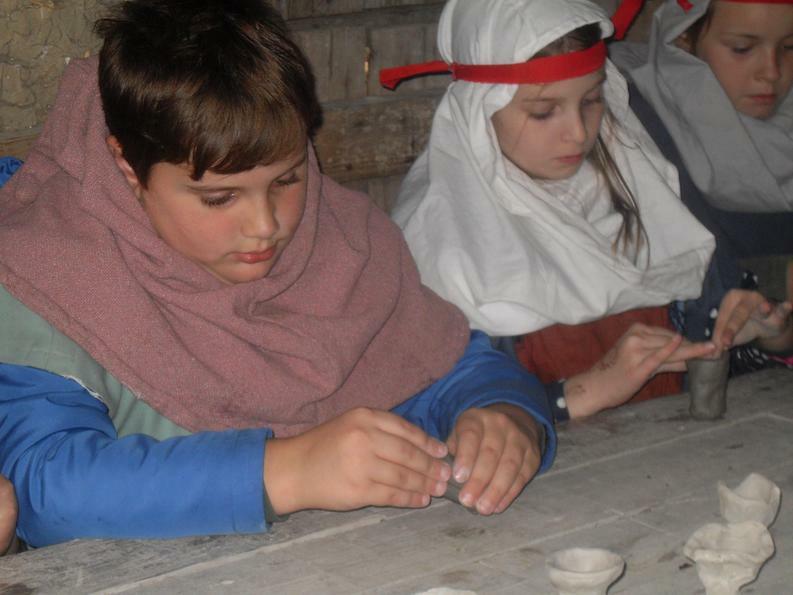 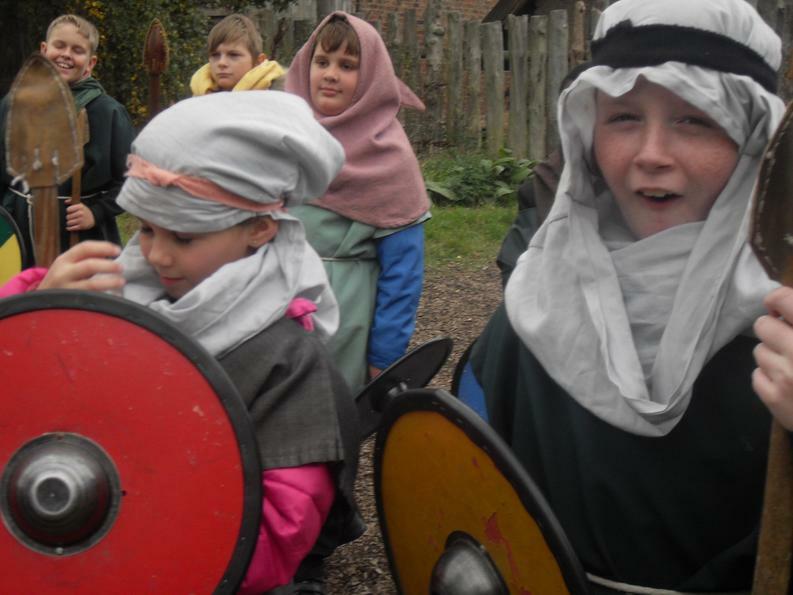 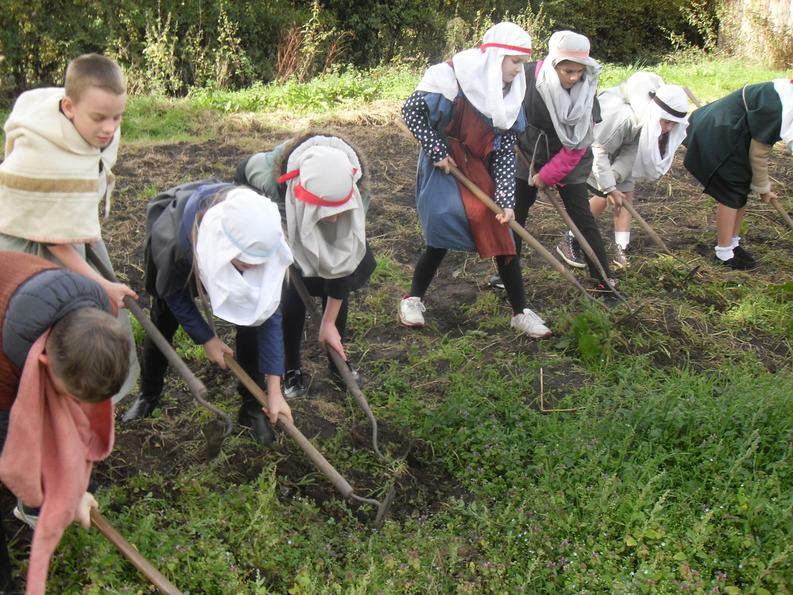 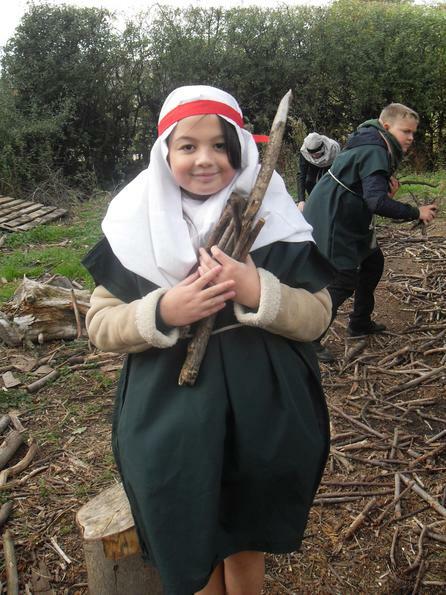 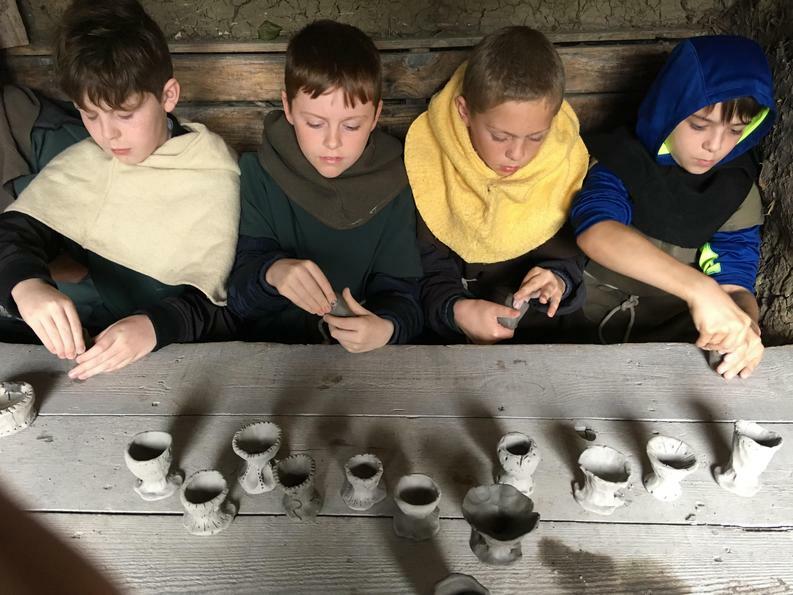 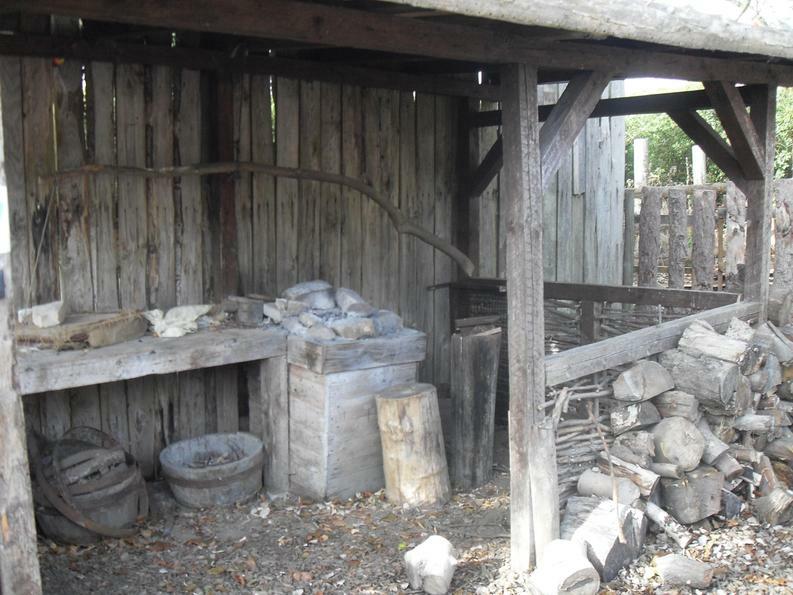 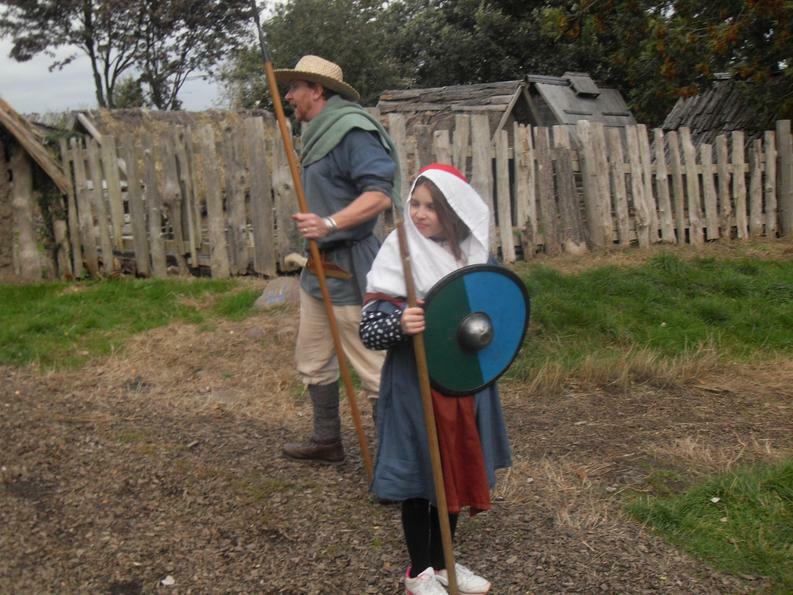 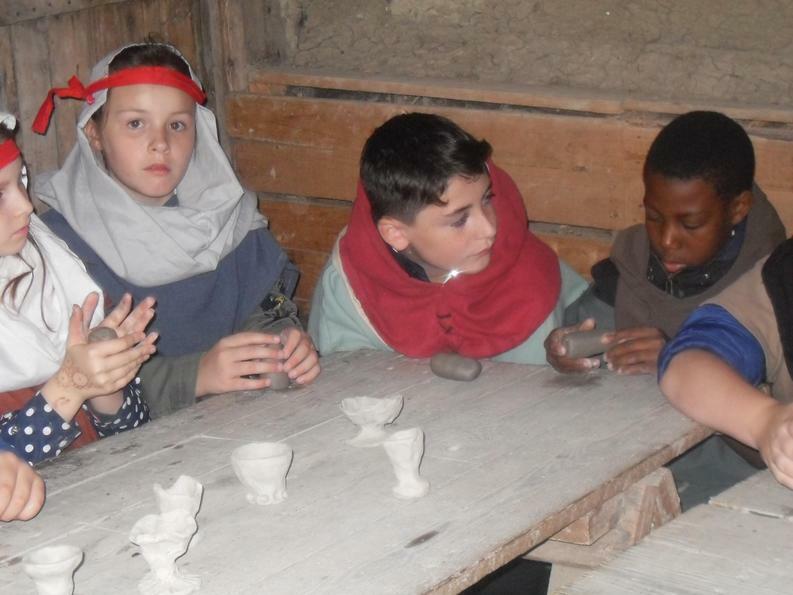 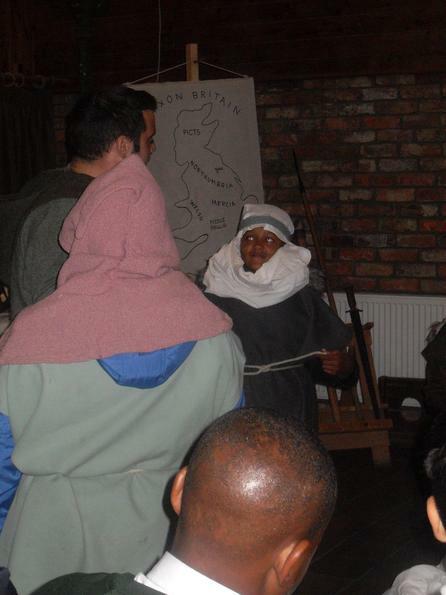 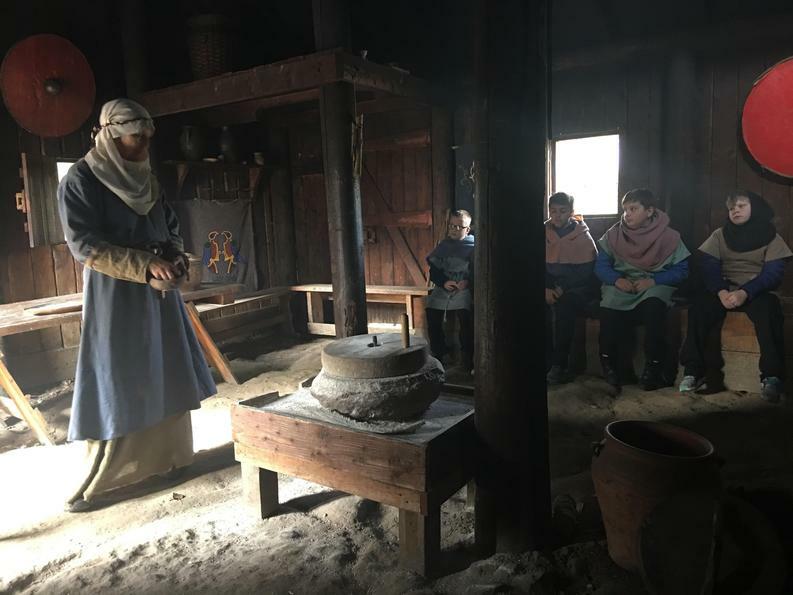 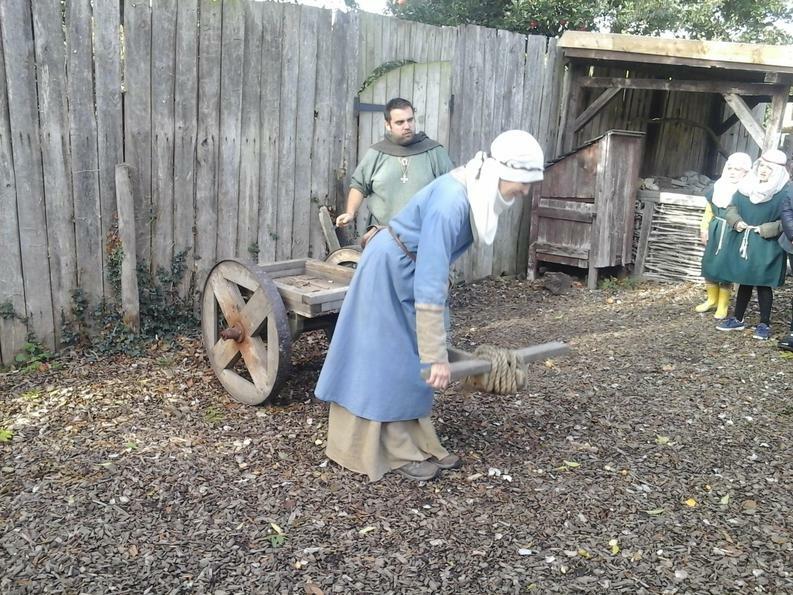 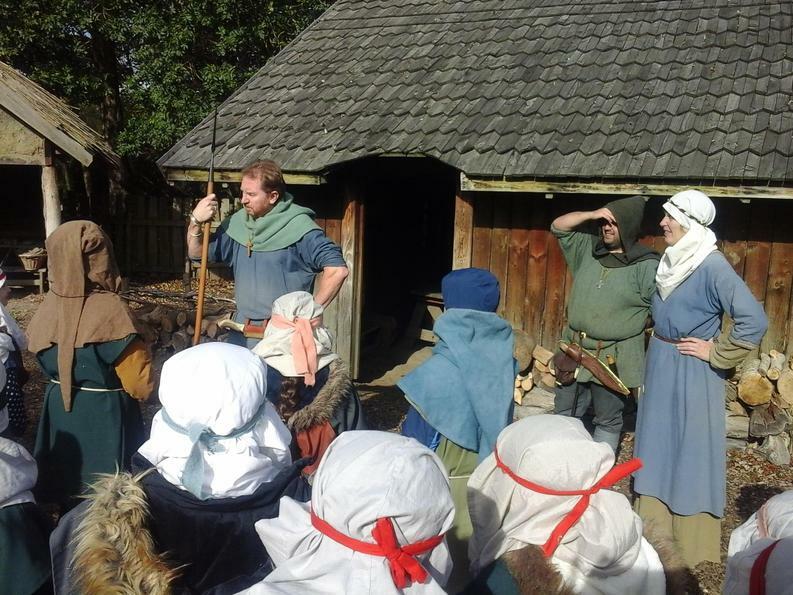 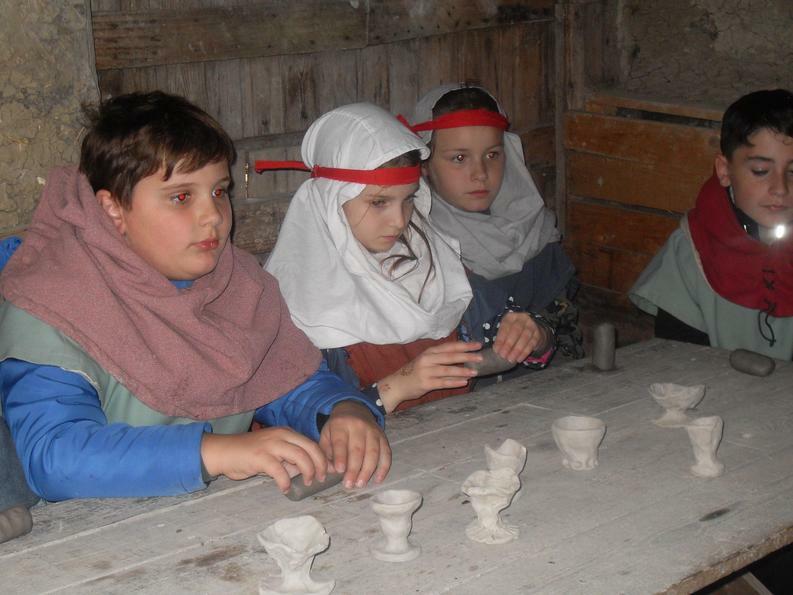 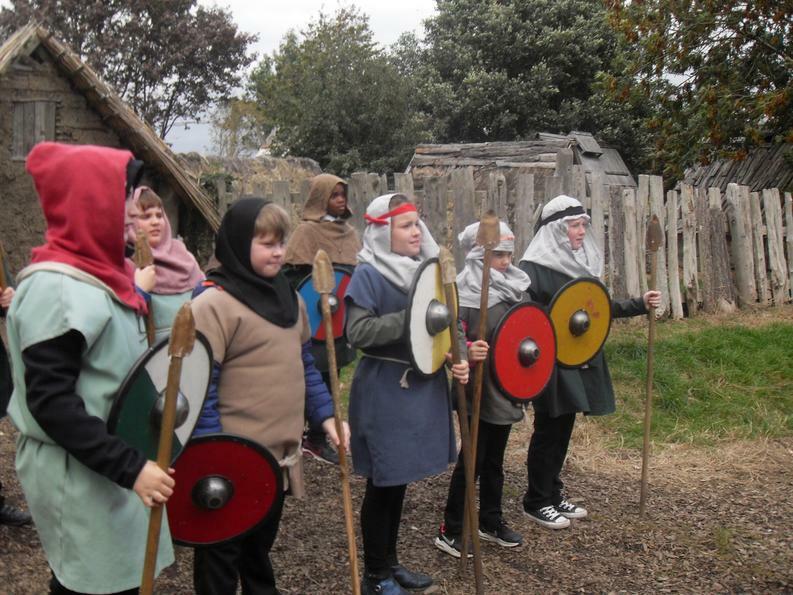 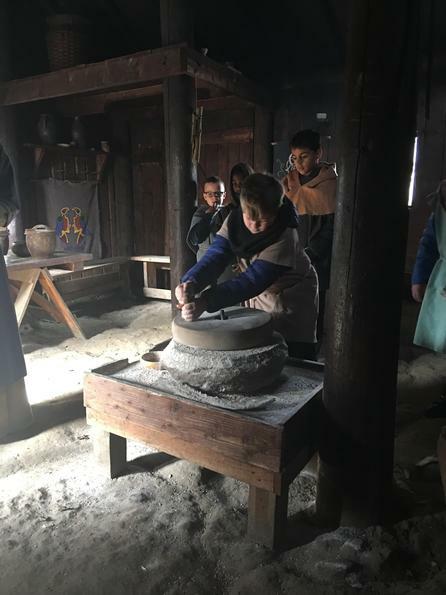 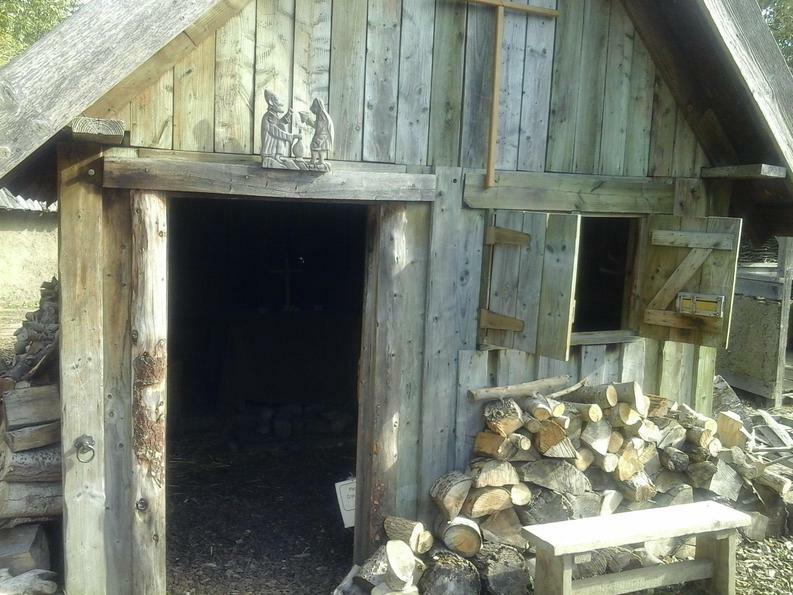 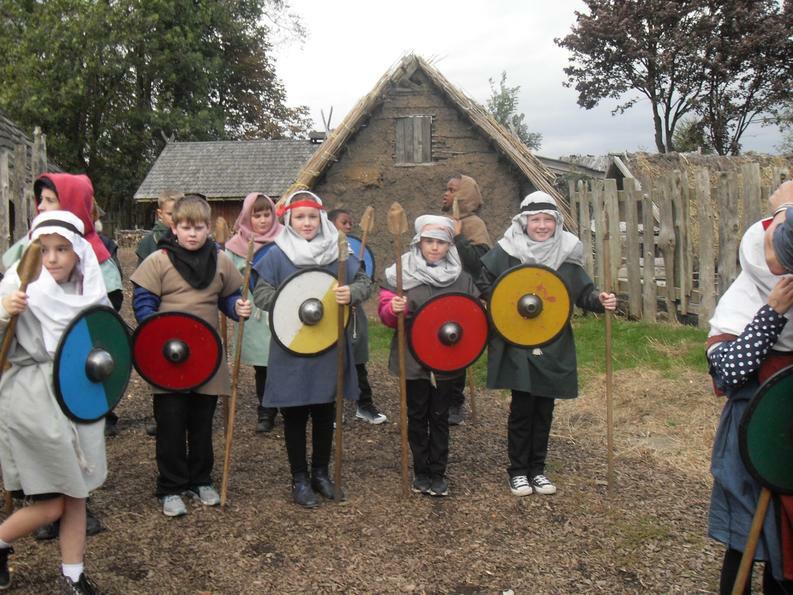 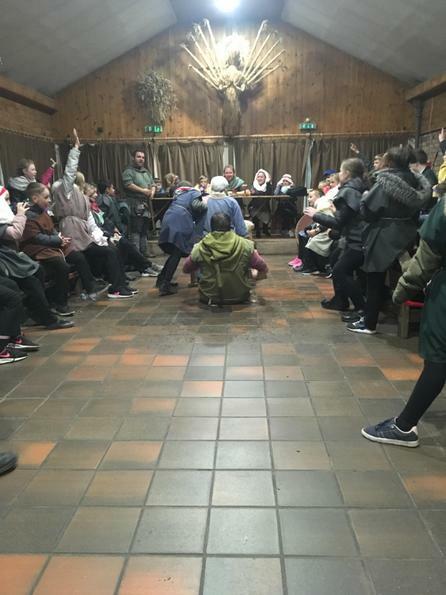 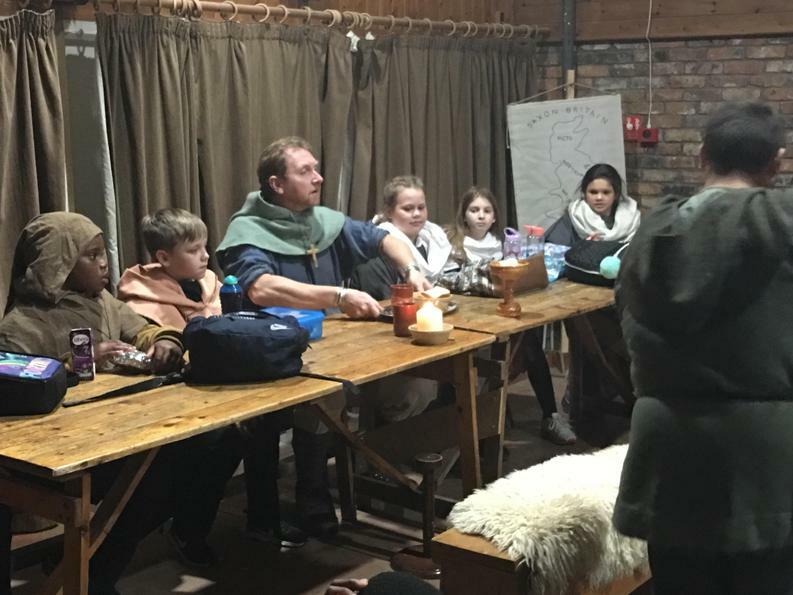 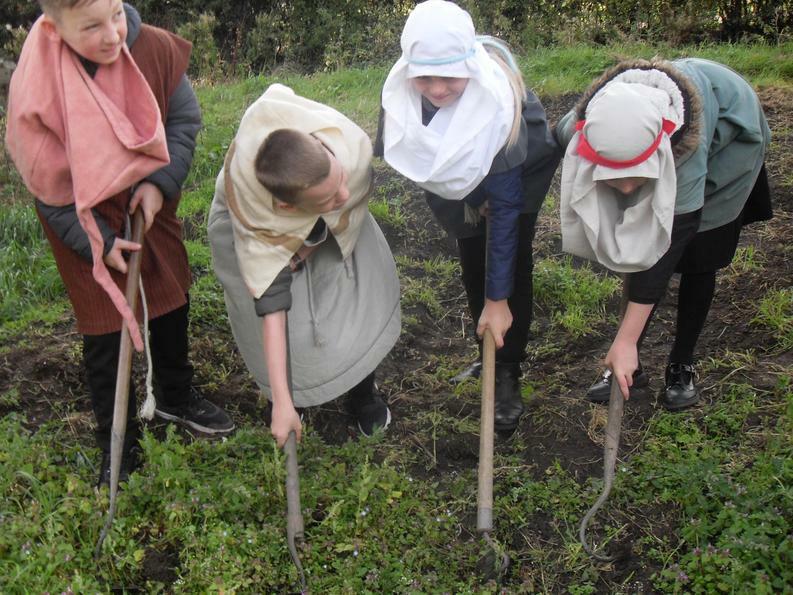 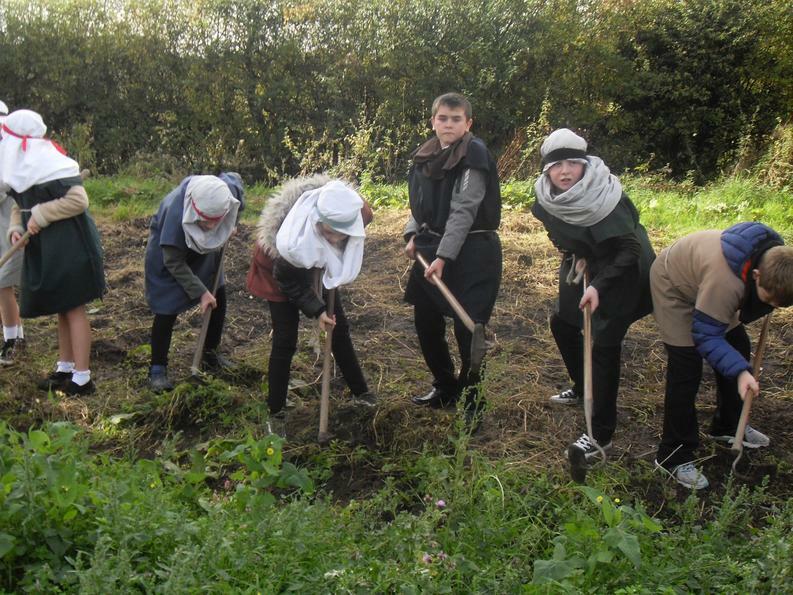 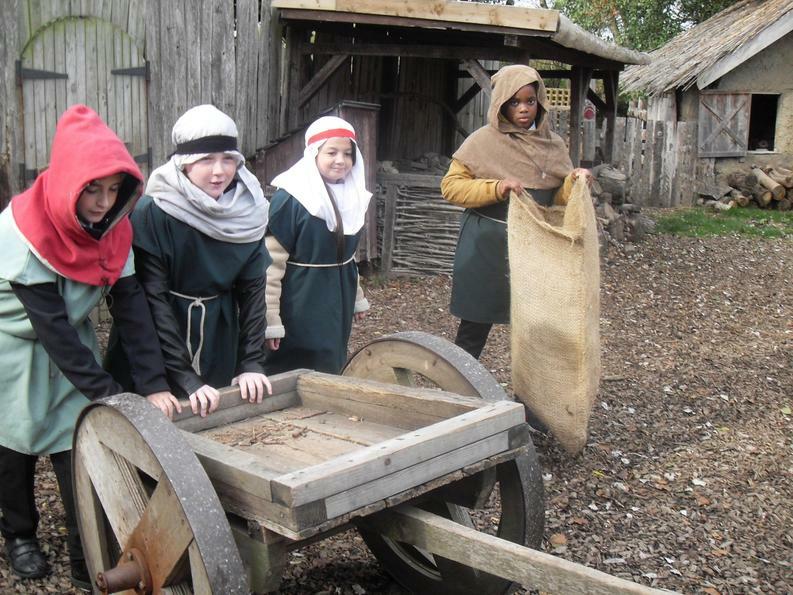 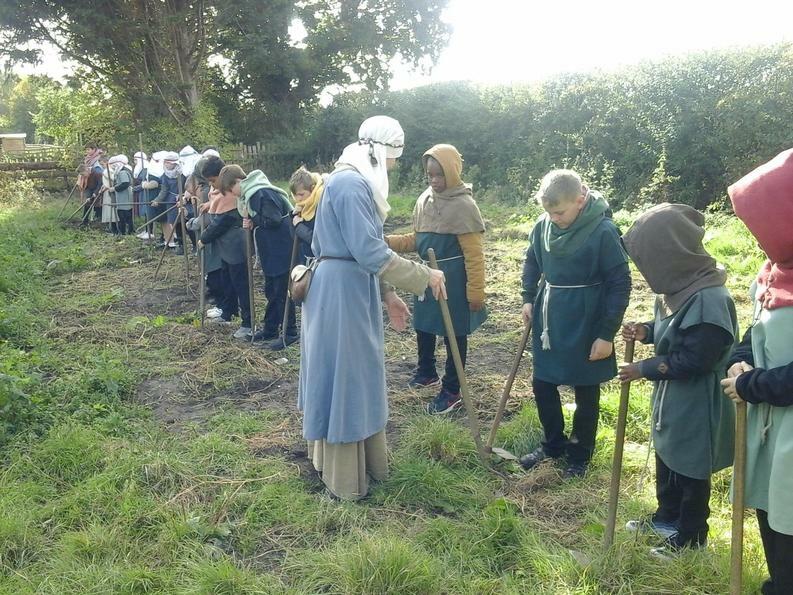 Each family took part in 3 activities that would have been a normal part of Anglo-Saxon life. 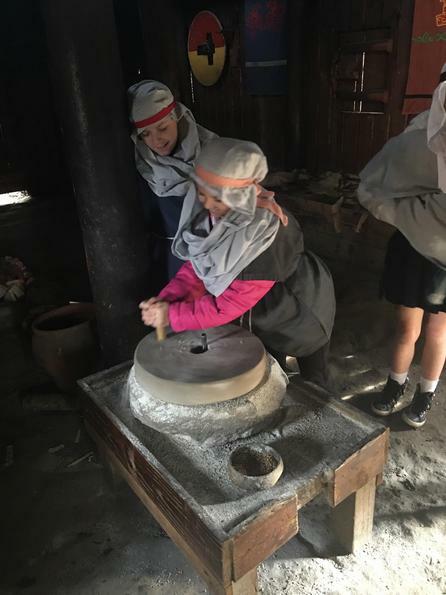 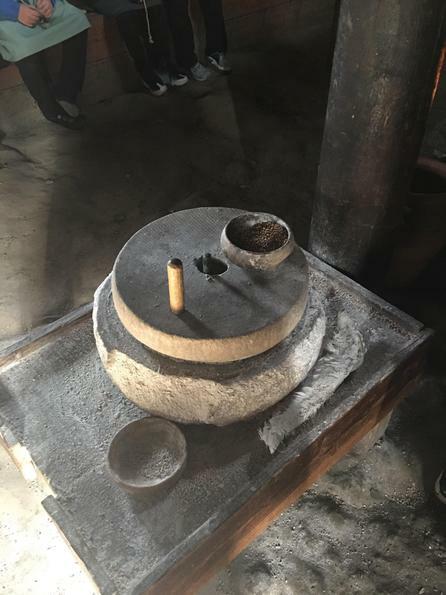 One of the activities was grinding flour. 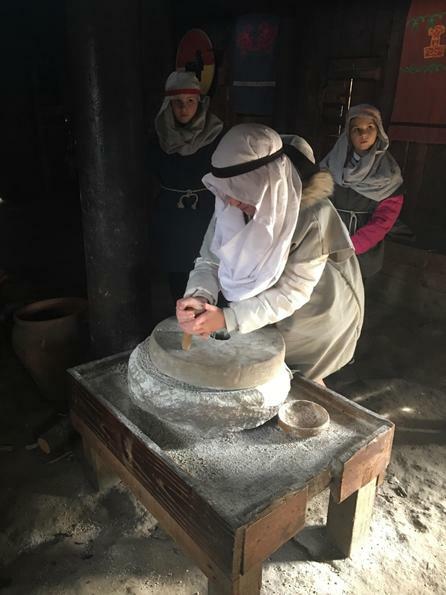 Using a large circular stone, we ground barley into wholemeal flour. 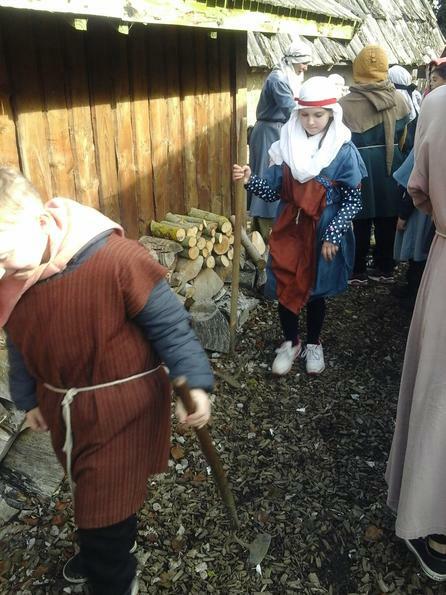 After about half an hour of grinding, we only had enough to make one small piece of bread. 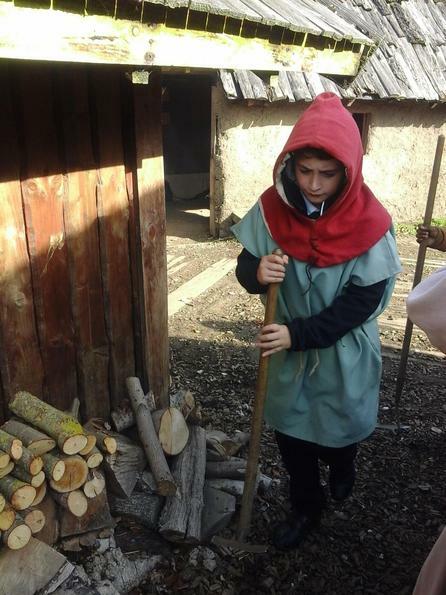 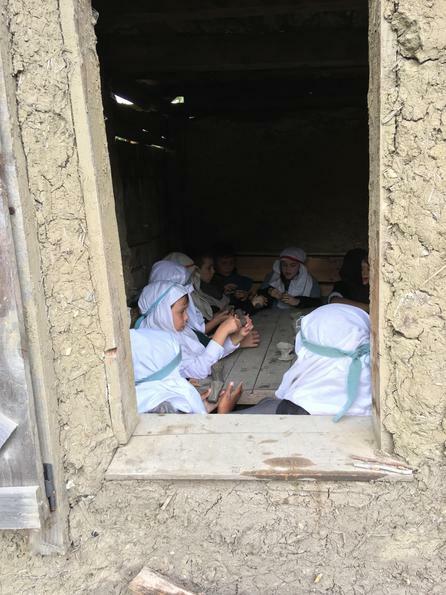 While some people were grinding flour, other members of the family were sent out to gather firewood. 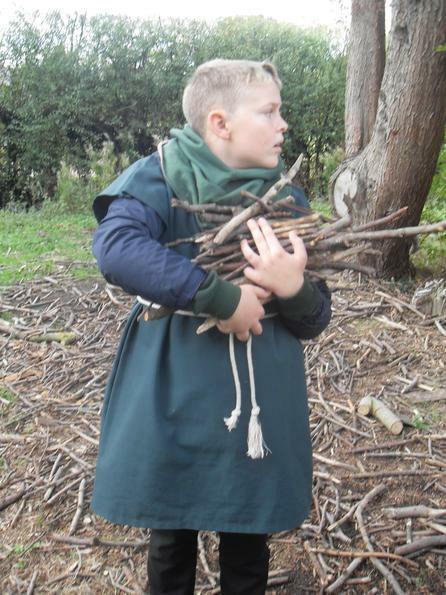 This involved leading a cart out of the village and filling a sack full of sticks. 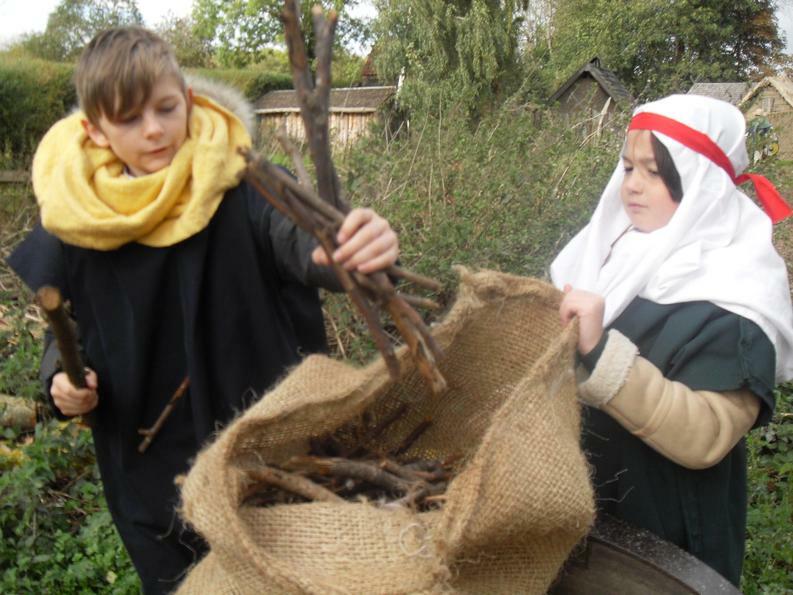 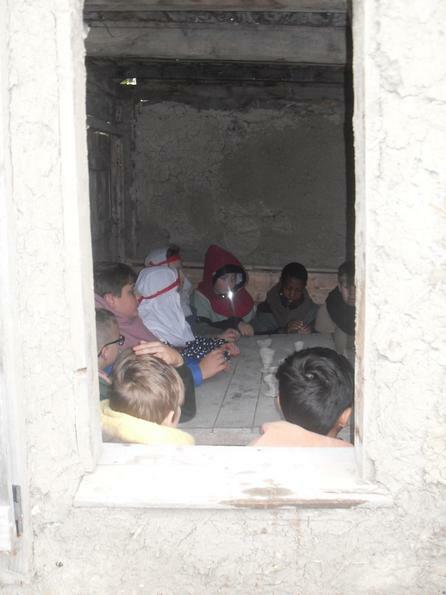 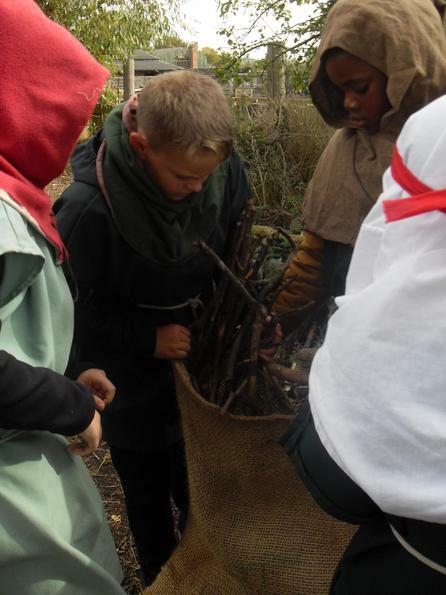 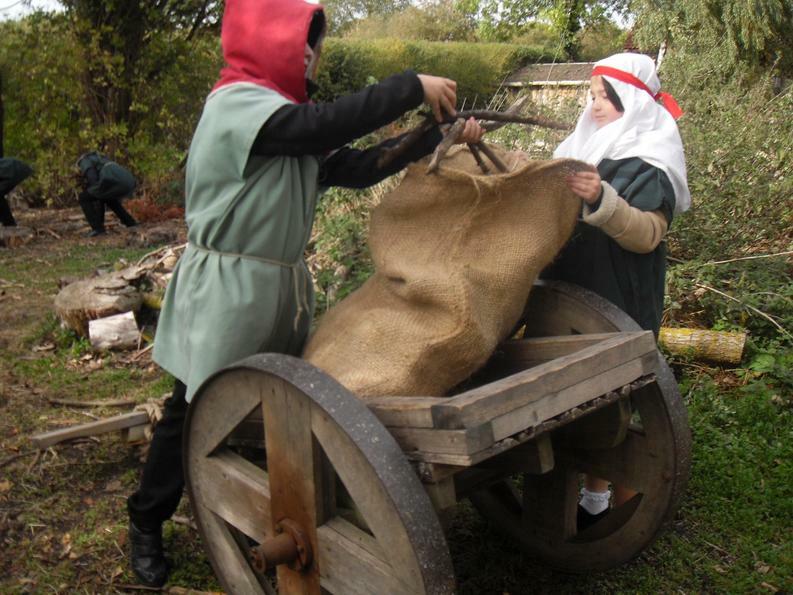 We learnt it would take six full sacks just to keep the fire burning for a single day! 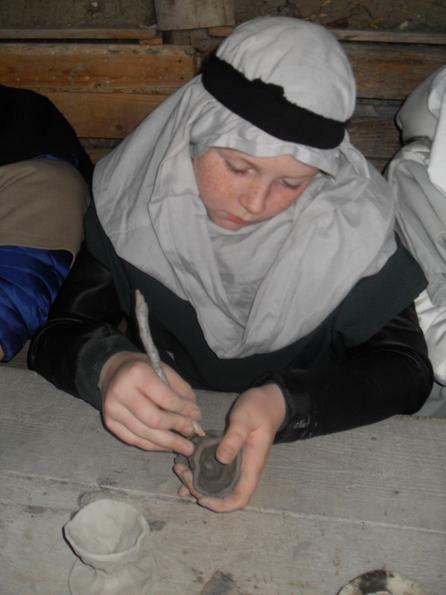 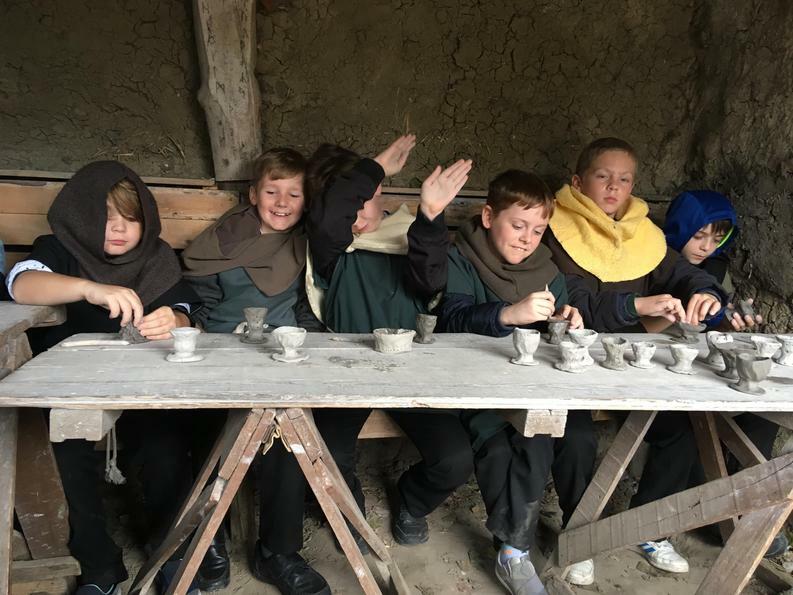 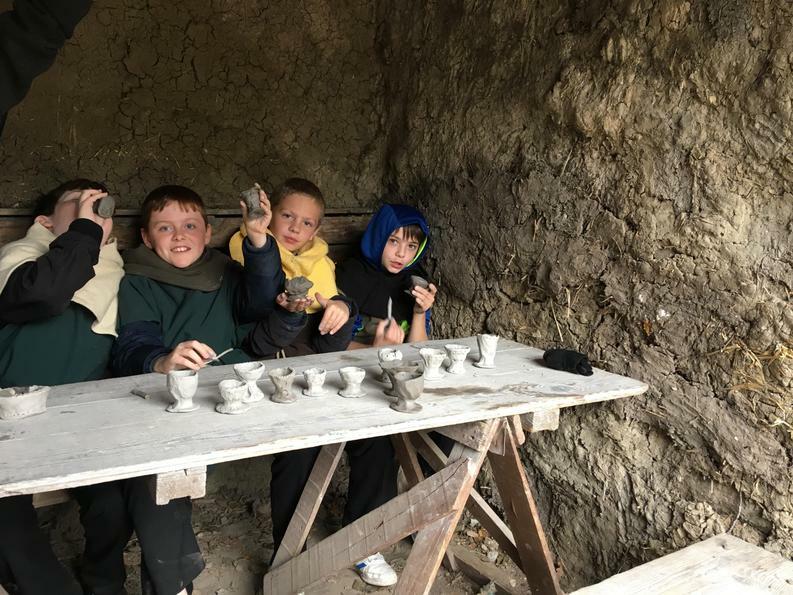 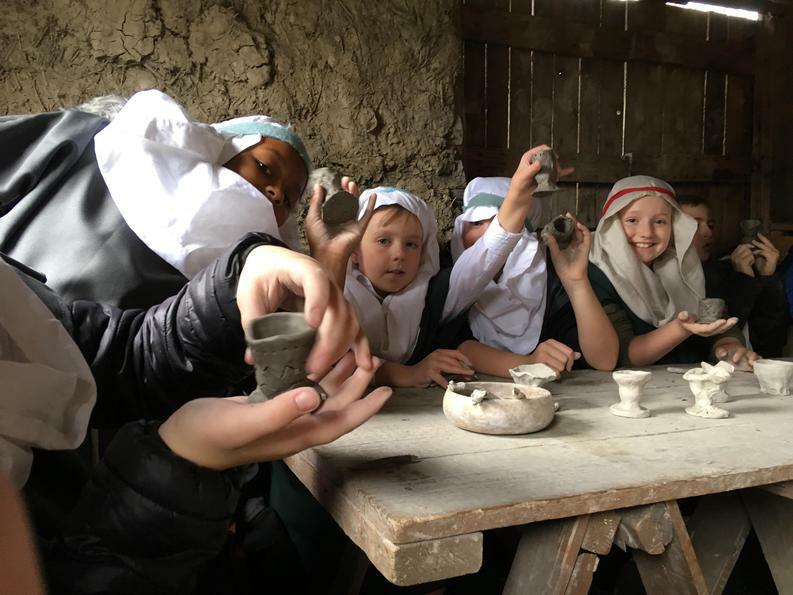 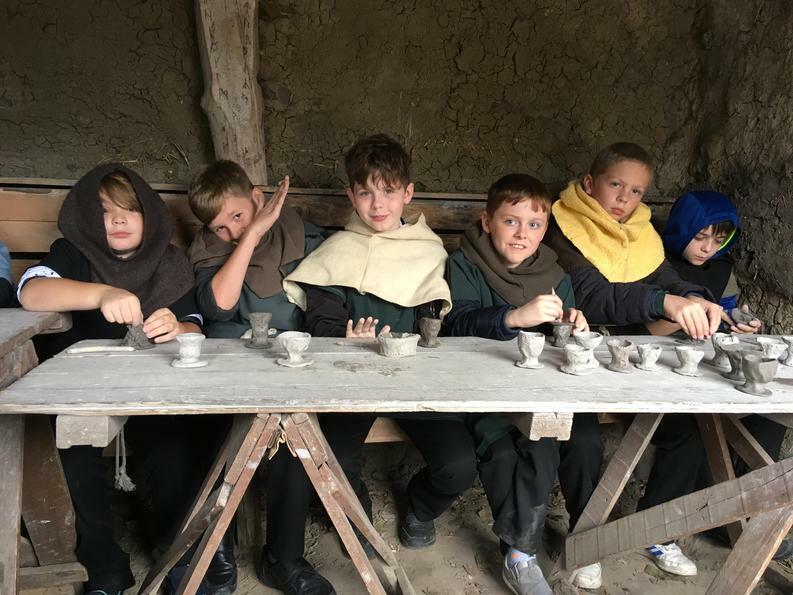 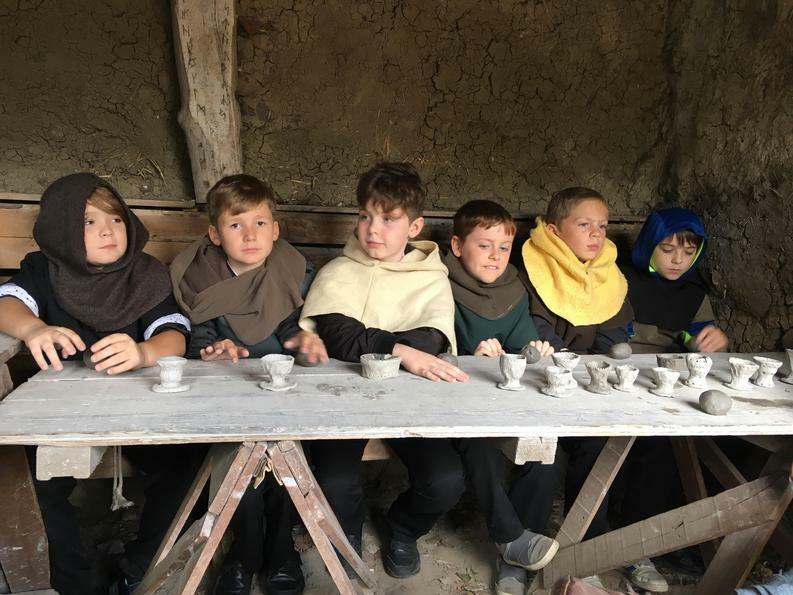 Another activity was making Anglo-Saxon pottery. 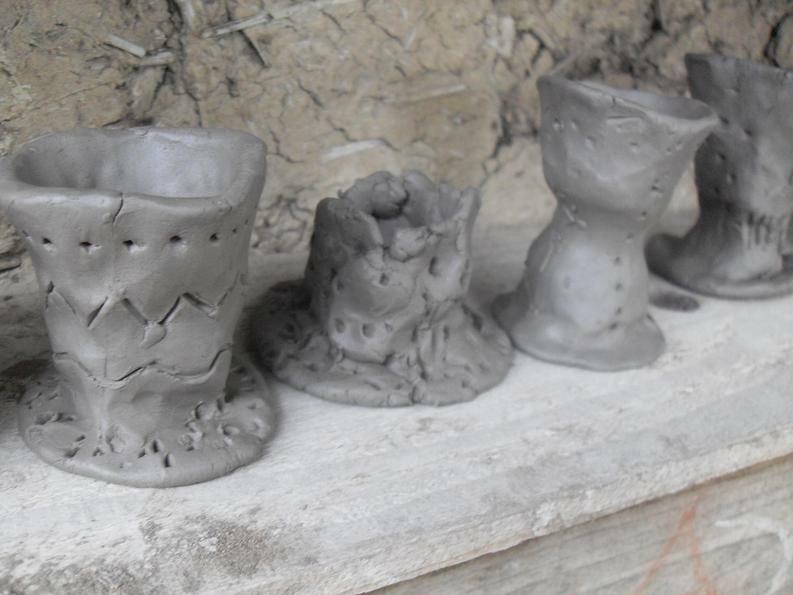 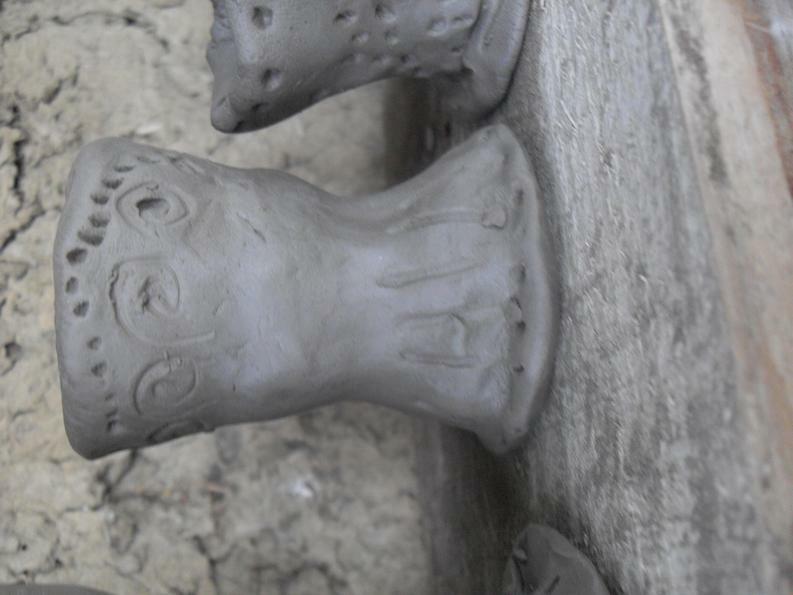 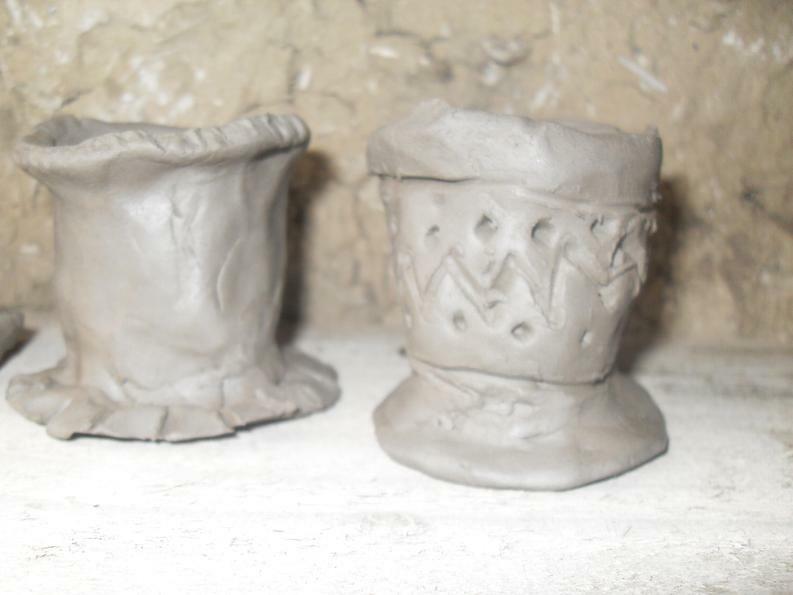 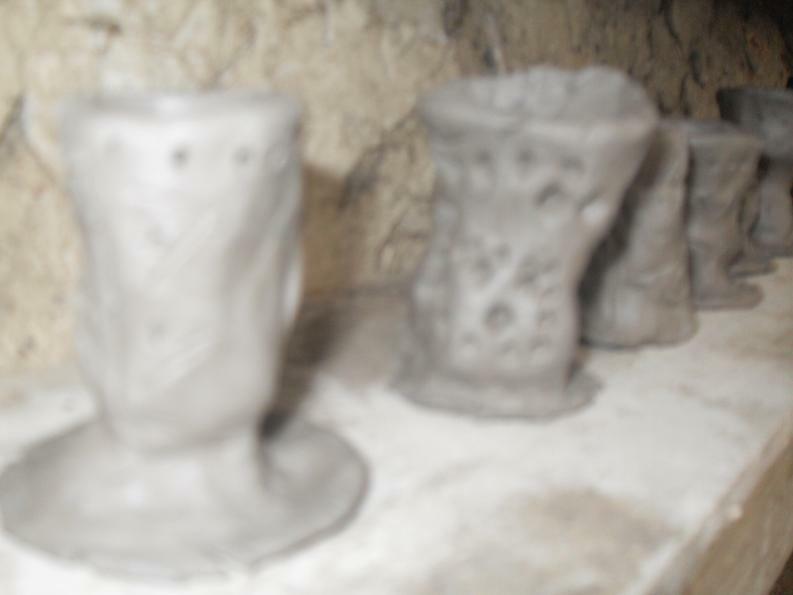 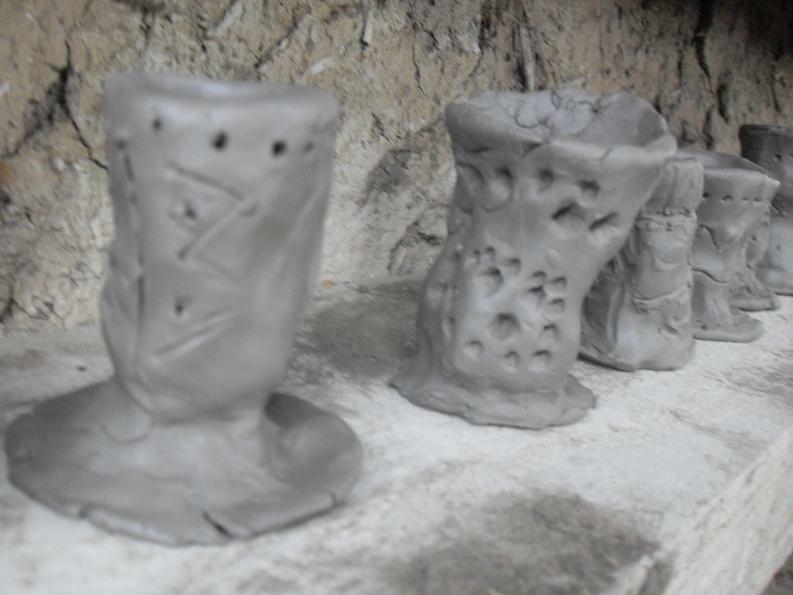 We made small cups from the clay which we later painted at school. 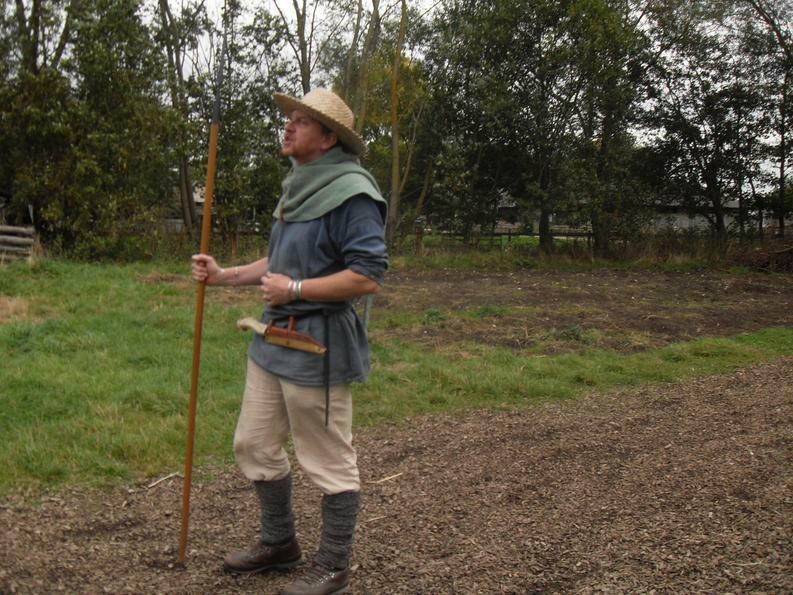 The last task involved guard duty. 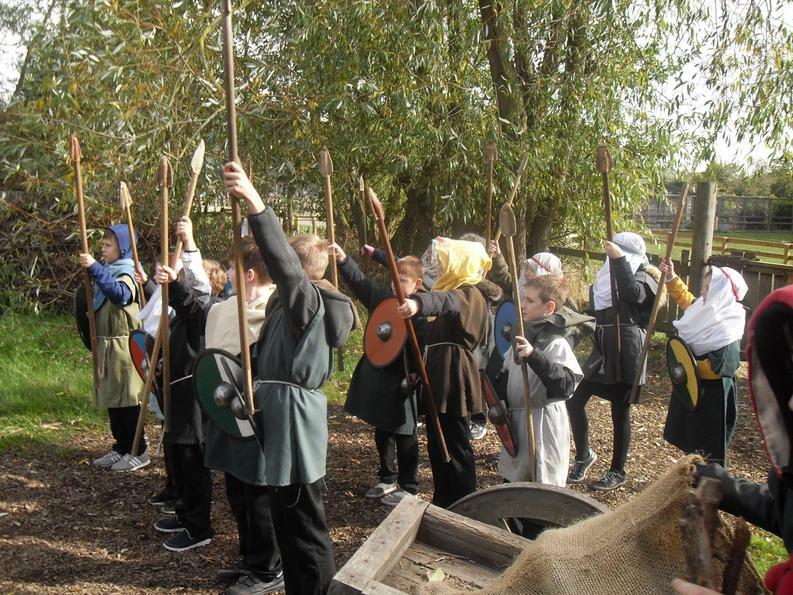 We learned how to hold the spear and shield and practiced marching, charging and wielding our spears. 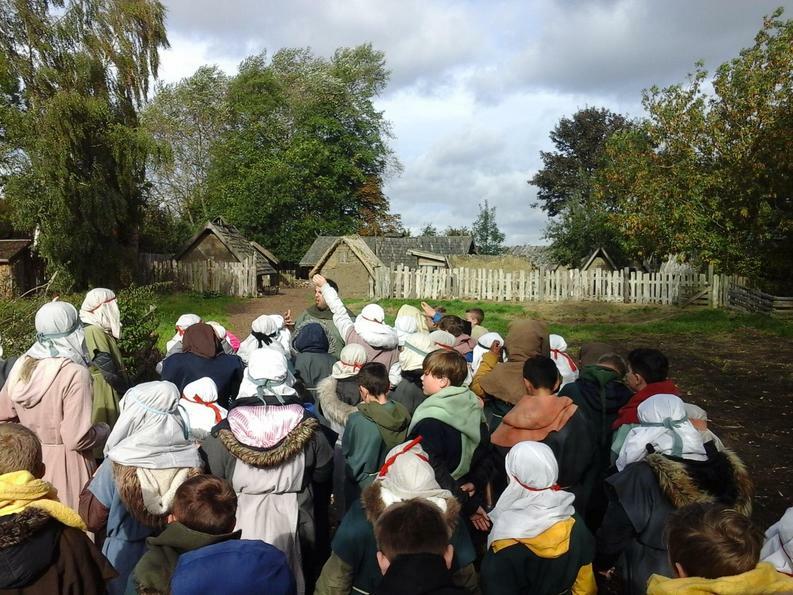 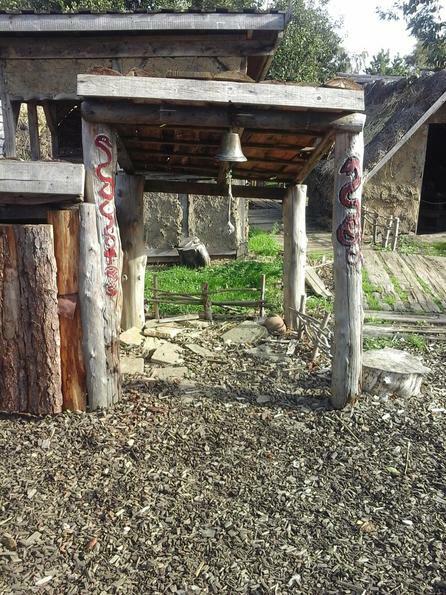 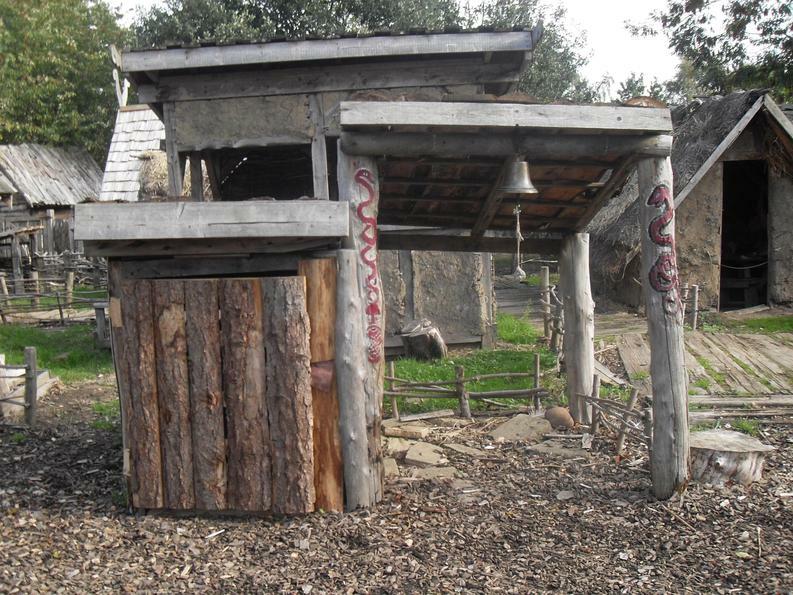 Later, at the end of the day, the village alarm bell rang! 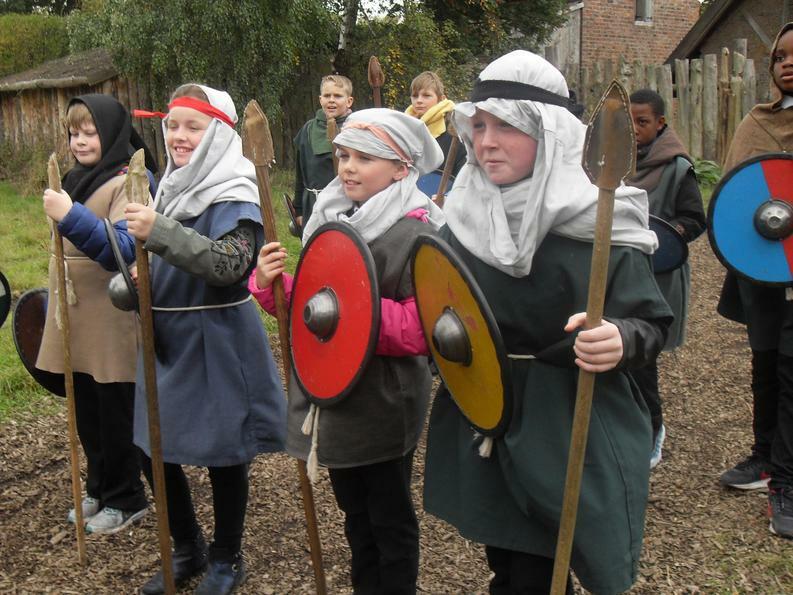 We were being attacked by Mercians! 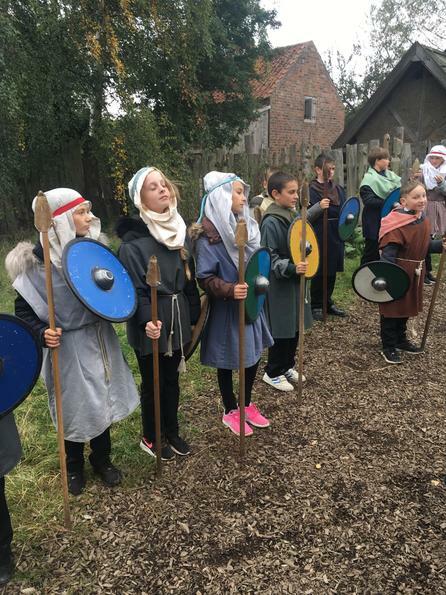 Fortunately, the guards leapt into action and scared off the invaders by displaying their impressive new skills while the rest of the village cheered them on. 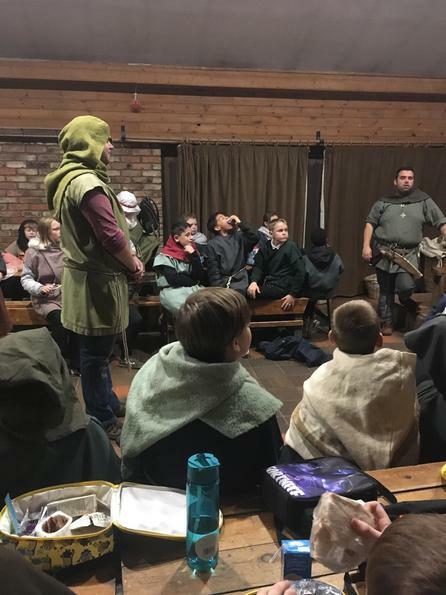 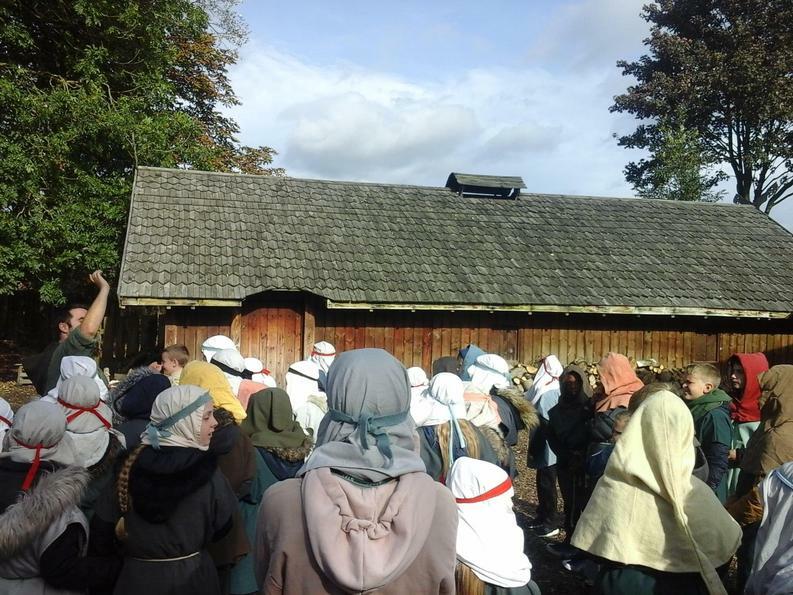 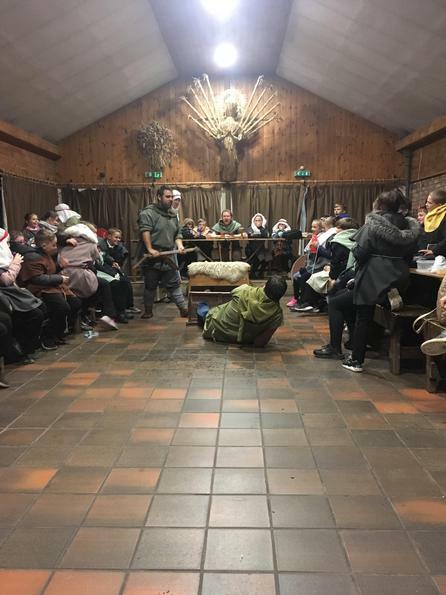 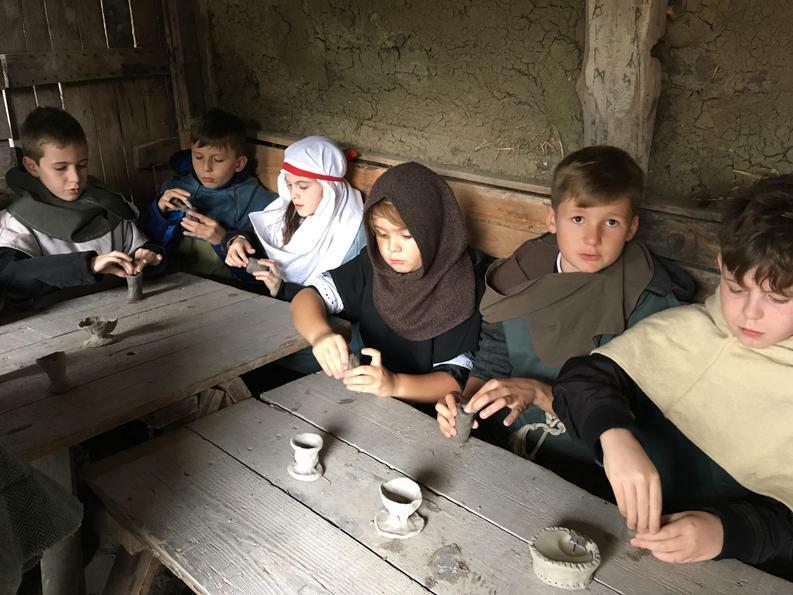 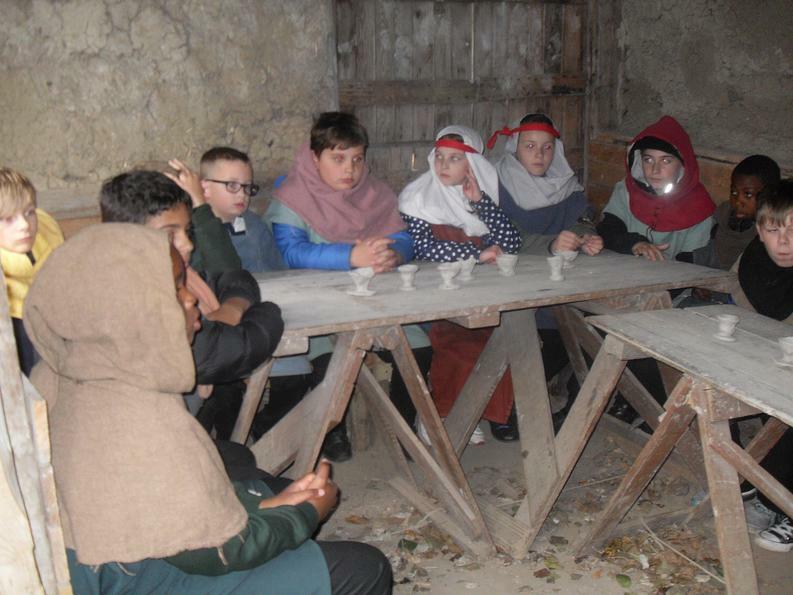 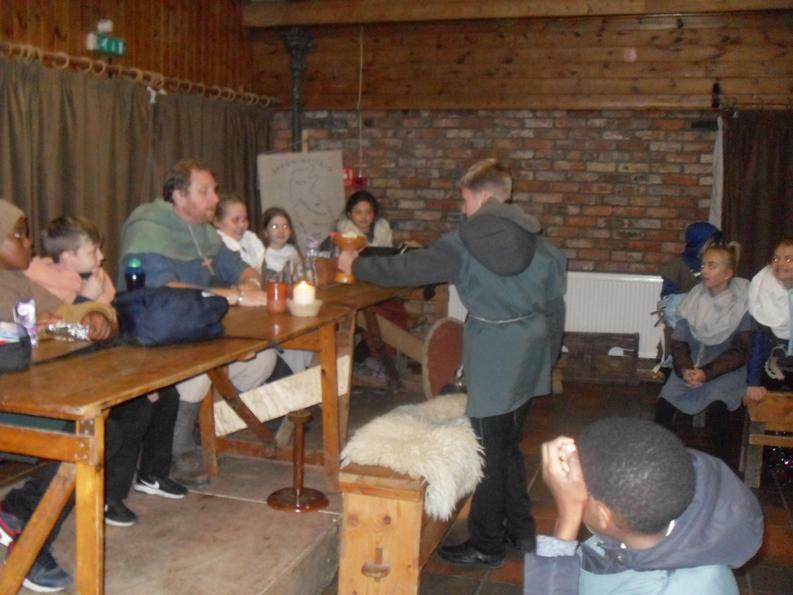 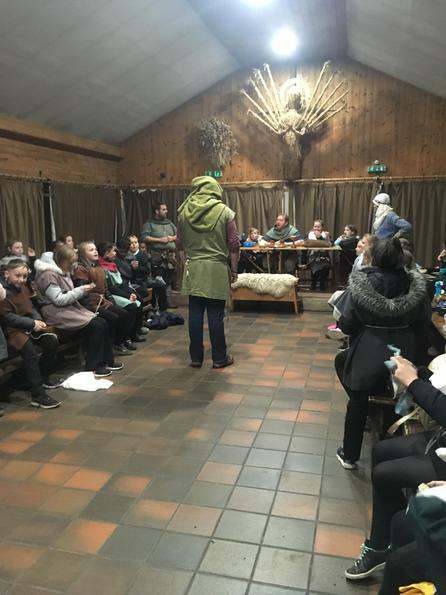 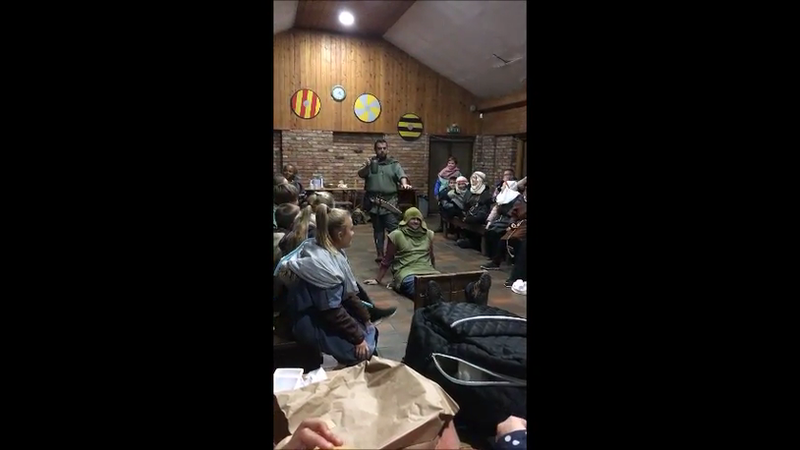 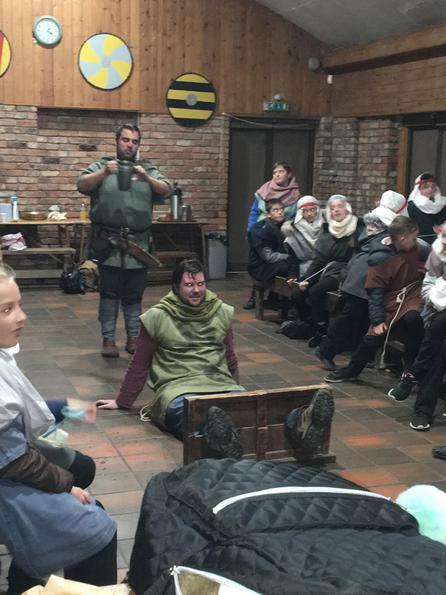 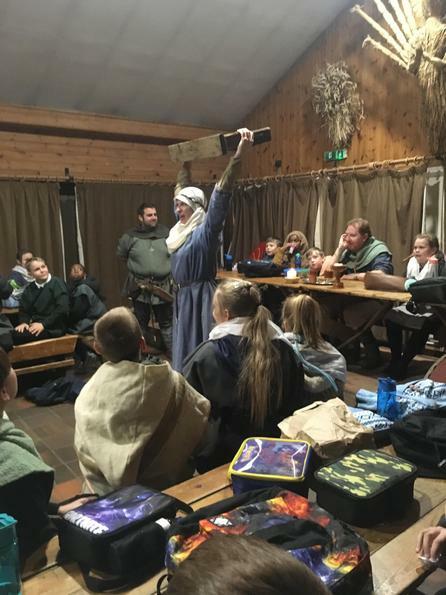 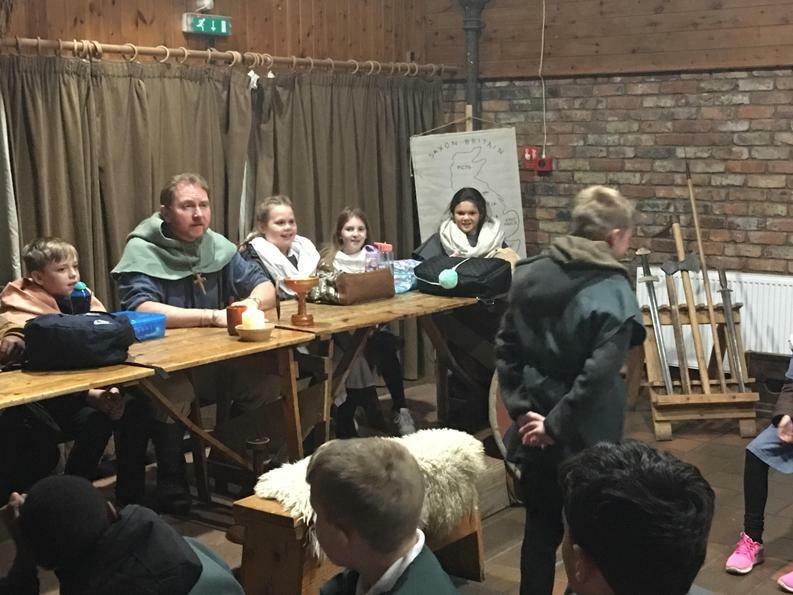 After seeing off the Mercian invasion, we all gathered in the Moot Hall before preparing to head back to school.